Fraught with peril, photos, travel tips, amazing adventures, and many cows. 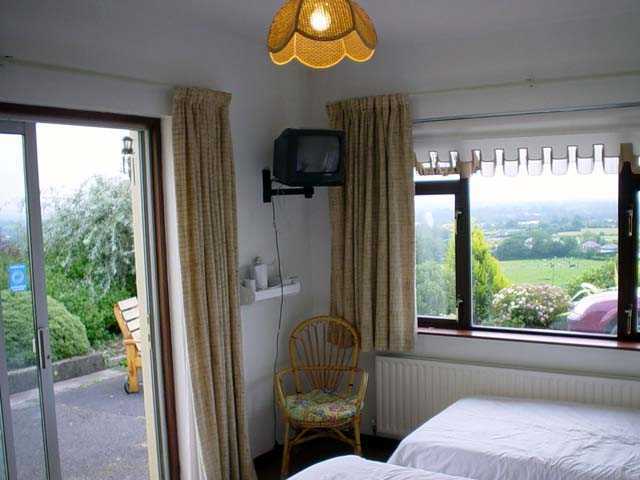 If we've given a link to a B&B, we recommend it. It should be easy to spot the ones we don't recommend. Pricing given in either US dollars or Euros depending on our whim. Exchange rate in 2002 was about 1 to 1. All images are the property of Karott.com, please respect our effort in making them available. You can purchase some of them here or contact us for usage information. View Map of Route. Clicking on a number on the map will take you to that location in the journal. We started this trip with reservations in Dublin for the first few days, in Galway for a few days and back in Dublin for the final night. The rest of the time we planned on calling ahead for a B&B reservation or just trusting to luck. 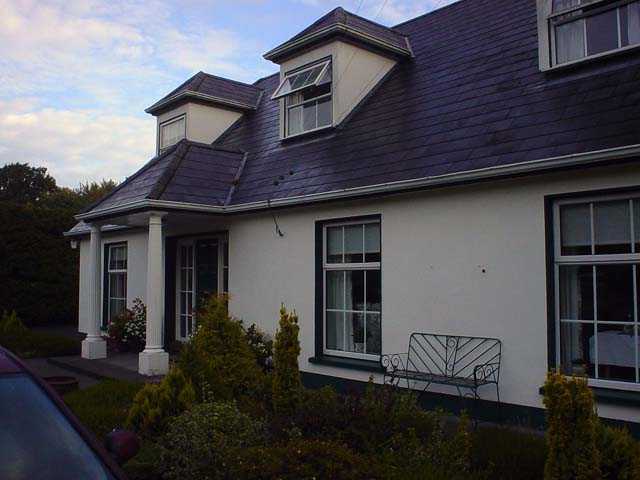 B&Bs are everywhere in Ireland, and chances are good you'll find one unless there is a special event. We never had a problem and probably could have not made the reservation in Galway, but were playing it safe as the Oyster Festival was happening while we were there. The reservations when you arrive and depart are good for peace of mind and lower stress. Got in at 2:30pm local time after a long plane trip from Portland, OR. Sat on the tarmac for about an hour or more with no bathroom break. Got some good travel advice from a nearby passenger who recommended the Wicklow area highly. Made a mad dash through the airport for a restroom. Nothing until you reach the baggage area. Collected bags and picked up rental car after VERY long walk to car park (w/bags). Note: Don't be cheap, rent a cart for a Euro or two, you'll thank yourself later. Harrowing drive on "wrong side" of street after picking up our car. Couldn't get the car into reverse for 5 minutes when trying to turn around to go back to the turnout we missed. Turns out there was a little sleeve on the column that had to be pulled up to go into reverse. Not intuitive! The owners manual in the glove compartment was for a automatic, we had a manual. Note: Rent your car online prior to leaving, it is cheaper and easier. Get a manual if you can drive one, they are a lot cheaper than an automatic. 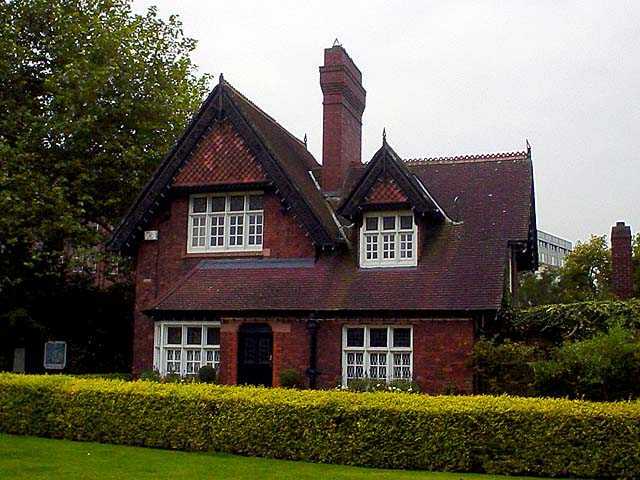 Reached Avoca House B&B in Drumcondra (between the airport and Dublin). Host Jack met us and took us to very nice room with high ceilings, wood floors and well lit (1 double bed and 1 Single & bathroom with tiny shower). Note: Irish bathrooms are usually small, tiled in very colorful/interesting tiles and did I mention small? Be a good traveler and have your own wash cloth and hand towel. Hairdryer may or may not be available. It's easier to buy one there and travel with it then worry about adapters and compatibility. You'll make an enemy of your host very quickly by plugging a 110 hairdryer in a 220 outlet. Jack gave us instructions to the nearest pub for some food and relaxation. Fagans was just down on main road and around the corner. Walked there about 5:00pm and had dinner (very good) and a Guinness. Nice, family friendly, not smoky with high ceilings, greenery and lots of brick and wood. Varied menu that has continued to improve. They pour a good pint as well. Walked back and "fell" into bed about 6:15pm and slept until 3:30am - awake for 1.5 hours. It took a couple of days to adjust to the time difference. Got up at 8:00am for a shower and breakfast. Breakfast was full Irish - lots of food, "rashers" (bacon to us, but better) and sausages were delicious! Karen didn't care for the black and white pudding, but Scott liked it and had double rations for the rest of the trip. The white pudding similar to sausage, while the black pudding has a much more iron type flavor. Barry's Gold Tea is quite good although we needed the coffee kick and had a cup or two of Bewley's. Met a couple with two girls from Australia on a six week holiday and had a good chat after breakfast. Off on #11 bus to Dublin City Center about 11:15am. 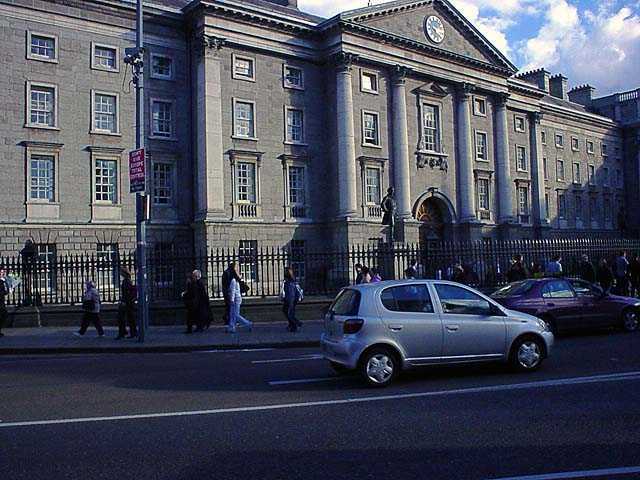 Got off bus on O'Connell street past the bridge, wandered over to Trinity College. Took tour of Book of Kells. Quite impressive setup with videos of how it was created as well as samples of work, then looked at the three ancient manuscripts; Book of Durrow, Book of Armagit, Book of Kells. Went upstairs afterwards to the Trinity College library. Scott had to be restrained from hopping the barrier and leafing through the shelves of books. Busts of famous Irish authors are interesting as are some of the displays down the center aisle. Shopping around city - "Lush.UK" store for bath & body products. Scott had some definite impressions of Lush recorded here. Caught the bus to Jameson's Distillery, took it too far and ended up at Kilmainham Gaol. Took some pictures, but not the tour, stupid us (we went on the next trip in 2004). Got directions back to Jameson. 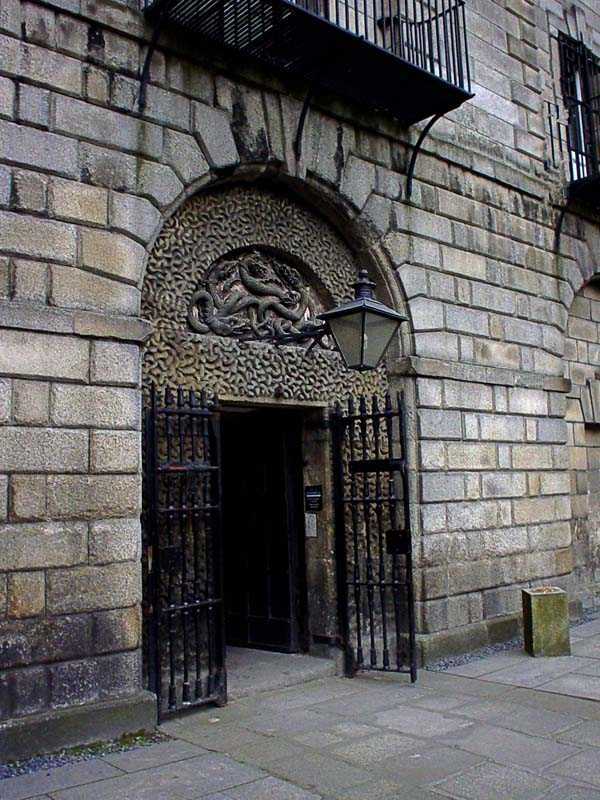 Note: Kilmainham Gaol is one of the Duchas Heritage Sites and you can purchase the pass here (see travel tips page for more info). Got off bus and walked about 3/4 miles to Jameson's Distillery and went on the tour. It was fairly interesting and smelled great! Karen was chosen to receive "special" tour tasting. Got to taste four Irish whiskeys and two others to show the differences. one American (Jim Beam) and one Scotch. 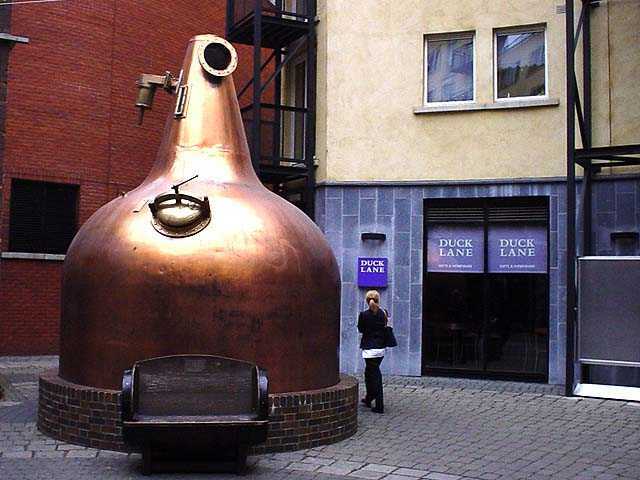 Karen picked the Powers Special Whiskey as the best. She got a diploma! Went to Distillery shop and bought some Powers Special and glasses for our "pub" at home, as well as small assorted whiskey bottles as gifts. 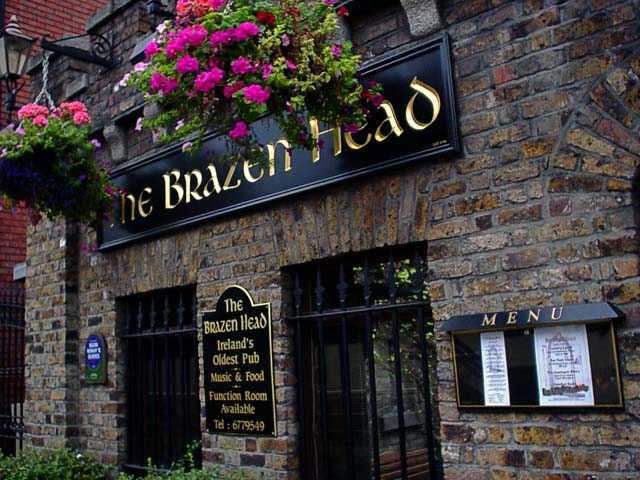 Wandered back a 1/2 mile to Brazen Head Pub (oldest in Dublin, 1198) and had a and took pictures in and around the place. Wandered around Dublin city center and Temple Bar (seemed seedy but probably better at night and under the influence). Couldn't find a empty bus so we started to walk back towards Drumcondra. Stopped at a pub (Parnell Mooney) for a rest, but did not figure out how seedy it was until two ladies of questionable reputation entered, so we shoved off. Evidently it is the premier punk pub in Dublin. Still wandered the streets of Dublin trying to find a bus. Ended up eating dinner at the Kingfisher. Scott had fried stingray (the wing part). The place was okay, but nothing to rave about (evidently one of the top 100 restaurants in Dublin, so what do we know?). Karen's club sandwich had real turkey on it, but she got heartburn anyway. We finally found a bus stop after walking over three miles. Got on the bus and it took us about 3/4 miles to our stop, we were almost there anyway. Figures! Dragged ourselves to the B&B and fell into bed - again! 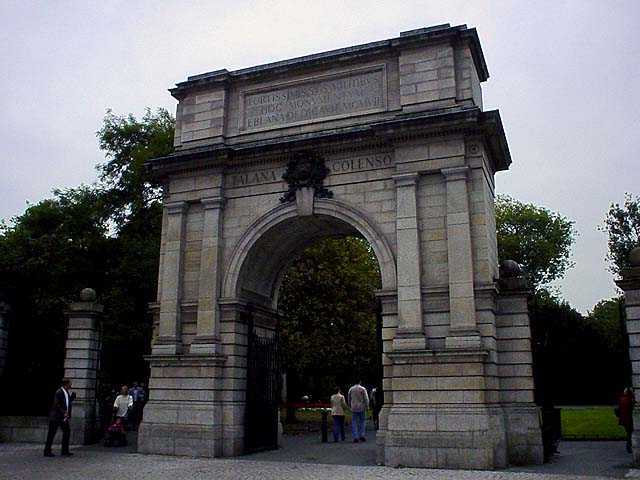 Dublin is for dreamers, artists and writers (in spite of what Mike Scott says about Dublin (lyrics) in City Full of Ghosts (Dublin)) and Scott had strange dreams during the night. Might have been the stingray? Very narrative dream involving some of the sites we'd seen, Celtic and Norse mythology, a smart aleck cat and a large clockwork object hidden underneath St. Patrick's Cathedral. It all worked out to a fairly complete story. It was all written out that morning and over the next couple of days. Perhaps we'll post it sometime. Got up at 8:00 and had another full Irish breakfast. Caught bus to town across from Fagans. Went to Central Cyber Cafe on Grafton Street to try to upload pictures, but could not get FTP to Karott.com working. Checked email, Colleen and David wrote (Scott's sister and brother). David asked if we find anything "Sheehan" to pick it up for Julie. We bought City Bus Tour tickets on the "On & Off" tour bus. 1st stop we departed on was St. Stephen's Green. Walked the entire round (1 mile) trying to find the "Blind Park" specifically designed for blind people. Never did see it, no pun intended. Lots of interesting statuary, architecture and people in and around the green. 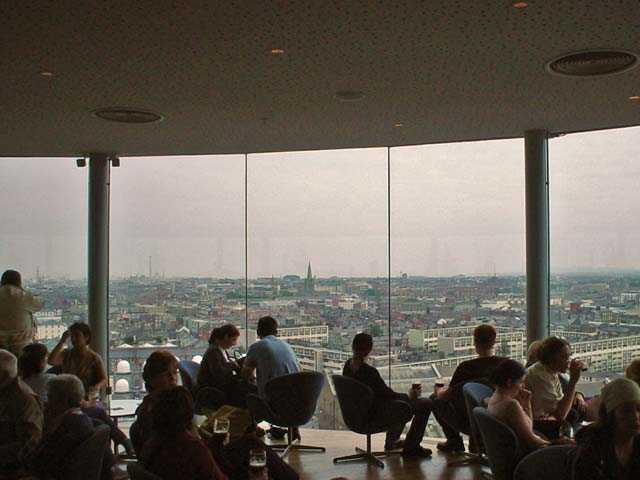 This would be a good place to hang out for a day and read Ulysses if the weather was good. Headed back to bus stop to rejoin tour. Took a few pictures of Georgian doors across from the green. Rejoined passing tour bus and were left off in Dublin city center (across from Trinity College). Saw a wee man playing the bodhran (Irish drum) on the statue of Molly Malone. 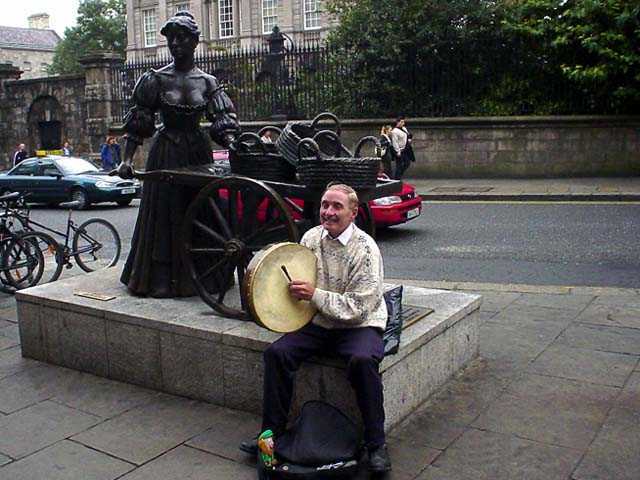 He saw us looking at him and pointing the camera and came over to us saying he'd get out of the way so we could photograph the statue and it won't cost ya nuttin' Karen told him she'd rather have a photo of him with the statue playing the bodhran. So he sat back down, played - smiled for the camera. We contributed anyway. Next stop on tour was St. Patrick's Cathedral. Went in the front door, paid fee (very inexpensive), and OH MY what a gorgeous cathedral! They permitted pictures (you need a tripod or monopod as the light is very low), so we wandered all the way around and took lots. Bought a holy card and holy medal of St. Patrick in the gift shop. Walked around the entire large city block complex to the back side, took more pictures. Bathroom is the "Black Door" across the street from main entrance. Not really labeled, clean or large, but functional. Rejoined passing tour bus and we're off. Took the self guided tour, it is quite expensive, but they try to placate you with a "free" pint in the Gravity Bar at the conclusion. Very high tech tour, didn't explain the process very well. Lots of electronic images and froofy stuff, but no meat or substance to it The Jameson's tour was much more charming and detailed. Went to Gravity Bar for "free" pint, they put a shamrock in the foam while pouring, how cute. The view of the City is beautiful and we took some pictures. Went to Guinness Store House and bought stuff for our future basement "pub" and for fun. Walked a long way back to another bus to finish tour and ended up on a "Crafter's" street, nothing interesting, expensive tourist stuff. Bought Jameson's toffees from Butler's Candy Store for our friends the Butlers. Went in search of dinner. Tried O'Neills, very picturesque but too hot, smoky, crowded and expensive. Took pictures of the Parnell Monument. Caught bus back to Drumcondra (past the inauspicious Parnell Mooney pub). Ate at Fagans and played cribbage with Guinness cards , keeping score on a piece of paper bag. Dinner was good, inexpensive, lots of food, too much actually. Walked through the park across the street. Lovely with river running through it. Got back to the B&B about 7:30pm, went to room for the night. Got up at 7:15am and breakfast at 8:30am. Full Irish again and good as ever. Audrey, our hostess, took us outside to pet Mandie the pom (dog), Audrey was sneaking a cigarette and started talking - and talking, very interesting and entertaining! What a hoot! Showed her pictures of Oregon and talked about her vacations and where she goes. Asked her advise on getting a room for one night throughout Ireland, and how to be not too "American". This is in the hopes of being inoffensive guests. This is when we received the wash cloth advise. Fortunately we had our own. Started driving out of Dublin towards Wicklow at 11:15am. Hot, sunny weather and Scott worked hard and did a great job navigating the car through traffic, roundabouts and tiny little roads, narrow enough for one car (according to Karen), but had fast traffic in both directions. We stopped in Dalkey for drinks of lemonade and orange beverage probably Club soda, very tasty! Drove for a couple of hours on narrow country roads and went approximately 30 miles. How sad. 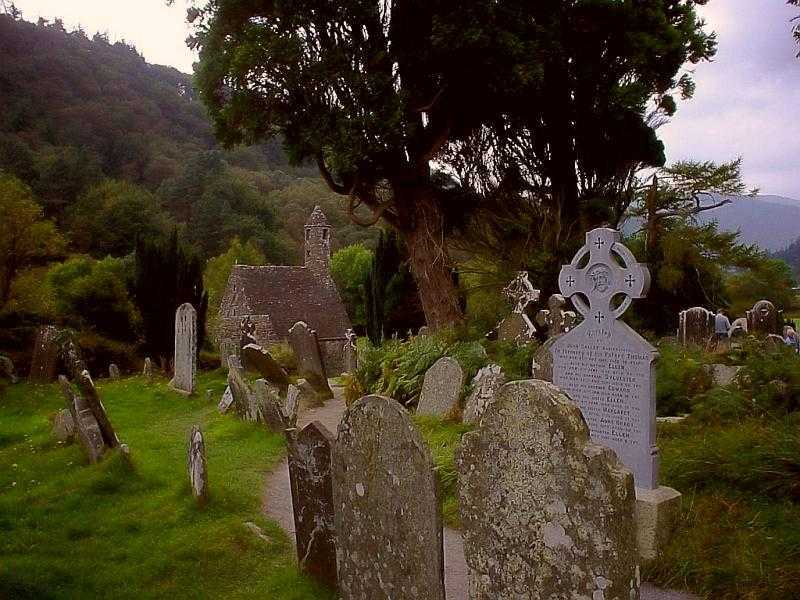 Stopped at Glendalough and toured grounds, graveyard and ruins of monastery. Beautiful site, gorgeous surroundings and wonderful ruins! Took lots of pictures. We did not take the walk up to the upper lake and St. Kevin's Cell, that was saved for another trip. This is another Duchas Heritage site. I believe we tried to purchase a pass here, but they were out of them. We were told we could go ahead and go on the tour for no cost as we were going to purchase the cards somewhere else anyway. Gotta' love that attitude and trust, we ran into it all over Ireland (yes we did purchase the pass later). Wandered back out to main road and from Arklow, Co. Wicklow, called the next B&B in Wexford. 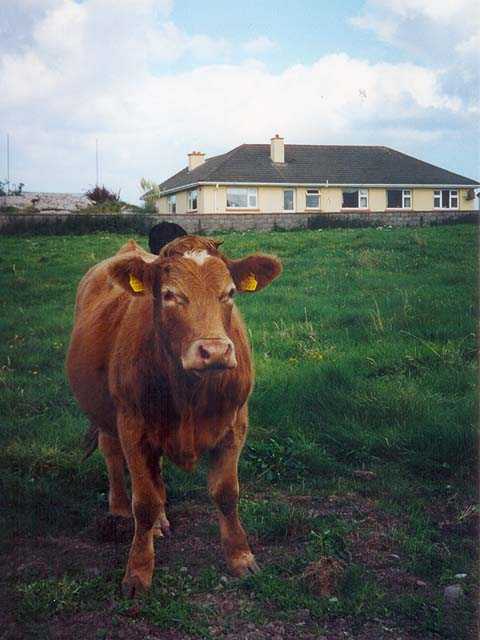 We had a book we'd picked up somewhere of farmhouse B&Bs in Ireland. Arrived at the farmhouse B&B (Woodland House) at the middle of a narrow road in the middle of the country. (what else did you expect from a farmhouse?) Philomena the hostess was a little apprehensive and asked if we were Americans. Scott replied "Guilty" Evidently we didn't sound American when we'd called. She let us in anyway. 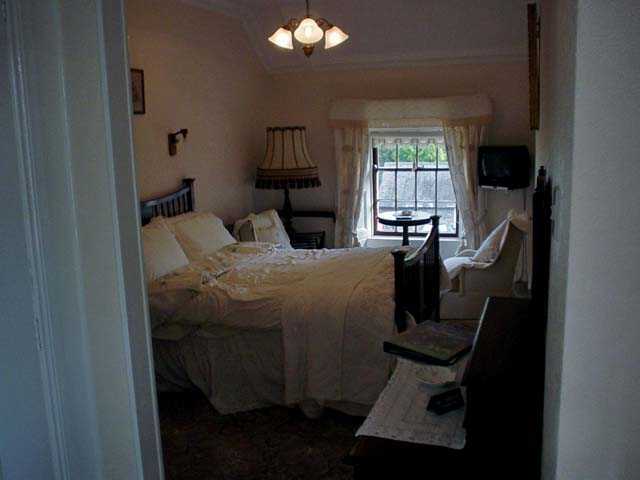 She showed us a room with a double bed, very large and beautiful with a nice bathroom. She then showed us an "upgrade" room with a huge bed and balcony overlooking the garden. Karen asked the price for the rooms and we decided on the first. Cheap Americans! We brought up our bags, had tea, met another couple from Sommerset, England by way of Wales. She reminded me of a chirping bird. 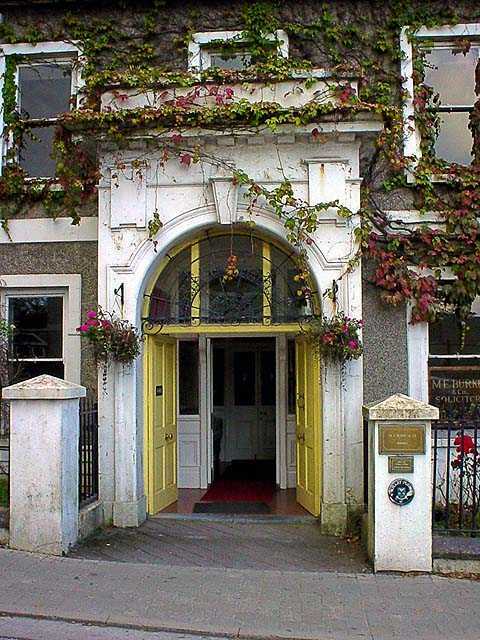 We took off and had an average meal at Pooles Porter House in Gorey. The wasn't the same as in Dublin. A charcoal flavor aftertaste. Somewhat reminiscent of sucking on a briquette, perhaps a bad keg or near the bottom. Getting back to the B&B brought a rude surprise, the mattress predated the house. It was shaped something like this --__-- (see image at right). Head and feet were well supported, the middle, not so much. A fitful night of attempted sleep resulted in a late night route planning session at 3am. A magazine led us to believe there was a music festival called "Music under the Mountain" in Hollywood, Co. Wicklow. We decided to backtrack to give it a go. 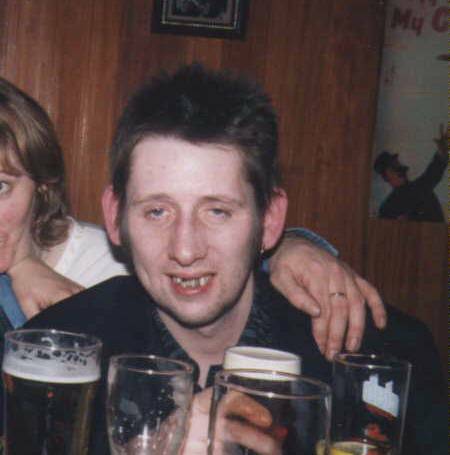 The attraction was the appearance of Shane McGowan, the man, the legend, the... well words fail me, just be careful clicking on the link, don't look directly at the picture. Overall the house was long on looks and short on comfort. It was a little overdone, and the dolls on the stairs were a little to0 precious. The breakfast was good, ordered from a menu, accompanied by old hymns and a rousing elevator version of La Bomba. Hyacinth (Philomena) walked by and said good morning without really meeting anyone's eyes and walked out. She couldn't be bothered with any of us or the money portion of the transaction. Her cat thought the same as us, as it hopped into the car and attempted to escape the "House of Froofyness" We tossed the cat out, and we were off. Took off to Killinierin down the lane to find Mort O'Sullivan, supposed to know a lot about O'Sullivan's in the area (a family name for Karen). No luck, Hyacinth's directions were suspect as was her genealogy information. Her breakfast was good, but we also suspected she thought rather well of herself and "country estate". Bought some bottled water and off again. Headed for Enniscorthy. Found a 1798 visitor center, got directions & wrong change. Another tip, count your change. Irish shopkeepers are a wee bit deficit in this department. It can't be dishonesty because the amount can be over or under. Perhaps they are still not accustomed to the Euro. Went to the Library to use internet, no card reader for the memory card. Vinegar Hill was the next stop because Karen's great-great-grandfather was born nearby. One lane road to a stone monument. (unreadable) Hiked up to the tower through the gorse bushes. Hard to imagine soldiers charging through the stuff, it is wicked, spiky stuff and head high, nice yellow flowers though. Good view, bad bee, time to go. Bee did not pursue us. Left Enescorthy for Wexford. Trying to find Killiane Castle B&B. All the way down to Rosslare, turned around and headed back, finally saw the sign and headed off a side road to the castle. Back and forth from Rosslare harbor to Castle for money and phone. Texaco phone didn't work (twice). Finally secured reservation and went to Killiane Castle B&B. 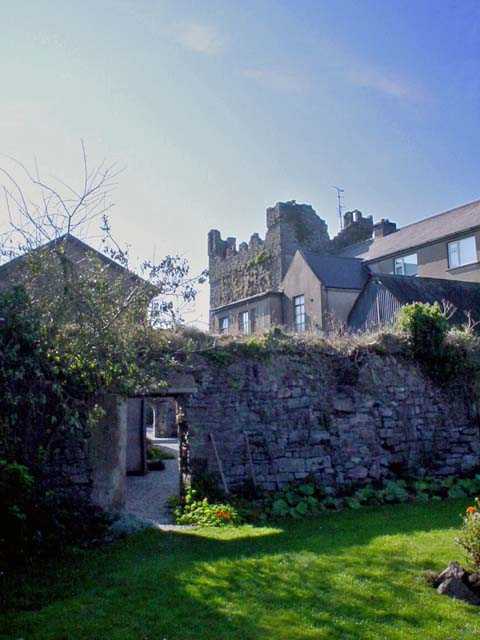 14th century castle attached to 17th century farmhouse. They also raise horses. Nice hosts, great place, took pictures around the castle and headed for Wexford town and dinner. Up, down and around Wexford in search of internet cafe and camera shop. No luck on memory card. Pretty town, very hilly. Dinner at seafood place next to "no-phone-Texaco". Back to castle to play cribbage in recliner chairs on the lawn under the trees, and watch the horses play in the meadow as the sun slowly set. Called David (Scott's brother) to gloat. Not a very long conversation as he had to go to WORK! Back to the room where Karen took advantage of the bathroom, tub and a Lush bath fizzy. Evidently the aroma attracts bugs as well, because Scott had to terminate a rather large wasp who came in through the open window. Much insect troubles today. Excitement over, and off to bed. Had a great breakfast at Castle B&B (French pancakes and eggs with salmon). Left to drive thru to Hollywood for the Music Under the Mountain festival. 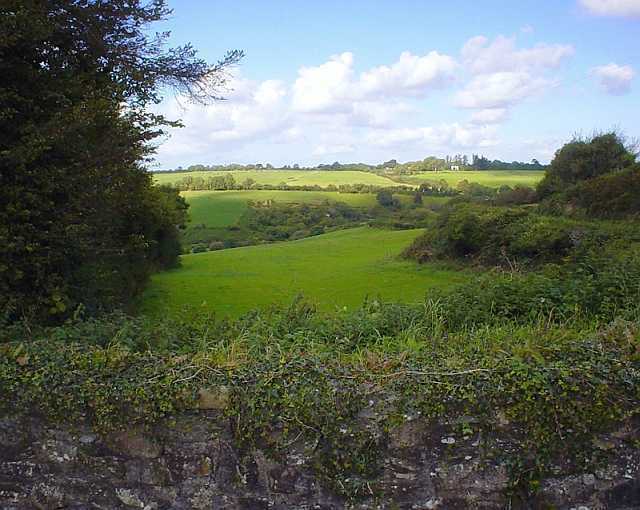 Took many roadside pictures of farmland and valley in Carlow and Wicklow. Baltinglass Abbey was just on the other side of the stream along the road. Very large, partially restored abbey with full arches. Lots of pictures. It came up on us as a surprise, no signs, just off the road. Teenage boys and girls were in the back of the ruins smoking and chatting each other up and possibly snogging. Got to Hollywood, stopped at the Hollywood Inn where the Music Under the Mountain festival was to occur that evening. Parked in front, and went in to enquire and have a pint. Confirmed the festival was happening. The large banner in front was a good tip off as were the flyers on every post and wall. Drove into Blessington (14k away) to find a phone to call for a B&B. Also visited an Internet Cafe (just opened that day) with a very young owner who was kind enough to take the time to help us take the photos off the memory stick and burn them onto CD. He only charged us $5! We wish him and his new venture the very best of luck. Found the Chestnut House B&B, hostess Agnus really was very warm and accommodating. House was spare in decor but room was more than adequate in size of both bed and bath. What a view out onto a meadow of sheep! Off to dinner at The Thatch in Ballymore Eustace. Limited menu and unimpressive. A burger for Karen and drab curry for Scott. More Guinness research (still good). The waiter sang along to MTV on the telly. Between the bellowing he worked a wee bit. Later the singing became a lengthy discussion with a customer swearing with every other word. We took our leave. Off to Hollywood Inn and the Music Under the Mountain festival. The Kane Sisters came in shortly after us. After a game or two of cribbage, we looked forward to the 8:30 start (as posted everywhere around the place). We sat in the pub close to the door out to the tented music area. 9pm rolled around then 9:30, cigarette smoke building. The Kane Sisters walked out, we waited, no music (sound checks galore). No Shane McGowan, more Guinness, more smoke. Inquired as to the actual start time, any minute we were told, would you like to pay and come into the tented area? We'll wait until some actual music starts we thought. At 9:50pm we had our fill of second hand Irish smoke and decided that $30 was to much to pay for an alleged music festival. We left without hearing any music. For a more detailed account visit here. We went down the lane and snuck into a graveyard and took pictures under the full moon. Cheaper and more memorable (less smoky too). Went to bed and watched part of a very bad film with Gerard Depardieu. Awoke at 7:15 - Breakfast at 8:30, full Irish sans the black and white pudding (Scott was sad). Very good altogether in spite of the missing pudding, and the hostess very friendly, twittering about clearings, cleaning and chatting as we ate. Started out heading back to Ballymore Eustace to try and find picturesque hayfield we'd seen the day before so we could take some pictures in the morning light. Could not get any without wires and power towers. Found a glen overlooking a lake with sheep dotting the landscape. Parked and walked 1/4 mile along the road back to glen to take pictures. Drove down a "yellow" road toward Dunlavin until halfway down the road it abruptly ended with road signs to go the other way. Took another "yellow" road through Dunlavin and eventually into Kilkenny. Created a new term for tailgaters - bum-crawlers! 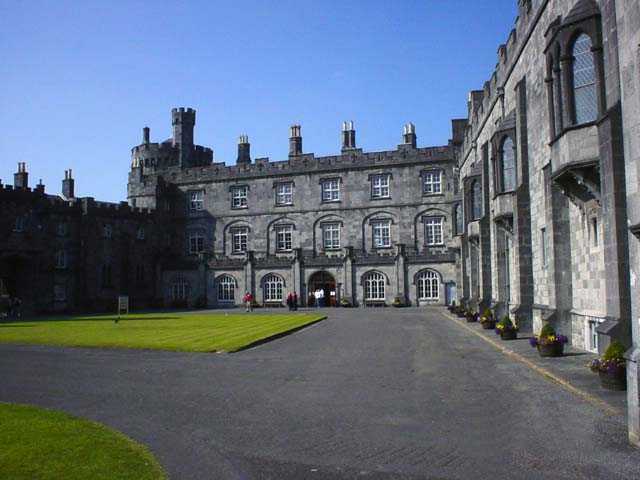 Got into Kilkenny, parked across from St. Kieran's College at top of town and walked back into the city center. Stopped at first roundabout in an Internet cafe to upload picture to website. Took a look at the outside of Kilkenny Castle. Wanted to much to get in and couldn't bring pack into castle. Nice exterior, kept going. Went looking for St. Someone's ruined stone building (St. Canice). Went up John St. Wrong street, back down. Bought sandwiches and up to High St. Saw the outside of the church. Climbed the Round Tower, 110 very narrow steps. Great view from the top! Ran into Black Abbey as we were returning to city center. It was FREE! 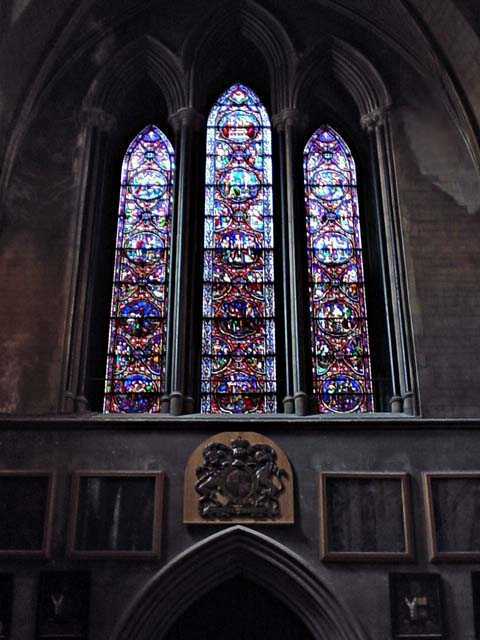 Great stained glass and carvings of the Trinity. Church was open for worshipers and tourists. Took pictures surreptitiously trying not to disturb anyone (bad us). Back to the car, we found it! Left Kilkenny for Cahir via Clonmel in search of laundry facilities. No laundry to be found. Went to Cahir to find a B&B. No luck, many booked already. Got a pint to contemplate the situation. Called another B&B, success! Right around the corner, up the hill ("are you writing this down Mr. Atherton," asked the hostess?) Wandered up a long hill and finally found the Hollymount House B&B (guess we should have written it down). Nice place with a great view of the city. Very nice room with a sliding glass door out to a patio with the view. Went in search of food, hostess recommend a place or two in town. Ugh, bad pseudo Italian eatery, no atmosphere, second recommendation booked solid. Went down the road a long way and back, still no luck. Chinese restaurant under construction. Scott suspect's the real reason there was a famine was lack of restaurants. Finally found a place staring us in the face (bad signage, it is either none or poor visibility). Food was decent but bland. Steak and salmon with lots of boiled potatoes. Karen ordered a glass of wine and they brought her a small, one glass bottle with a twist top. Note: bring hot peppers, hot sauce, black pepper, and soy sauce to Ireland on next trip. Back to B&B, took some pictures of the city at night and off to bed. No bees or wasps, firm bed, Oh Joy! Good full Irish breakfast the next morning. Hostess Margerat Neville, very warm and friendly. The rashers were especially tasty. Almost hated to go, but we forged on. 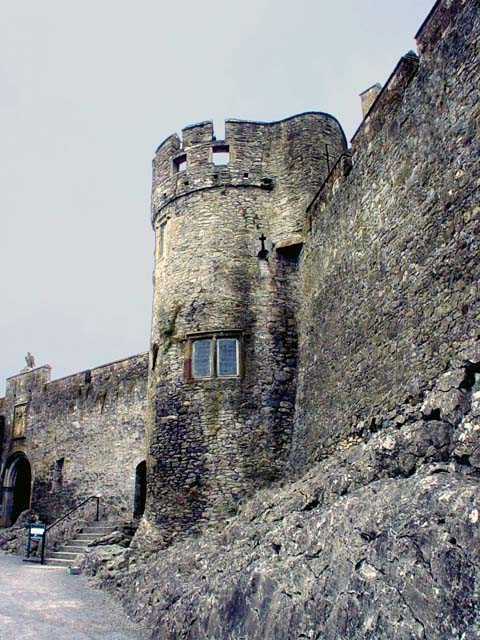 Drove into Cahir to see Cahir Castle. Nicely kept up and you could actually climb many of the staircases and the rooms were restored. Great place for pictures. Nice views of the city from castle walls. Good short presentation of the history of the castle. Found the stairs down to the "dungeon" rooms in the tower interesting. Very cold, damp and uncomfortable place to be kept. Left Cahir after a brief wander through a tacky tourist shop across the street. No need for stuffed leprechauns or shillelaghs with slightly sticky lacquered finish. Nothing awful enough as a gift for Scott's brother David. Must exceed the crassness of the wallet made of preserved frog from Mexico or the coyote skull medicine stick. The search continues. Headed off through Clonmel looking for B&W film. Went to a super market and shopped. Bought lots of drinks for the road and misc. other interesting food bits. No film. Drove to Cashel to see the Rock of Cashel. Parked in a lot down the street a long way and walked about a mile to the rock. Stopped in a store at the base and they had B&W film! Bought two rolls at an exorbitant price. Began the ascent up the Rock. Admission to the site was $4.40 each. We'd been to so many Heritage sites and figured we'd hit a few more so we bought the Duchas Heritage Passes ($20 each, senior and family passes available). We should have purchased this in Dublin and save a lot of money. You can buy the pass at any site that accepts it. We also purchased a book on the Rock of Cashel and the nearby Hore Abbey. 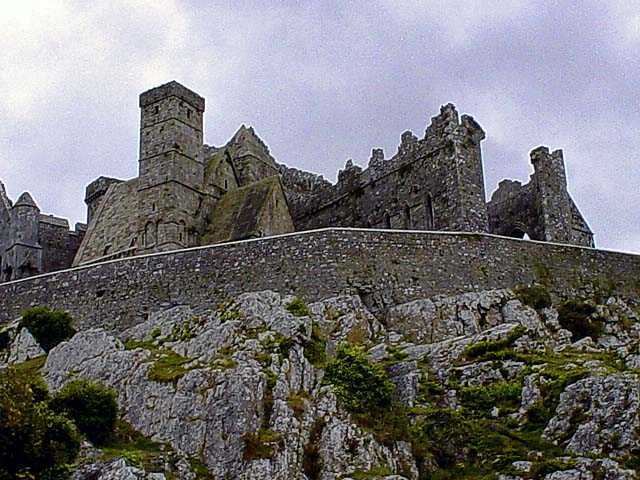 The history of the Rock of Cashel according to Scott. Some monks found a big rock, piled a lot of other rocks on and around it. 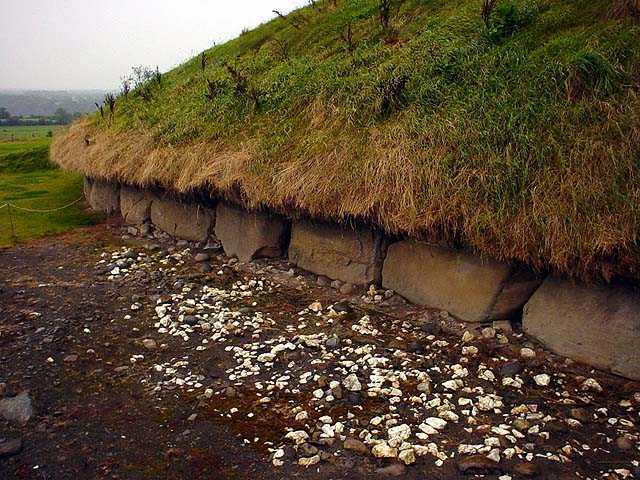 Lived there for four or five hundred years, and left when too many of the rocks fell down. It was a pretty cool pile of rocks. There is an informative talk and walk through of the site or you can wander on your own. 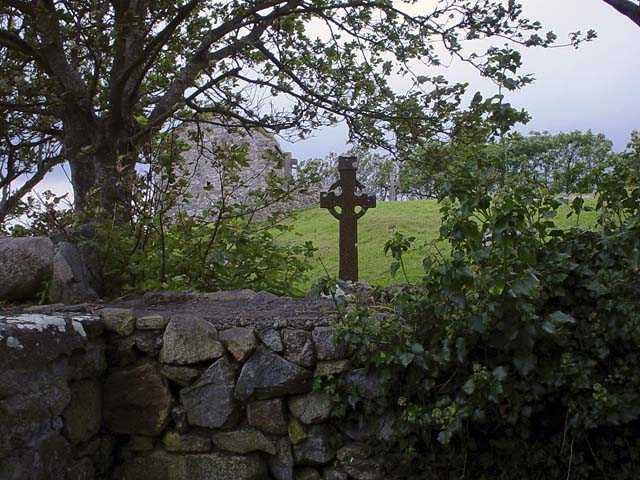 The site is surrounded by a rock wall (big surprise) with a fairly substantial graveyard. The markers are distinct and interesting. The interior has many nooks and crannies that hold good photo opportunities. Look at the details on the columns and arches. 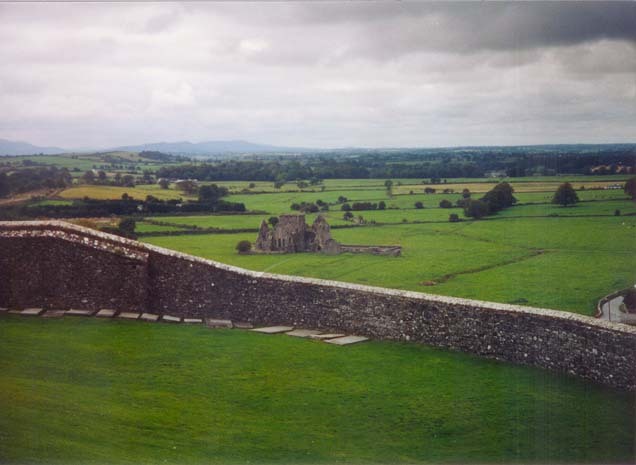 The trek down to Hore Abbey involved fence jumping and cow plop hopping and more climbing. 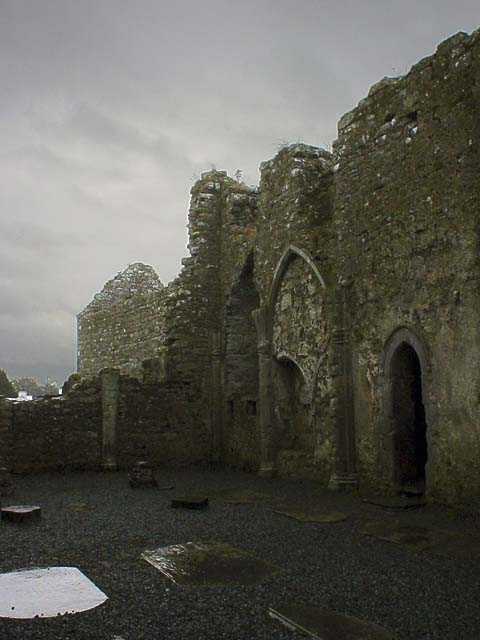 Coming out of the entrance to the Rock of Cashel, turn right and head down hill. 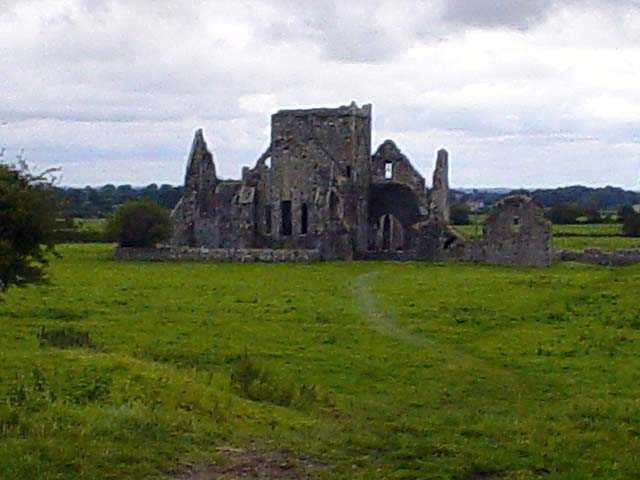 You can see Hore Abbey at the bottom across the field. 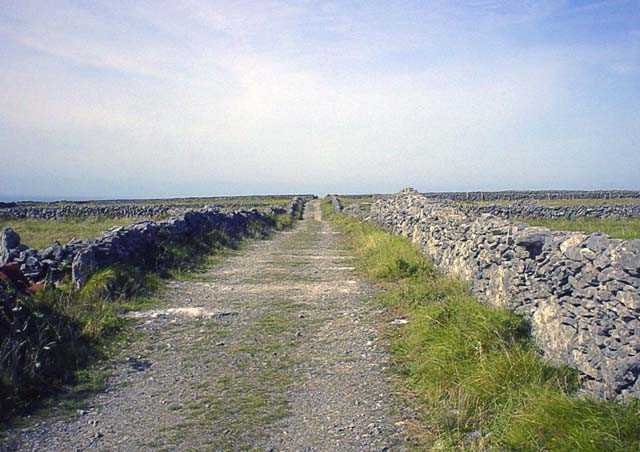 Cross the road and look for a path over the stone wall. Watch for cow droppings and the possibility of a bull in the field. We found Hore Abbey to be more interesting than the Rock. Very cool ruins altogether. Lots of photo opportunities. 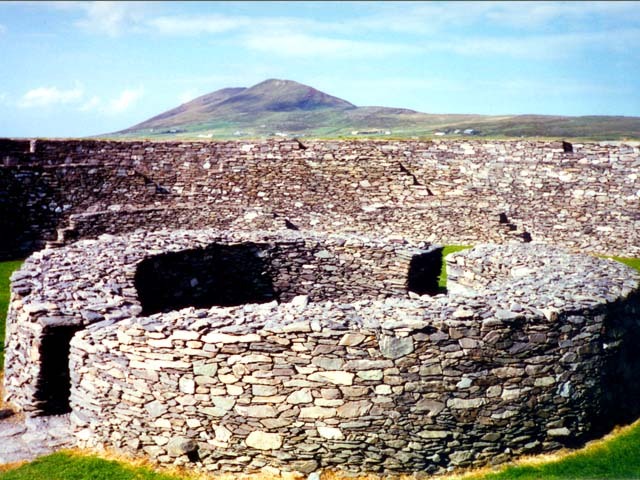 It is amazing how much time the Irish devoted to religious stone piling. 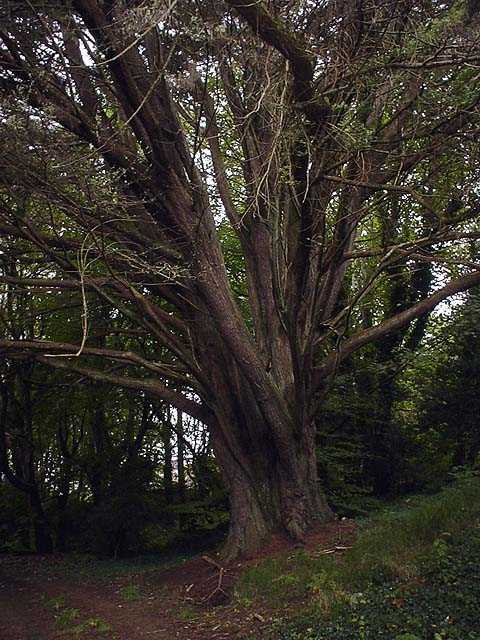 'Hore' is thought to derive from 'iubhair' - yew tree. 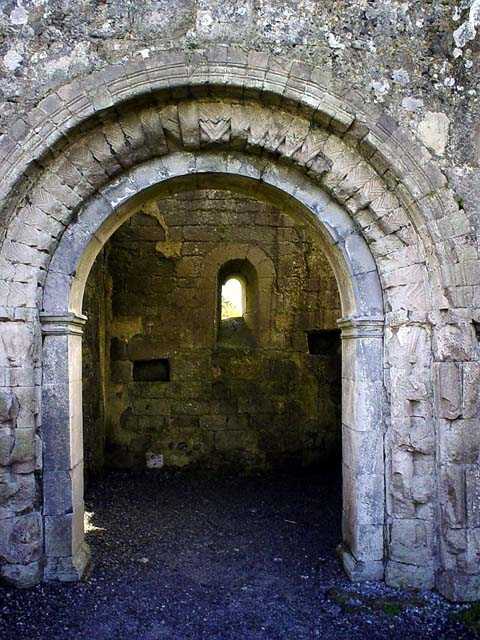 The former Benedictine abbey at Hore was given to the Cistercians by Archbishop David MacCearbhaill, who later entered the monastery. He endowed the Abbey generously with land, mills and other benefices previously belonging to the town. Left Cashel with ice cream from the little shop down the hill. Scraped the cow excrement from our shoes and headed for Mallow. Stopped in Michalstown (home of caves and cheddar) to reserve a B&B. Got one near Mallow on the first try! Celebrated with Chinese takeaway right across from the pub/undertaker (makes sense to combine them if you think about it). Note: 19 Euro buys a lot of food, enough for a small army. These are not US portions. No wonder they were looking at us strangely. Food was OK, overly sweet, lots of gloopy sauce and not the extra hot we ordered. The Irish seem to fear hot food and fear for those who order it. Ate along the road with a view of clouds, fields, and horses. Continued on to Mallow with a hay roll detour. 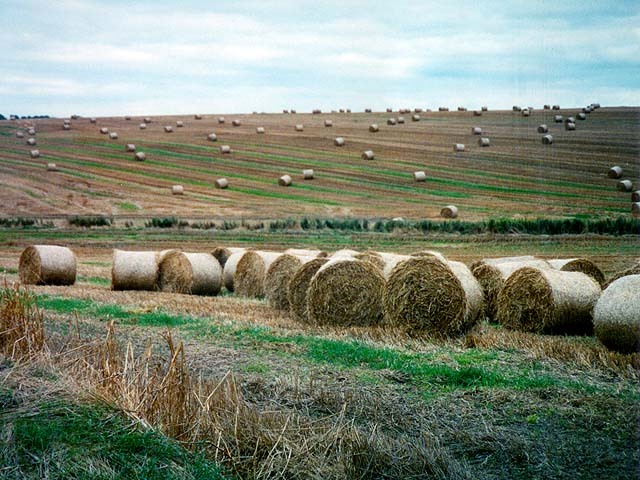 No, not that kind, it was to take pictures of a hillside covered with hay rolls. Arrived at Pathsmore House B&B. Shown to room. Scott embarked on a fly killing spree in the room. Current count is 15. Discovered open window in bathroom, looked out to stable below. No mystery as to where the flies are coming from. Closed the window as surely the cows, horses and assorted poo is the culprit. 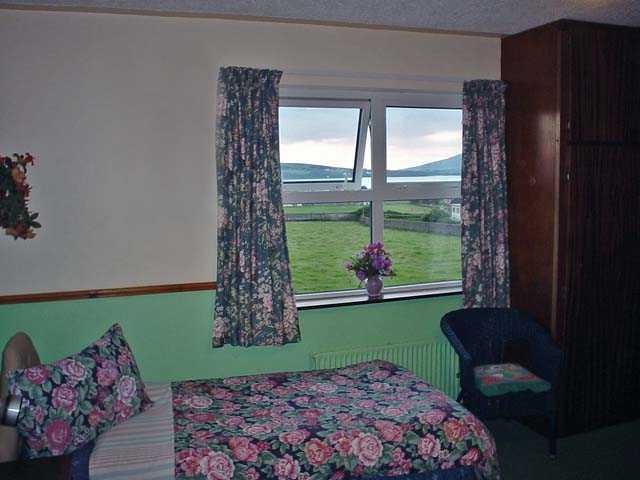 Room a bit dingy, no TV, radio or amenities except for a plug-in tea pot and some tea bags. The hostess reminded Karen of a nun/teacher she'd had in third grade. Off to the pub for more research and to look for the "marsh" in Mallow. 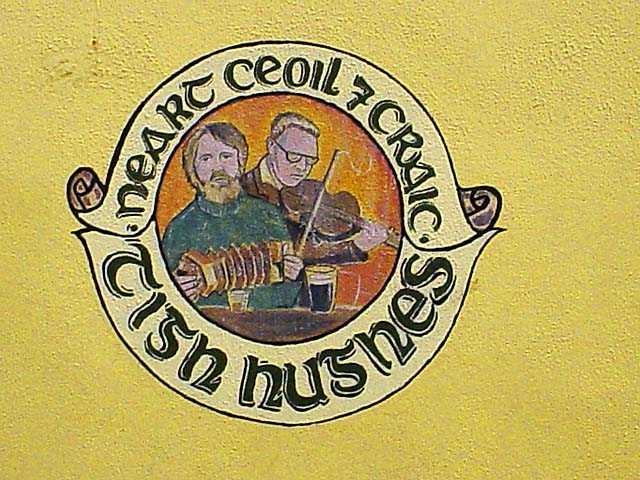 Found the Olde Fiddle Bar and settled in for a listen to another round of Irish swearing. Interesting character wandered in with some bags, ordered a large whisky, downed it and wandered out. Looked like the wife had sent him out for a few items and he'd taken the opportunity for a quick one. Breakfast uninspiring, full Irish but nothing exciting. Perhaps the flies in the room took the charm off. Bacon slightly off or overly aged as well. Left B&B to do laundry in Mallow. Found a small shop across from the Olde Fiddle Bar. A few battered machines, but all to ourselves. Played some cribbage on the wood bench while waiting for the clothes to finish. Scott wandered up the street looking for snacks and had to settle for crisps and candy in a small shop. Laundry finished, folded and packed, so off again. Took N20 out to Cork. Just off highway was a ruined something visible in the distance. A road sign said Mourne Abbey, so off we trekked to find it. Came to the first split in the road, no directions. Chose left and went a few miles, could see the abbey through the trees and hedgerow, but it seemed to be getting further away. Beautiful country around there as you can see. Turned around and went the other way at the split. We definitely had to travel on "black" roads to get there, very bumpy. 30 minutes later, much winding around we ended up at a farm. Brazenly we drove through an open gate and parked. Stepped out and over the electric fence lying on the ground buzzing and popping. Great view of the valley below with sun shining, very blue skies and fluffy white clouds. Lots of adventures roaming around what was left of the ruins. Cows were sheltering in part of the walls. 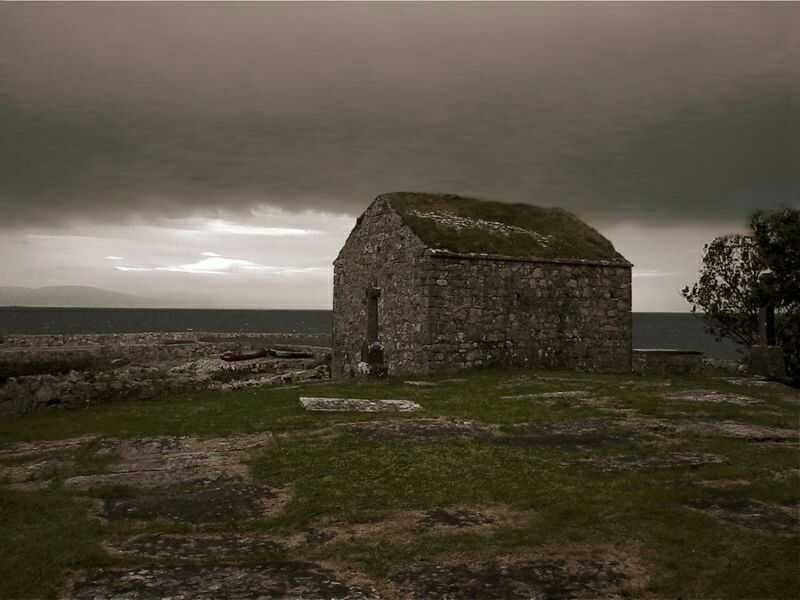 It appears that this is not Mourne Abbey, that is elsewhere in the area. We've been kindly informed by a reader that this looks more like Barrett's Castle also known as Castle More. There don't appear to be any other pictures of it on the web. 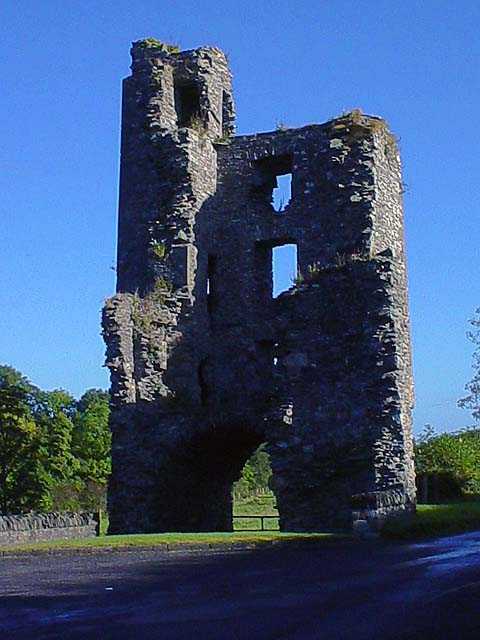 According to the info about the castle it is a 13th century hall-tower on the site of an earlier enclosure castle. 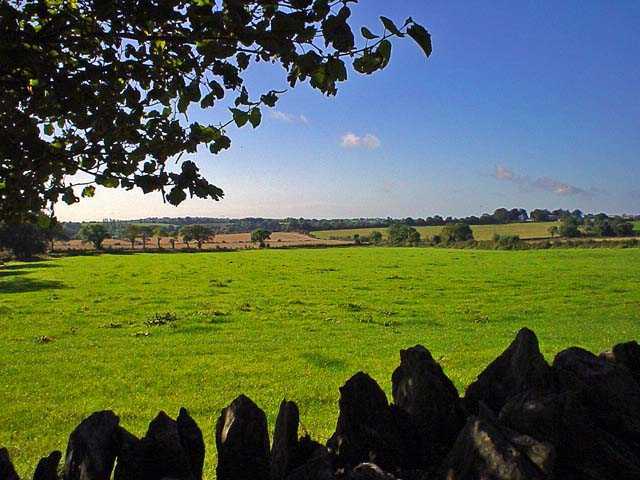 The official location is about four miles south of Mallow off N20. 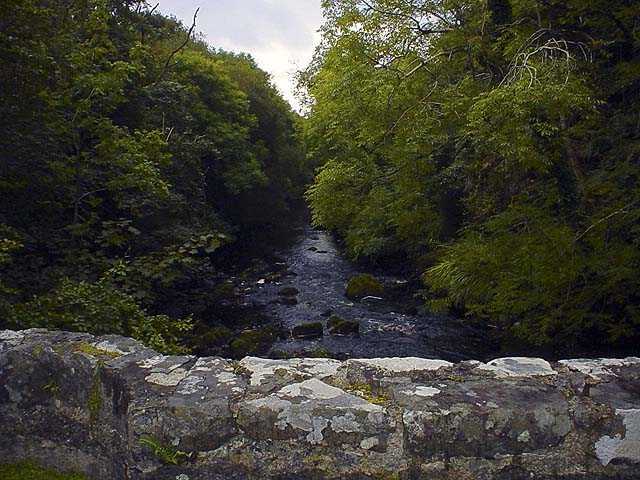 Situated on the commanding high elevation above the River Clyda. 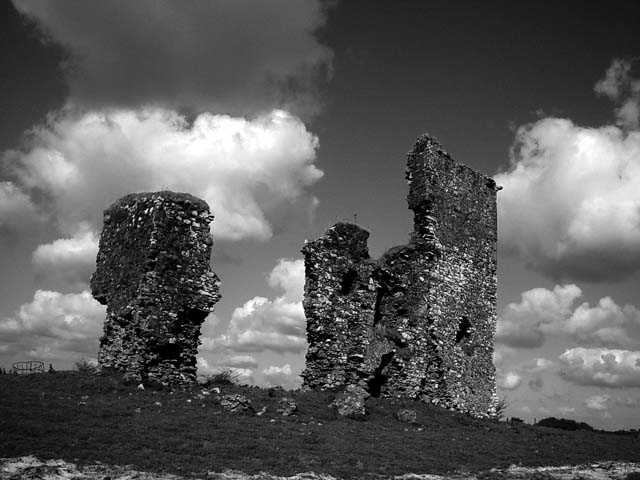 The walls are still standing, but from the manner in which they were built and the decayed condition of the building, it would seem that the castle was erected at a very early date. Possibly it’s the ruins of a 13th century hall-tower on the site of an earlier enclosure castle. 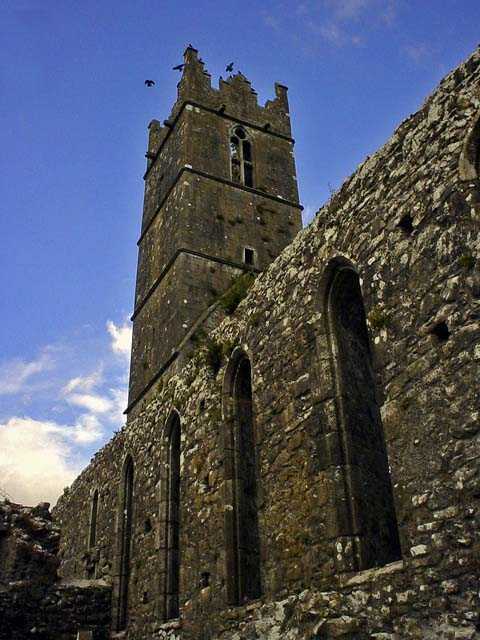 The first of the Barrett family is said to have come to Ireland with Strongbow about the end of the 12th century. We guess that another attempt to find Mourne Abbey is in order next time around. 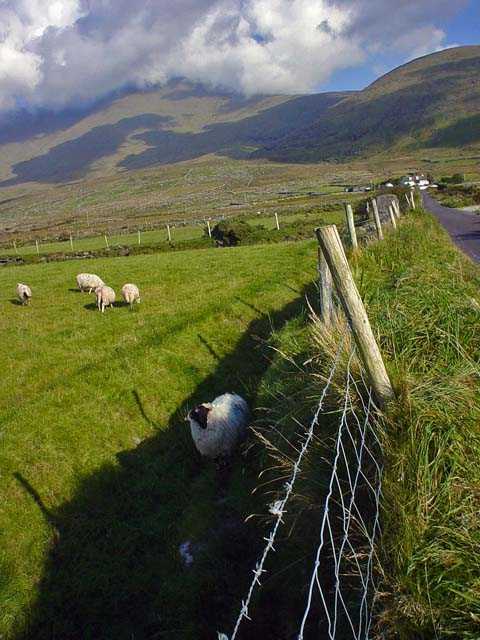 Traveled on towards Killorglin to the start/stop of the Ring of Kerry to travel the ring the next day. 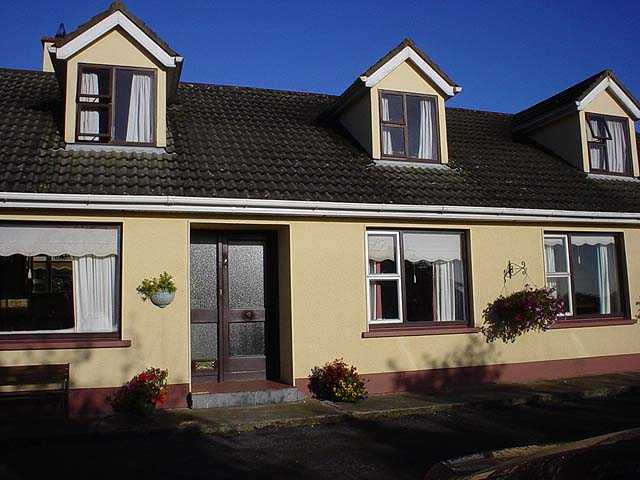 Called the Dungeel farmhouse B&B from Macroom. 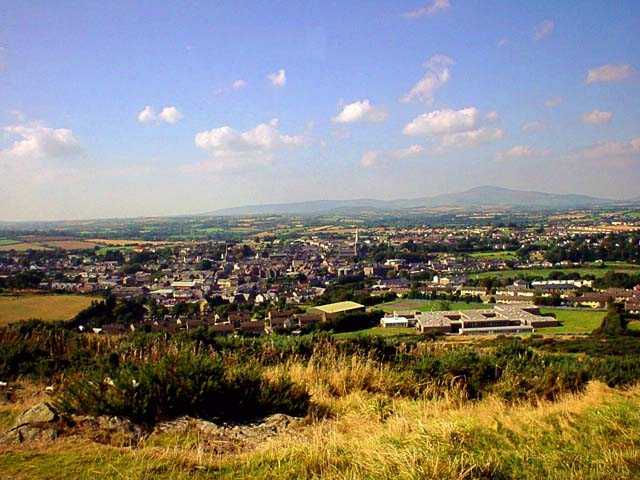 Macroom was, in Scott's memory, a place where there was a stone circle, none found though. Looked like a nice town. We'll have to go back sometime. Stopped in Cork to try to find an Internet cafe to dump the memory card to CD, buy B&W film and get lunch. Had a difficult time finding any one to help with the memory card. Either the technology is new or Sony memory cards are to proprietary. Good thing it is a borrowed camera. People were very friendly and helpful (as they could be anyway). 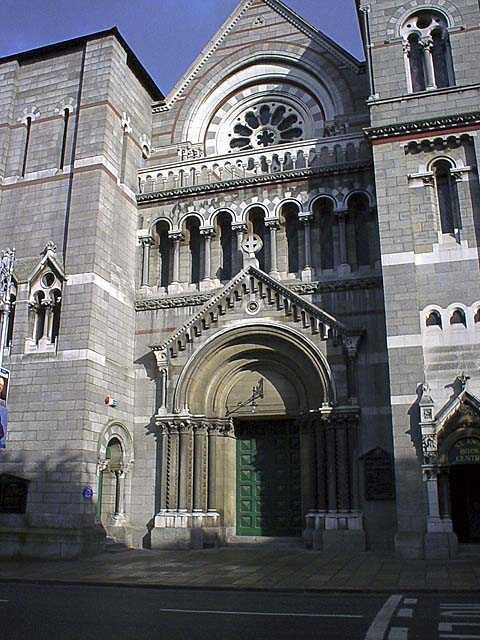 Wandered around Cork a bit, enjoyed the town, made note to come back another time when we had more time. Headed off to the Dungeel Farmhouse. It was 4km outside of Killorglin, about the time we thought to look, there it was. Old white farmhouse on a hill with sheep in the meadow in front. 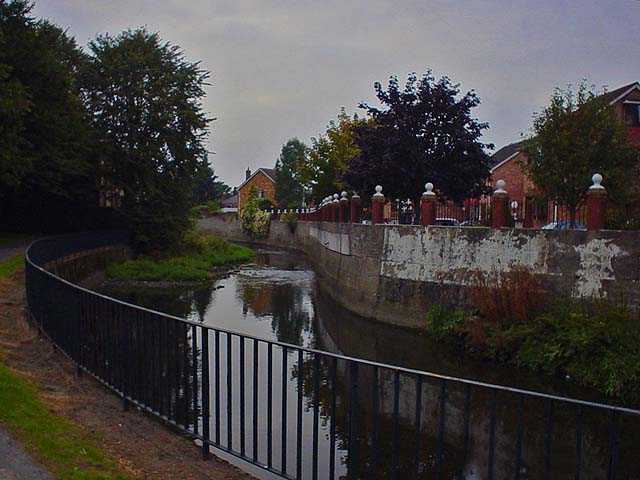 It overlooked a private section of the river Laune, a salmon infested area according to the two French gentleman who had been coming there for 28 years for the fishing. Nice room, but a bit damp and mildewed smelling. Not unexpected in an old stone building. 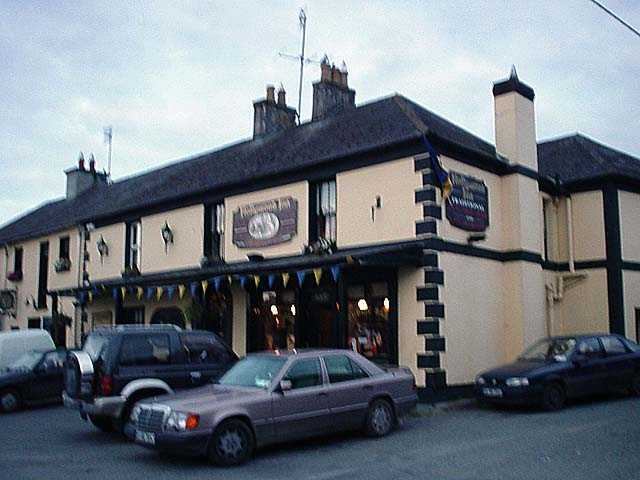 Had dinner in a pub in Killorglin. 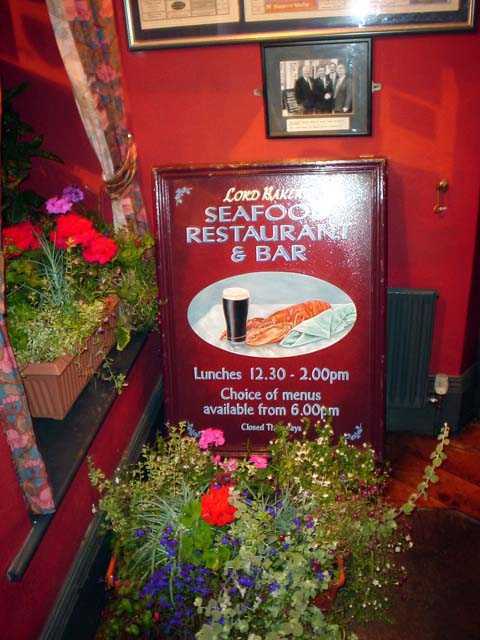 Nice ambiance, good food, Irish stew and smoked salmon. Admired the Puck statue commemorating the story that a stampeding herd of mountain goats warned the locals of the invasion by the Cromwellian forces. The Puck Fair is an annual and popular event. 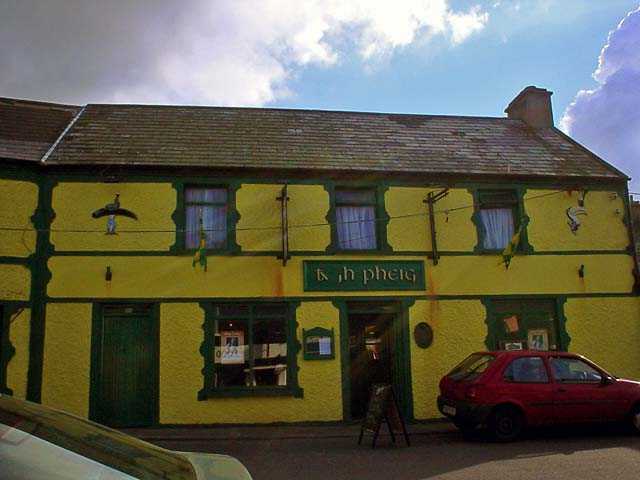 Purchased a Co. Kerry flag in a shop. Breakfast was good, talked to an Aussie couple about their stay in Milton Keynes and daughter's stay in France. Met Charley and the rest of the folks/host/hostess/family. He told us about going to town with four and three in his pocket and if he met the queen he wouldn't give her a glance. Took two rabbits to town for extra money. Had three pints, took a girl for a dance and dinner with the money. What a character, told other stories of growing up in the area as well. Left B&B at 10:30am to start on the Ring of Kerry circuit. What a magnificent drive and view. No particular problems with the traffic or tour buses. Just drive smart and stay calm and you'll be fine. We pulled into a little town called Cahirciveen and wandered down some side streets in search of a restroom. 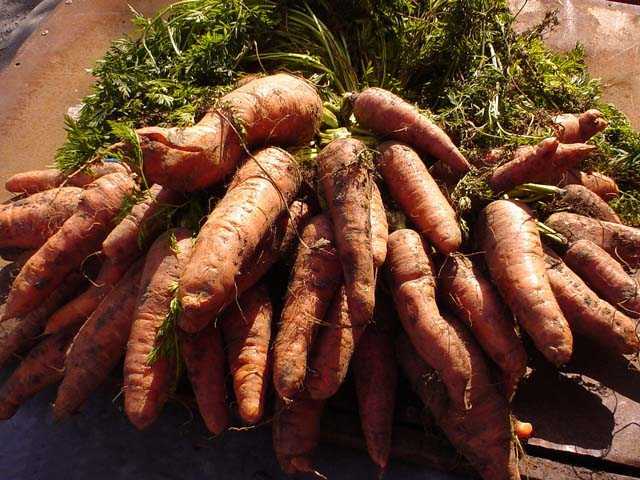 While Karen checked out the facilities, Scott took the picture of the carrots at a small market. They were really as big and orange as the picture shows. We're sure they tasted as good as they looked. 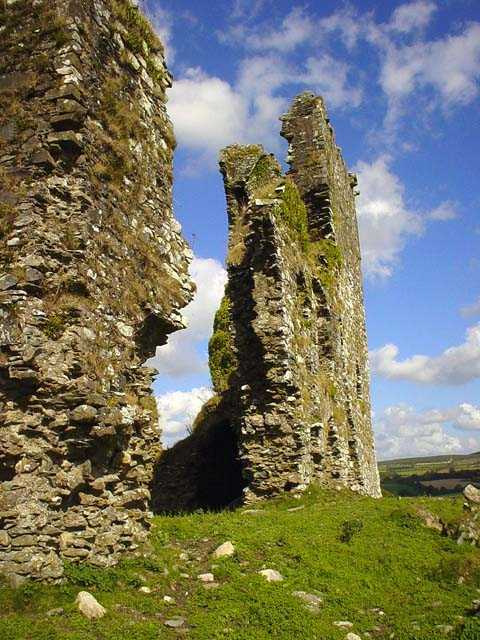 Just off the route we discovered Ballycarbery Castle and the Cahergal stone fort in Cahirciveen. Karen stayed in the car at the stone fort. Scott walked up the hill and to the entrance. 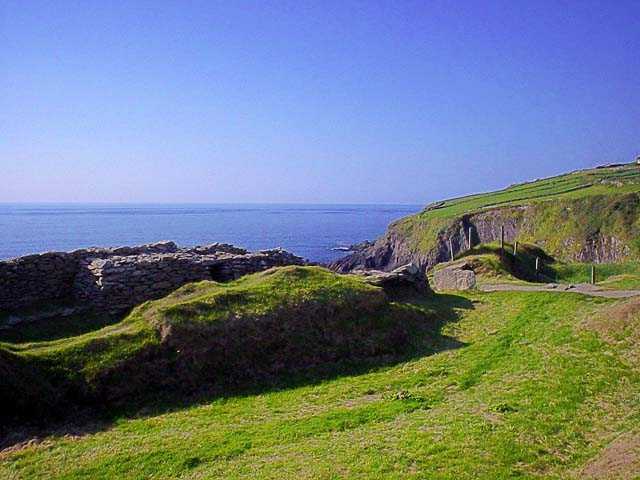 Ballycarbery Castle was easily visible. The fort was almost perfectly round with inside stairs to the top of a 5-6 foot wide wall. 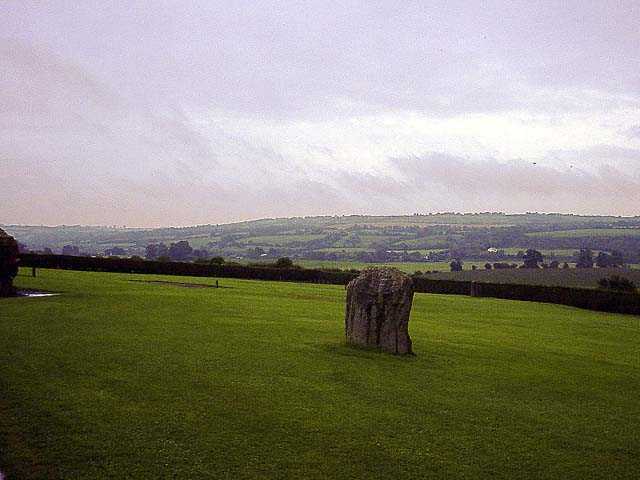 There was an inner stone circle with a much lower wall shown in the picture to the left. It is amazing how well the stones are fit together. From the top an even better view of the castle and surrounding countryside. Evidently there is another stone fort called Leachanbuile just a bit further that is even more impressive. We'll have to find that one on another trip. We then drove a short distance to Ballycarbery Castle, parked and hopped over the electric fence after petting some cow noses. Again a trek through cow poo to the castle. You can climb up and over much of the castle. 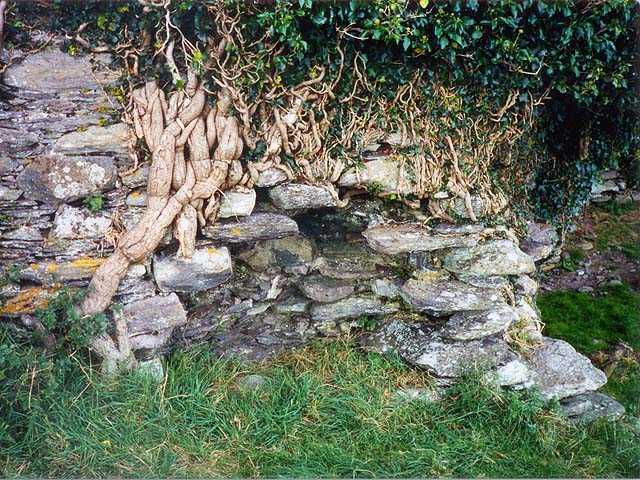 Lots of ivy and plants growing in and amongst the rock. 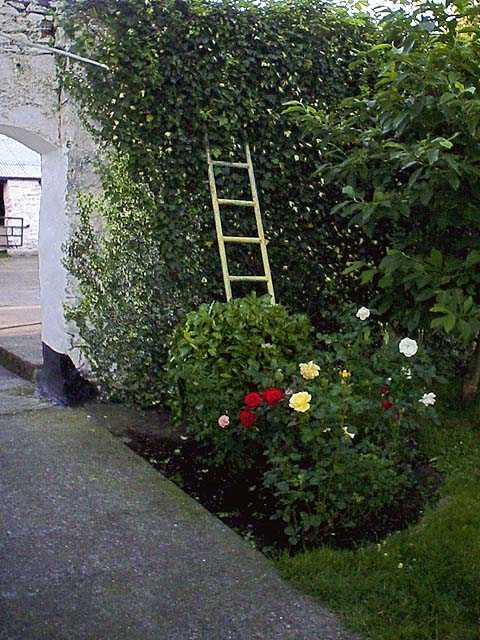 The wall at the right was covered in ivy and had been for a good many years as indicated by the size of the trunk on the ivy. Good photo opportunities, especially if you stayed until sunset. 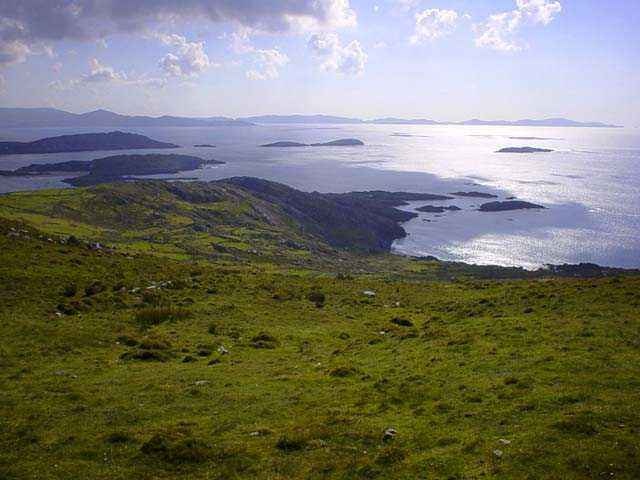 Wonderful views as we drove around the Ring of Kerry. Narrow roads and very few tour buses. We were going in the same direction as the buses although going in the opposite direction would not have been a problem. We stopped at one location with a nice view and several statues. An accordion player was entertaining the tour bus passengers. Stopped for lunch in Sneem at one of the small pubs, it could have been the Wrestler's Inn or the Blue Bull. Had roast chicken and shepherds pie and wrote a few postcards home. Headed back towards Killarney and took the shortcut skipping Kenmare this time. Trying to make good time as we wanted to be in Dingle that evening. 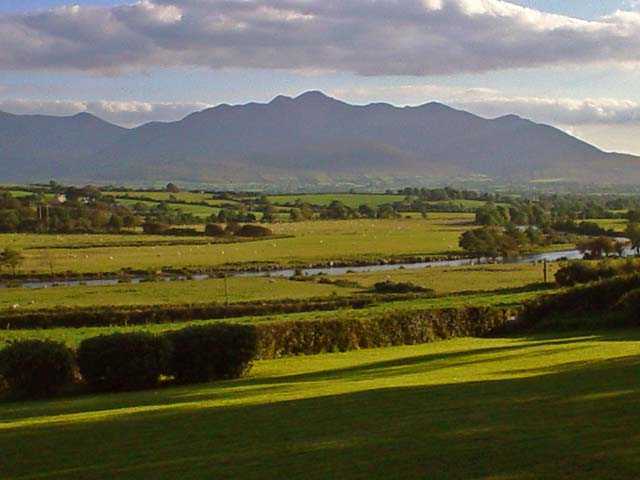 Lovely views over mountains, lakes and forest up to Killarney. Hit traffic and congestion in Killarney and didn't stop until we were clear of it. Drove up to Tralee and then headed west to Camp then Anascaul and then Dingle. Long drive over narrow roads. More great views and pictures. 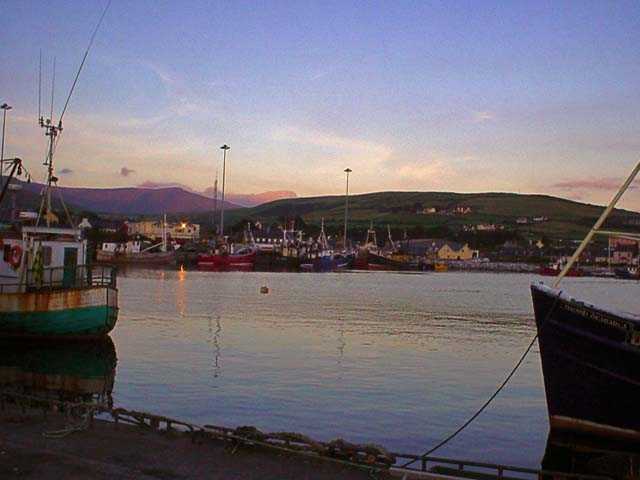 Arrived in Dingle in the late afternoon and started calling around to find a B&B. 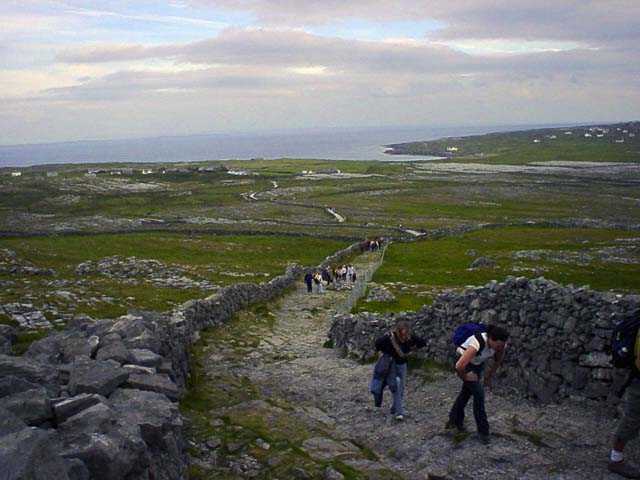 Began with Rick Steves' recommendations from his Ireland book . 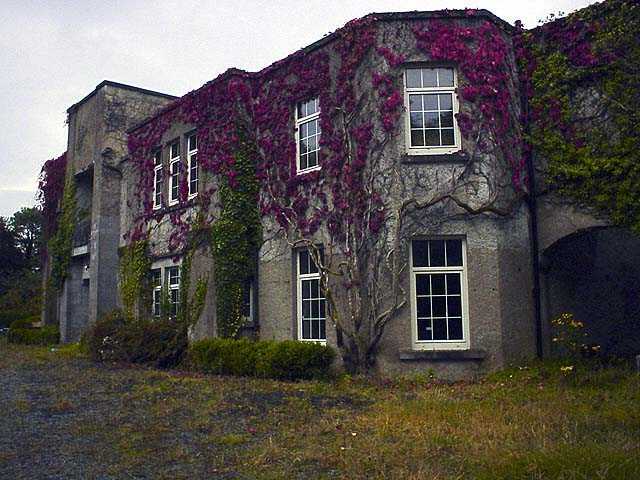 All were booked except the last listing in the book, Kellihers Ballyegan House had an opening. The rate quoted in the book was incorrect and had evidently been a problem for the host. The rate was a bit higher than we'd paid before, but well worth it. Nice rooms on Upper Johns St. up the hill a way from An Droichead Beag (Small Bridge Bar) one of the easy to find landmarks. The window overlooked the harbor in the distance. The sun was setting as we looked out the window, beautiful view. The host was full of information and advice. We decided to stay for two days instead of one and made arrangements. We unloaded and went out for some music and possibly food. Set up camp in An Droichead Beag. Music was to start at 9pm. Somewhat skeptical based on the prior experience in Hollywood. Scott made a food excursion after the bartender told us he only had a few packets of crisps, no food. No restaurants or snack places open, the quick mart up the street was open with a choice of ice cream, crisps or pastries. Scott returned with a couple of packets of crisps/chips (interesting ones) and called it dinner. Smoke increased as the tourists poured in (of course we were not those). Shortly after we realized we'd made a dreadful mistake, it was a tourist trap. The music was OK but nothing exciting. We lasted about 35 minutes after the music started at 9:45pm (note the discrepancy in start time vs. actual time, very common). The final nail in the coffin was a group of five young German tourists dressed all in black who decided to share our corner table. Fully outfitted in matching black turtlenecks and cigarettes. After about 25 minutes of chain smoking, sullen attitudes and blowing smoke into our corner, we surrendered the table to them. We staggered out the door, coughed, choked and wandered back up the hill, hoping we had enough wind left to walk back to the B&B. 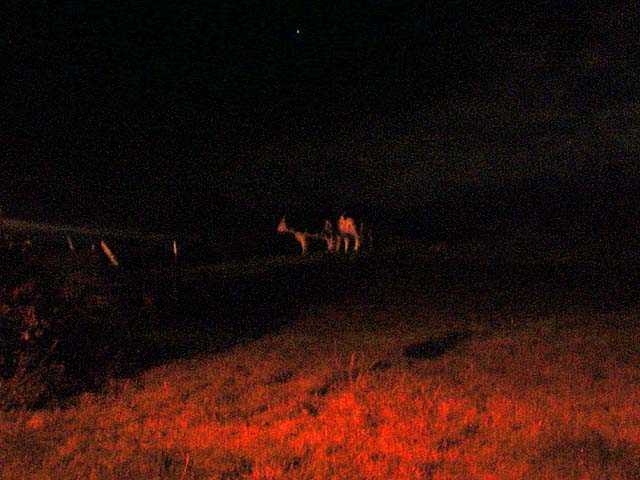 We stopped and watched some cows in the moonlight and then headed the rest of the way up the hill. Clothes reeking, hair even worse, we tumbled into the spacious bed. Woke at about 8am, showered, dressed and off to breakfast. Wonderful full Irish breakfast with homemade brown bread and jam. Hosts were busy serving and chatting up the guests as we ate. Hanna baked the brown bread that morning, delicious and gave us an extra serving! 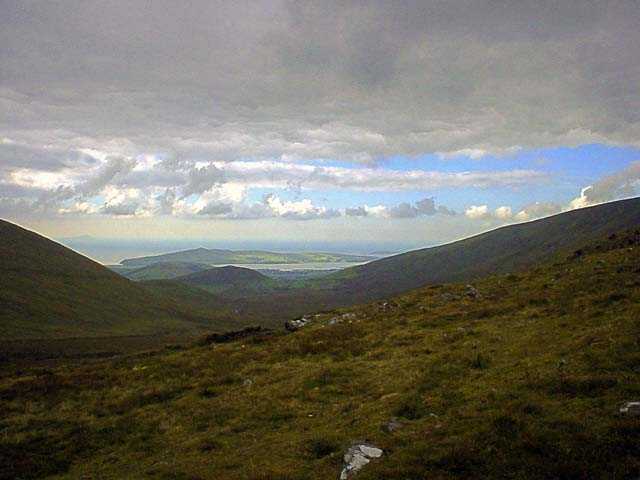 Off around the Dingle Peninsula. 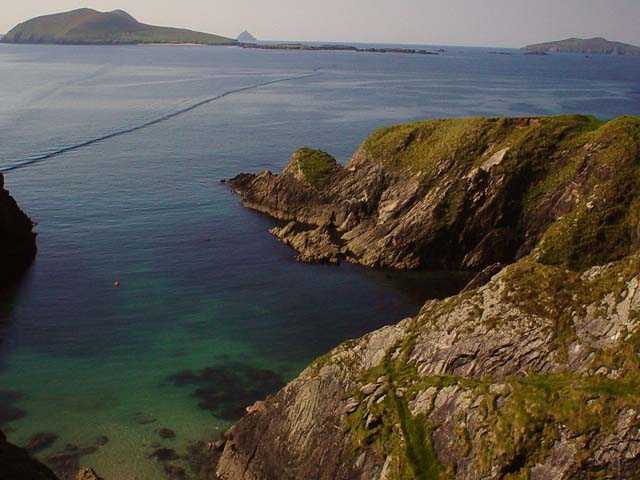 The drive is even more spectacular than the Ring of Kerry, is that possible? Rick Steves does know something after all (we have not been impressed with the recommendations we followed to date). Stopped at several 2 Euro Sheds (what we're calling the small fee collecting stations at the tourist sites, many are closed and you can walk in, most are around 2 Euros to get in) to see touristy things. 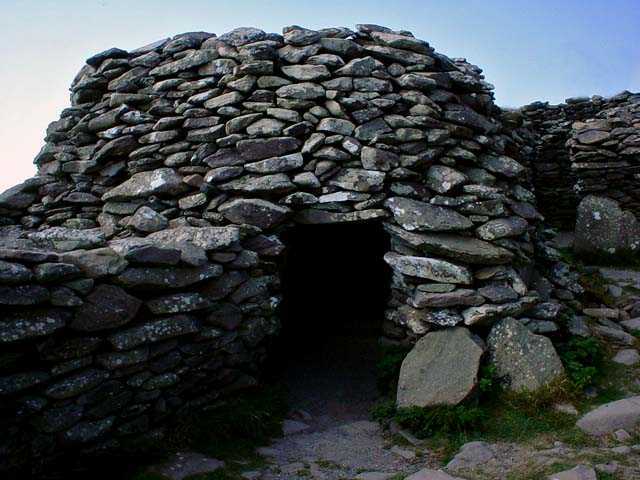 The stone beehive huts and the Dunbeg stone settlement are fascinating when you can see how and where people lived hundreds or more years ago. 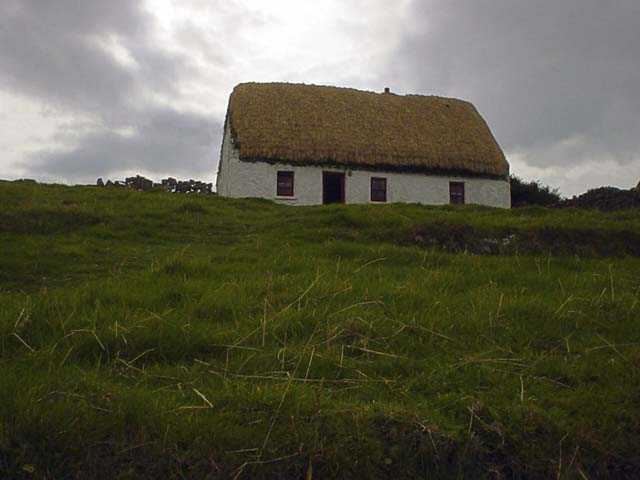 We also visited the Famine Cottage a bit further down the road. It is a healthy climb but worth the effort, very sobering to read some of the information. There is a outstanding view from the cottage. You'd have to be starving to leave this place! 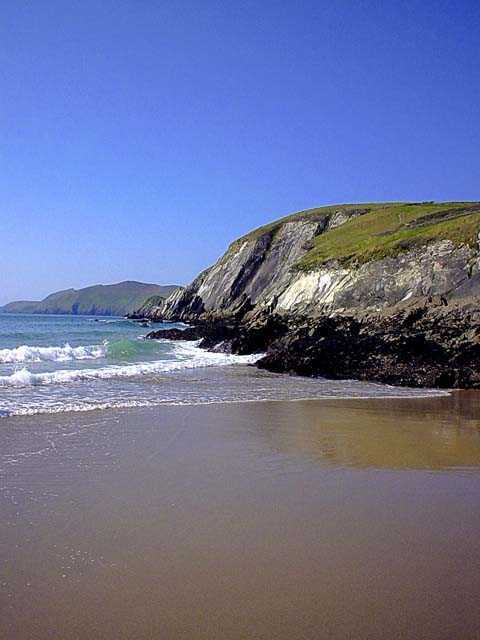 Continued on to Slea Head, Dunquin, the Blasket Island Centre and the beach where Ryan's Daughter was filmed. Slea Head is wild and wonderful. If we could have a house anywhere we'd like one there. Probably only in the summer as the winter winds are fierce and cold. 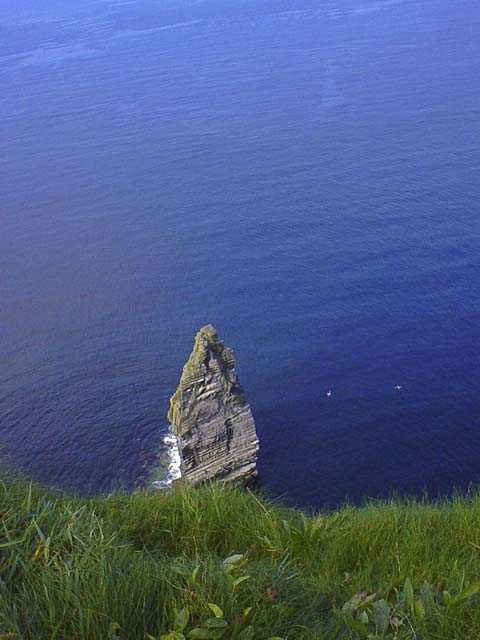 Dunquin is where many of the Blasket Islanders settled. It is small, charming and quiet. There are great views of the Great Blasket from this area. We paid a visit to the Blasket Island Centre. The film presentation there is excellent in showing how the people lived and their history. The exhibits are interesting. Walk around the outside of the Centre. There are great views of the island from the back of the facility. There is a small book area with all the books written by the Blasket Island writers . Make sure you pick up at least one while you are there, or get one here. We recommend Islandman , Peig and Twenty Years A-Growing as a good start. Stopped in Ballyferriter for lunch at Tigh Peig (no longer open). Karen said it was the best tomato soup she'd ever had. Scott had a huge sirloin burger, also one of the best ever! Nice warm pub with large wood bar and open windows. A cool breeze was blowing through and the day was warm and sunny. A good memory! Headed further around the peninsula loop and found a scenic little stream with sheep near. Took a few pictures. Pointed the car back towards Dingle reluctantly and headed back up and over to Dingle. 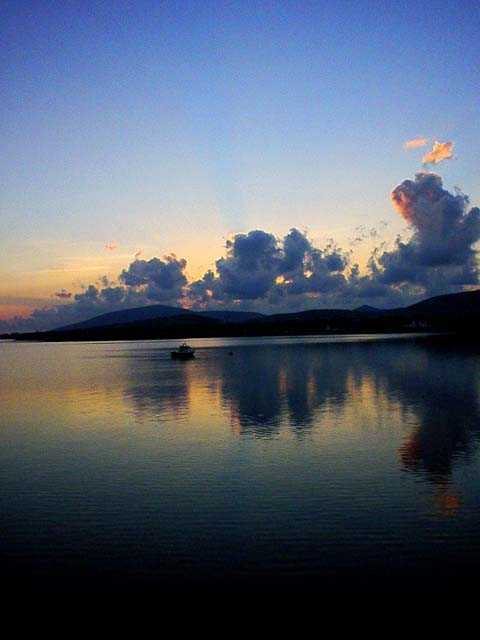 Freshened up in the room and then walked down to Dingle harbor to watch the sunset and the boats. Nets were spread out along the quay. 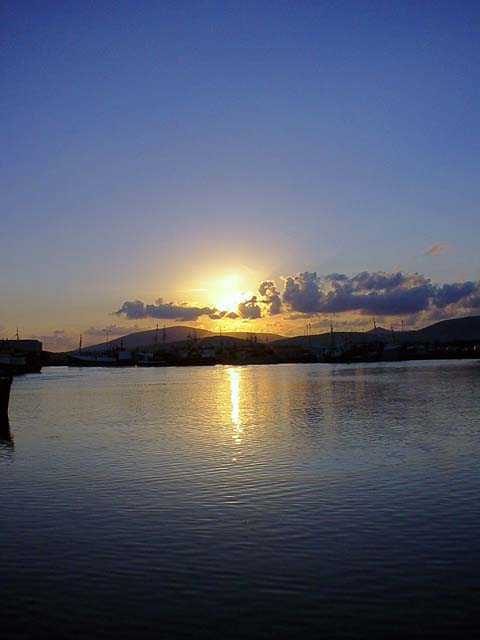 We walked out on the pier between fishing boats, and then out to the harbor edge. Took quite a few pictures, and watched as the sun sank lower and lower. Off for a bit of shopping and the inevitable famine relief search. Ended up at Lord Bakers. Very upscale and nice place, spendy but worth it. Scott had lamb (baa), Karen had chicken stuffed with smoked salmon. Alsace white wine (one of our favorite types of wine), we wrapped it up with a small plum pudding (plumbing pudding as we were later to discover), a cheese plate and Irish coffee and port. The mass quantities of food, walking and exercise and the late hour did us in. We walked back to the B&B, took a few more cow photos by moonlight. Back at the room we observed there were three channels available on the TV, and went to sleep. Arose with minor internal distress (see plumbing pudding in prior entry). Ate a good Irish breakfast notwithstanding and packed up. Walked around Dingle shopping for flags and stuff. Found something sufficiently awful for Scott's brother David. We were not quite sure what it was. It looked like an ancient Celtic warrior that had been preserved in a peat bog. Why he was riding a surf board was a mystery. Crudely carved, wild ropey looking hair and leathered skin. We found out later that it was probably from some tropical place and had nothing to do with Ireland. Oh well, it's not sitting in our house! Left the Dingle Peninsula regretfully but we knew we'd be back for a longer stay! We headed uphill for Conner Pass. Beautiful drive that winds up and away from Dingle. 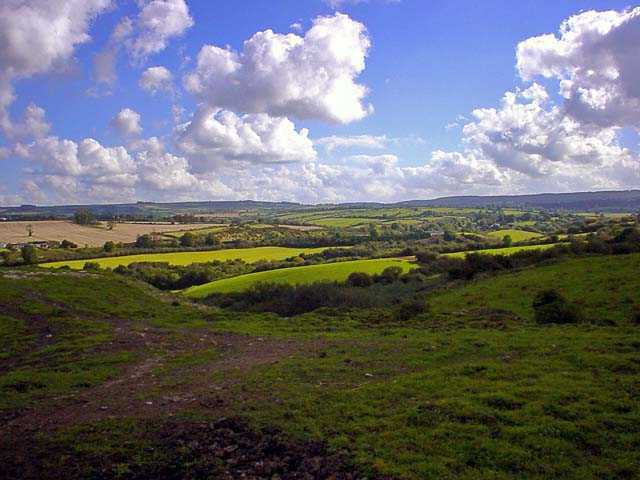 You can stop along the way and view/photograph across the valley with Dingle and the bay in the distance. As you rise higher, you move into the clouds and the wind increases. At the peak you can see into the next valley where there are many lakes. Weather conditions vary, so be prepared for cold, wind and possibly rain. It was fairly decent while we were there. 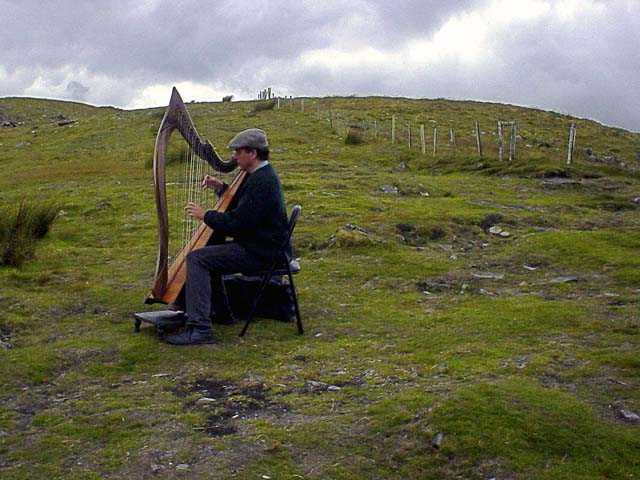 In the parking area a harpist was playing and said he was playing in Dingle that night. We toyed with the idea of heading back, but ventured onward towards Galway. 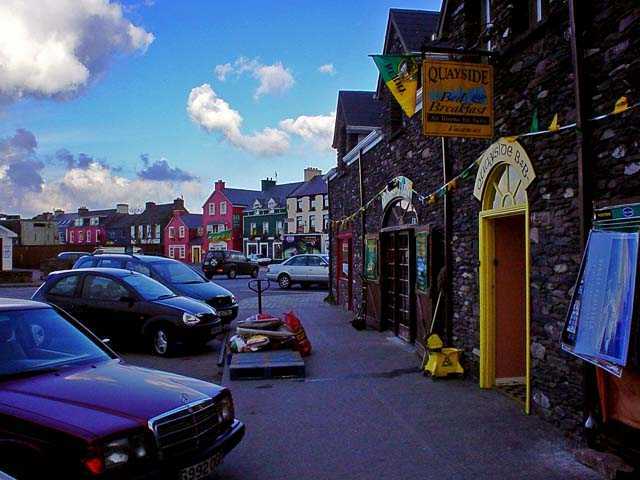 Stopped in Camp on the way to Tralee at the Railway Tavern and chatted with the owner Mike O'Neill and Rusty the dog. Actually the plumbing pudding had taken full effect (remember plums are dried prunes, do the math) and the facilities were required. The Railway Tavern is your quintessential Irish pub. 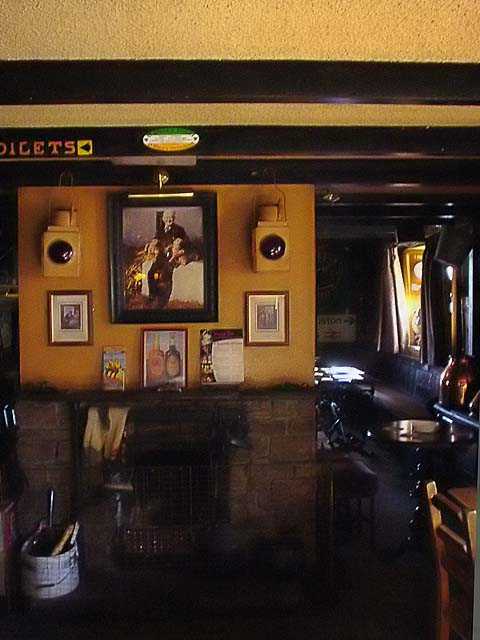 Lots of clutter and interesting stuff on the walls, a fireplace, live music in the evenings and a character behind the bar. The doors were all open and there was a view out onto the bay and a stiff breeze blew the salt air in. Scott had been looking for scrumpy (rough cider) on tap since we arrived. Bulmers cider just didn't cut it, although it isn't bad on a hot day. Low and behold, bigger than life on the tap there were the magical words. SCRUMPY It was about 11:15am but no matter, plumbing matters taken care of, a pint was poured (Karen had some tea). It was pretty smooth, not as dry as expected. Not a lot of kick, but very tasty. It went down quickly while chatting with Mike. We told him we'd like to create our own Irish pub in the basement of our house and he took off and came back with a bar towel and Murphy's Stout bar tray to take with us. We purchased a couple of horse brass replicas he had for sale and wishing we could stay for the day and evening, headed for Tralee. Note to potential scrumpy drinkers, give yourself some time between the pint and getting behind the wheel, it sneaks up on you. 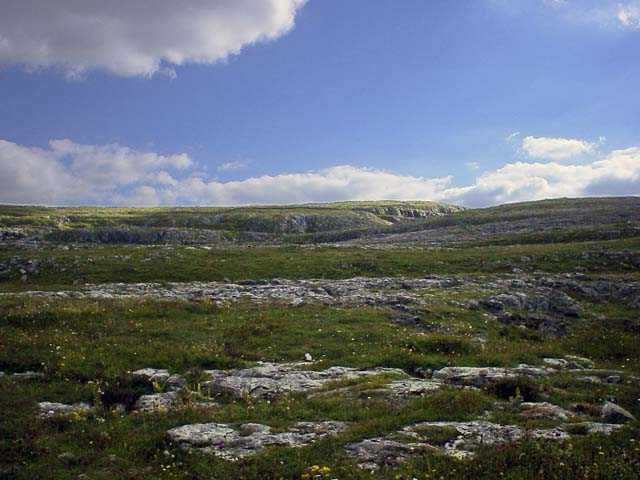 Left Ennis with no regrets and traveled into the Burren. Several misrouting situations due to poor signage and operator error. Visited the Burren Centre in Kilfenora more to use the facilities than for any other reason. We had a brief wander through the gift shop. While looking out one of the windows, Scott spotted an old Irish gentleman (not so much as we later discovered) in tweed and a jaunty cap sitting on a pile of slate near the tour bus stop. We went outside and spoke to him for a moment. He asked if we'd like a picture of him (we did) and would the lovely young lady like to sit beside him (she didn't but acquiesced). He smiled with a big wide toothless (well maybe three) grin. He pulled out his pipe and adjusted his cap, put his arm around Karen and they were set. Scott fumbled with the camera to get it set right and shot a couple of pictures. Karen's smile looked a bit forced, but she doesn't like having her picture taken at the best of times. The old guy asked if we might have the price of a pint on us, we dug around and came up with a few Euros. He thanked us and as we walked away I observed that he had a pretty good gimmick going there. Sitting in front of the tour bus looking all picturesque and then hitting the tourists up for money after. Karen said that was true, and even worse he was trying to feel her up while I was taking the picture. She had to keep her arm clamped on his hand to keep it from roaming. Ahhhh the Irish, they are so charming. The experience disconcerted us to the extent that we missed going to see the high crosses we were originally looking for. We headed off to look for the Poulnabrone dolman. Now this is a fairly prominent landmark. You see it on postcards, websites and books. Virtually everywhere in every gift shop. Signs along the road point to the correct direction. Well, up to a point. Then all references vanish. We covered a lot of territory around the Burren, great views, countryside, stone, cows and such, but the dolman remained elusive. Scott speculated it was related to Brigadoon, it moved around the countryside and hid from tourists. We never did find it and had to be content with the postcards. (we did find it on the next trip). Took a swing west to the Cliffs of Moher. 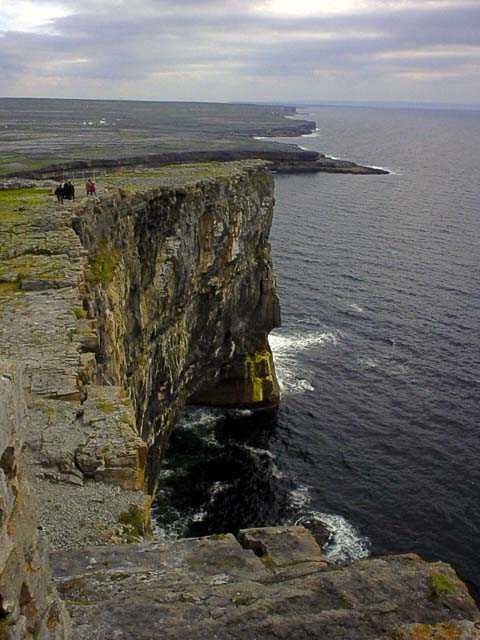 Watched the eejit tourists dangling their feet off the edge or hanging their heads and arms off to take a picture. The wind was quite fierce, but the view was lovely. It was a long way down if one were to slip. Lots of tourists and buses. We discovered a good travel tip in the next trip. Go after hours. You can still get in, don't have to pay to park or fight crowds, and it is lovely at sunset. No one slipped or was blown off the edge, so reluctantly we moved on. We continued to Doolin for a look. Found a nice beach with interesting rock formations. Karen threw a rock and a visiting spaniel retrieved it. We missed our dog Clancy (the tin retriever, she's not quite golden). We were briefly confused by the sudden proliferation of directional signs outside of Doolin, but survived to find the town. Had a pint and some very good seafood chowder at one of the pubs, a few shop expeditions and then off again. Note to shoppers, this is a dangerous town. Time to head north towards Galway. 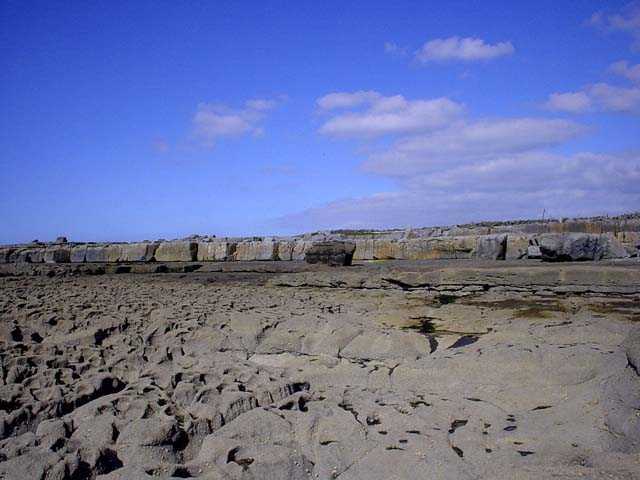 Karen went to sleep and missed much of the drive along Galway Bay and the Burren. Lots of unpiled rocks divided neatly by piled ones. Still no dolman. Into Galway. Big confusing city with lots of roundabouts outside and winding streets inside. Even with maps and directions we never were able to navigate it well. Found the road to Salthill where we had a B&B reserved. Got to Atlantic Heights B&B, right across from Galway Bay. Madeline, our hostess, was wonderful. Made us feel right at home. Very nice room. Lots of information about the area and a lovely parlor. The breakfast menu was exceptional and leaned towards smoked salmon and smoked bacon, gourmet quality (not a bad thing). Went to dinner, found a bistro and had a decent meal. The place was crowded and seemed to have a lot of kids mucking about. Back to the B&B to watch TV. More channels and we had our first exposure to the European Idol and the Osbornes. Overwhelmed, we went to sleep. Woke up early, ate a great breakfast (see the B&B link above for the menu) and got information from our hostess about the Aran Direct. We decided to take the Queen of Aran 2 as it was owned by locals and left from Rossaveal which was fairly close to us. Our Hostess secured tickets for us on the phone and we were off. We took a quick, short drive to find Rossaveal, it turned out to be a bit longer and not so quick. We heard the Irish phrase once again, "it's just down the road". Ten miles later we found it, parked and got in line. Boarding began shortly, and we found seats for the half hour or so trip to Inis Mór. It is a pretty good size boat and rides well in the rough water to the islands. We started out sitting on the deck seats, but migrated below as the wind and spray intensified. The ride was fairly short, not too rough The potential for seasickness is very real if you're prone to it. We weren't, but did notice a few greenish faces. We arrived at Kilronan and disembarked. We had pretty much decided to bike around the island as Karen is allergic to horses and walking was too slow. We rented a couple of mountain bikes (just to the right of the quay) for a reasonable price and set off in the general direction of Dún Aengus. Biking was fine on the level parts. We saw an interesting looking structure on a hill and off we went like a pair of amadans. We had to push the bikes up most of the way as it was very steep and others were walking up too. According to the map it was Dún Eochaill. Unfortunately for all concerned it was closed for the season, day, or the caretaker was out to lunch, anyway the door in was locked. All the other people trooped down the hill the way they'd come. Not us! Furthering our insanity claim, we followed a narrow track past the site and further down the other side. Our logic was that it was a small island, and we couldn't get lost and we'd see more interesting stuff. Turns out we were right. The path bumped along until it met a lane. We'll call it a lane because to call it a path would imply that it would be comfortable to walk on. It was closer to cobblestone, and lined on both sides with stone walls. We jostled down the "lane" for a good ways, up and down hills with a great view the whole time. We saw no one else, it felt like we were alone on the island. Eventually, we rejoined a paved road and shortly after came across a beach that looked like it could be on a tropical island. Blue sky, crystal clear water and white sand. There were even a few brave souls swimming, we were not tempted. 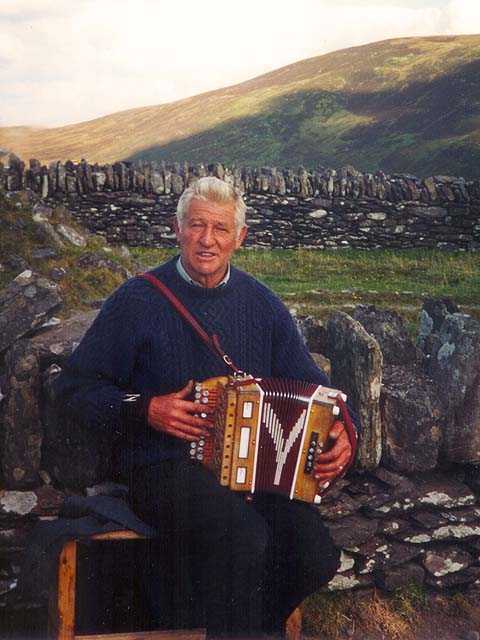 We continued on to Dún Aengus. There are several shops in before the entrance with a variety of sweaters and other knitted goods. We poked around briefly to rest before leaving the bikes and starting the climb to Dún Aengus. It was about a mile up a rocky path until you reach the fort. 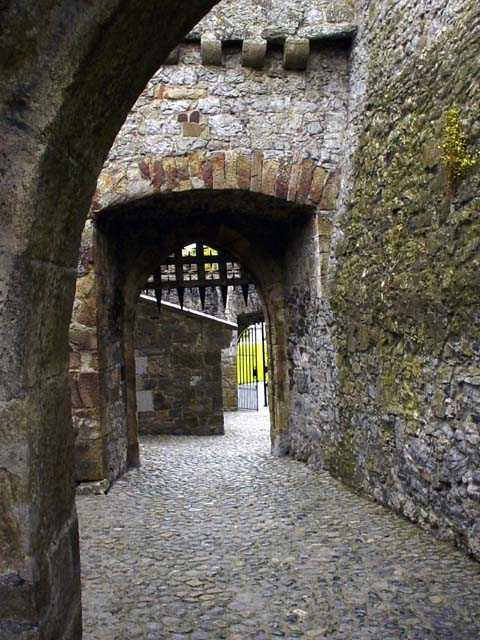 There is a narrow, low doorway into the fort and it opens up into a clear area surrounded by a stone wall. The far side drops off rather abruptly into the sea. Possibly it was a complete circle at one point, but erosion has taken half of it. It was a pretty sheer drop with no barriers or signs. The Irish figure that common sense should prevail and if not, well you're probably to dumb to live anyway and they're well rid of you. We noticed this throughout the country. You didn't see to many coffee cups label "caution, contents hot". The wind was pretty stiff, but we stayed at the top for awhile taking pictures and looking out and down into the sea crashing against the rocks below. We ventured back down to the shops, picked up a few things and hopped on the bikes to return to Kilronan. The bumpy roads began to take their toll on our posteriors. We passed several nice cottages on the paved road as well as a graveyard. We made several stops to take more pictures and eventually returned the bikes and walked into Kilronan. We were walking a bit like cowboys and noticed others doing the same. We grabbed a burger and fries at a small cafe, the only food available that time of year, and then visited the Aran Sweater Market. Quite a selection and we escaped with only minor damage to the credit cards. Karen bought a nice sweater that she wears quite often. We found several nice gifts for friends and family. Prices were reasonable considering the quality. Prices are significantly higher for hand knit items. We went back aboard the ferry and set sail back for Rossaveal. It was an uneventful trip although there were some nice views leaving and arriving as you passed the shoreline. Back into the car and then back to the B&B. We ventured into Galway and found a pizza place. Well, sort of pizza, it was not far from Totinos frozen pizza (survival food for college students) except that it had less sauce, meat and cheese and cost 12 times as much. A quick trip to the off license provided a few cans of Guinness. 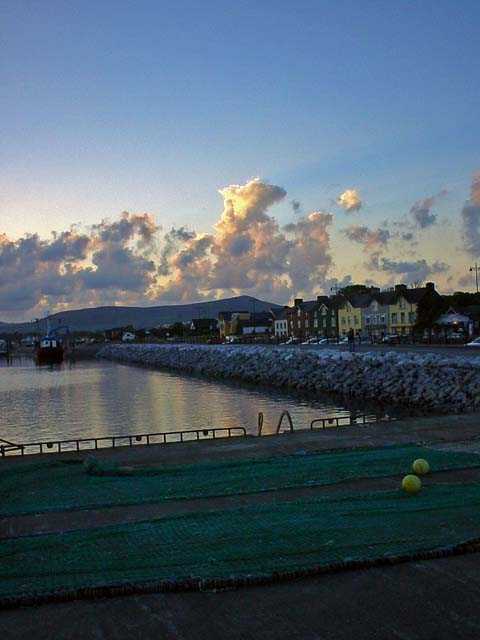 We sat out on the lawn in front of the B&B and watched the sun set on Galway Bay and gnawed our pizza crust. We cleaned up our mess, (don't want to be ugly Americans) and went off to bed. Woke up and showered and headed off to a fine breakfast. Especially enjoyed the fresh fruit and juices. Went into Galway city center in search of an Internet Cafe. Found one across from a church and then remembered it was Sunday. Hung out in front of the Internet Cafe in the rain and people watched until it opened. Very modern looking place, with lots of wood and polished chrome. Checked email and headed back West for Spiddal. 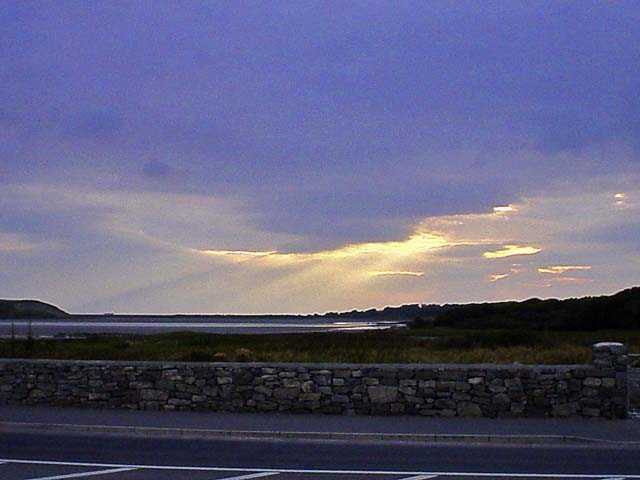 We left Galway and took a leisurely drive along Galway Bay to the west. The day was overcast with light rain showers. Prior to arriving in Spiddal is the Spiddal Crafts Centre. It’s a group of shops with crafts by independent artists in a variety of media, from pottery to leather. We spent about an hour browsing the shops that were open on a Sunday. We purchased some very nice pottery from one of the pottery shops. Continuing on the road we soon arrived in Spiddal. We had a goal of finding Hugh’s Bar and Spiddal House. 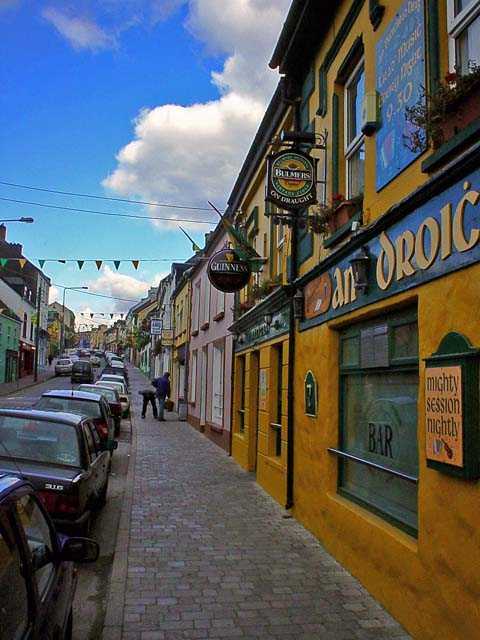 Both locations are well known to fans of the music group The Waterboys. Scott is a fan, Karen tolerates them. We were quickly distracted by the church and quay to the left as you enter town. Making a left hand turn after the church, we drove alongside the graveyard and into a public parking area quayside. 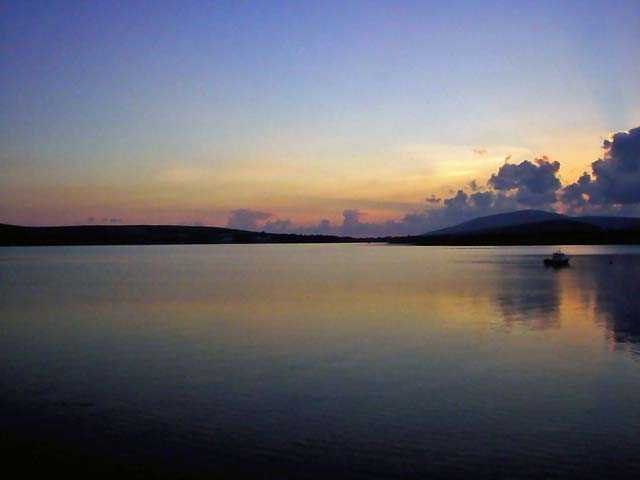 From there we walked along several dock areas with old wooden boats and currachs (tar and canvas covered boats). We walked across the parking lot, through a gate and into the church graveyard and read and photographed many old gravestones and crosses. The graveyard is very wild and picturesque. 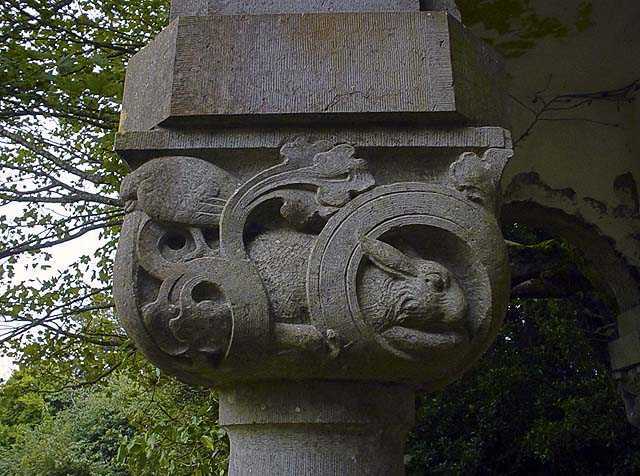 There is a small stone chapel in the graveyard that is of particular interest. We walked across the street to the small market and asked where Spiddal House was. One person had never heard of it, the other said it was just up the side street along side the market, but that it was gated and we couldn’t get in. We purchased a couple ice cream cones and left to drive up the road to the gate. As we exited the market, I had to laugh because the building across the way from the market was clearly labeled Hugh’s Bar, we didn't ask about it, but there it was. One site down, and Spiddal House to go. We drove up the road a very short way and saw a large stone wall and iron gate. No label or sign though. 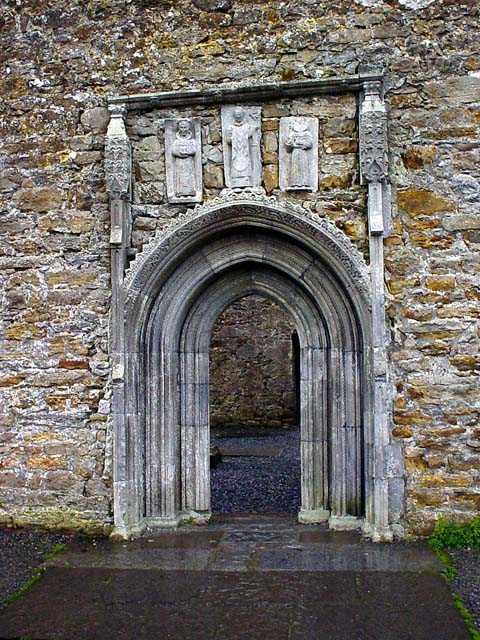 Assuming that this must be it, Scott got out of the car and took a couple of pictures of the gate and gatehouse. Scott noticed that the wall was falling down by the gatehouse and would be easy to hop over. Karen was game, so over we went and walked up the half mile or so road to the house. It’s very overgrown with beautiful old trees and many wild flowers. 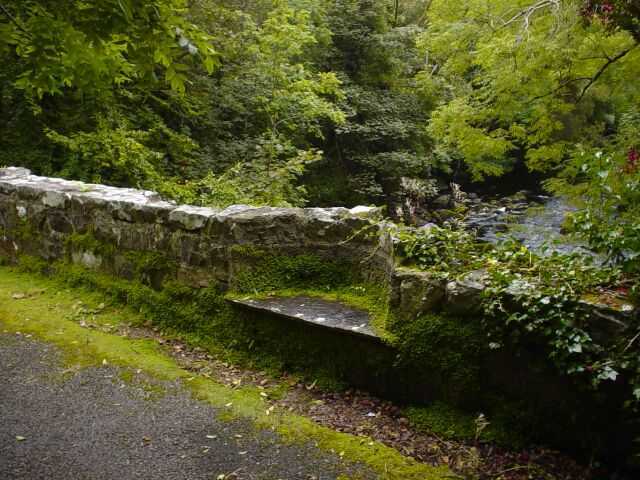 Nice stone bridge over a stream is worthy of contemplation and perhaps a rest on the seat built into the bridge. There is a huge old tree just past the bridge on the right. The carriage house is through the trees on the right a bit further up. A big open area in front of the house allows views from several angles. 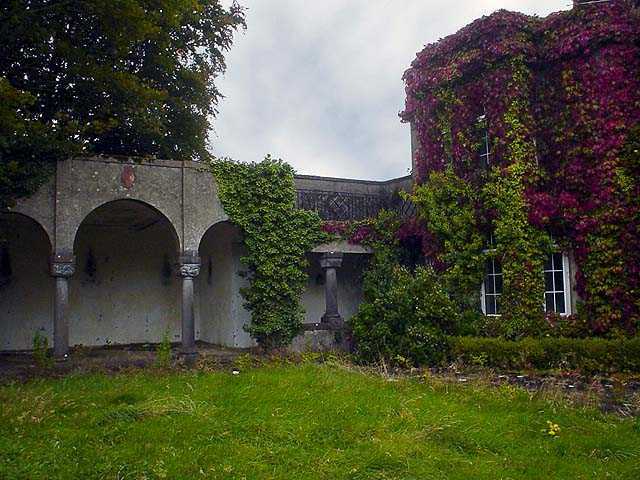 The house is in very poor condition, but it’s easy to imagine that is was quite impressive in its time. It’s covered with red ivy. An arch on the right leads to the back where some construction work was evident. Walking around the front to the left reveals the location of the cover shot on the Fisherman's Blues album. The arched walkway is particularly nice. 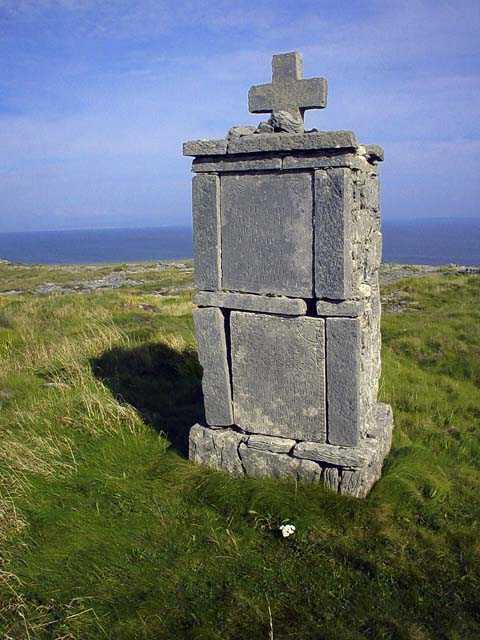 Look at some of the stone work on the pillar tops, each is different on each side. 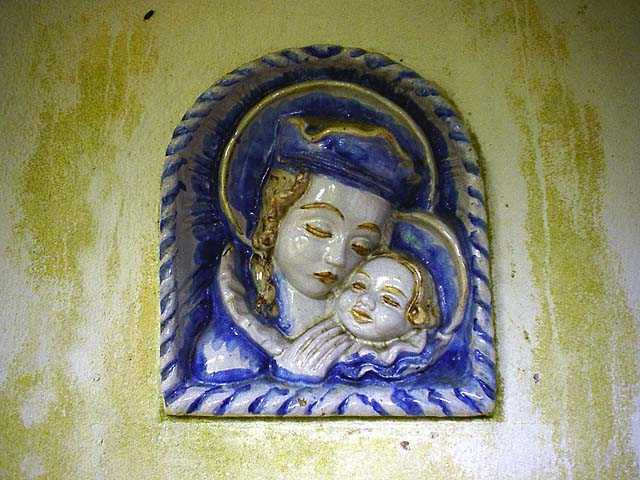 There is also a nice tiled inlay of the Madonna and Child on the back wall. The house may be undergoing renovation. 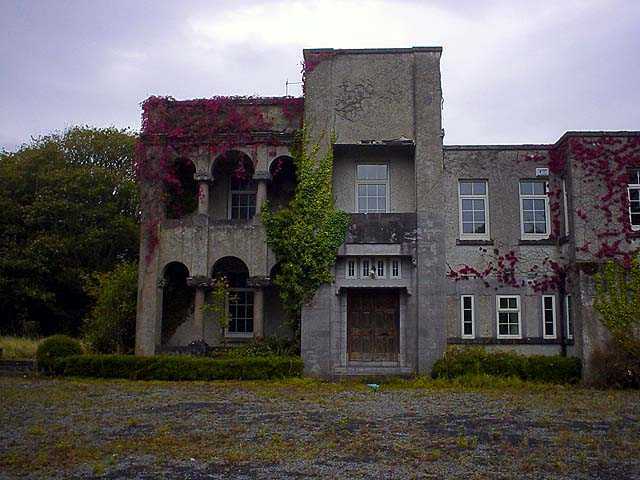 There was probably an incredible view of Galway Bay at one time from the front of the house. The trees are blocking the once magnificent view. We ran into a couple of other people there who claimed to know the owner and told us that the back door was wide open and to feel free to look around inside. Some remodeling had taken place in the recent past and things were quite torn up inside. We walked around carefully and were very impressed with the tile work in the entryway. 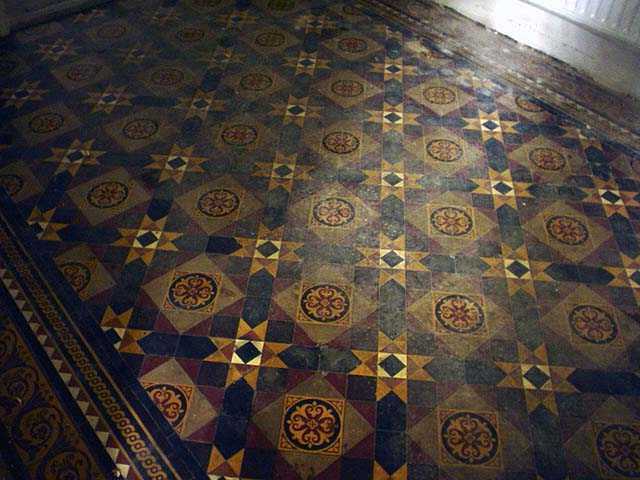 If you can access the interior, the tile in the entry is well worth a look. Very intricate and colorful. We walked back down the road and agreed that hopping over the wall was well worth it. We paid a visit to Hugh’s Bar for a pint and the restroom. 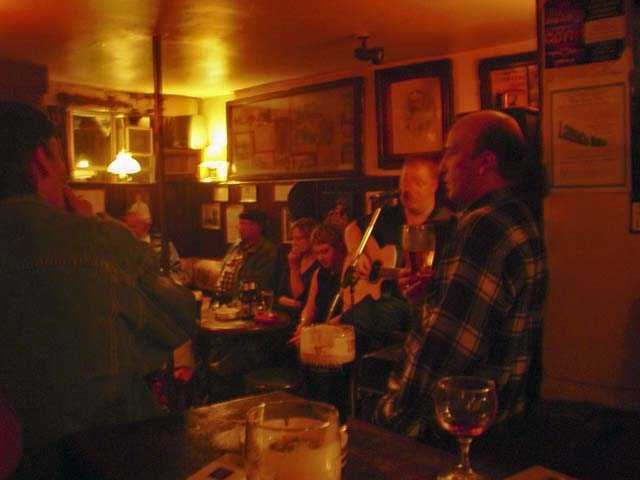 The bar is famous as a recording location and hangout of Mike Scott and The Waterboys during the Fisherman's Blues and Room to Roam album years. The place is warm and cheerful. There was a woman’s football playoff match on the telly, and the place was quite crowded and loud. Much cheering and the crowd were many pints ahead of us. I wish we could have visited when we could have heard some music; it seemed like a very pleasant bar and group apart from the gentleman who visited the ladies room while Karen was in residence. 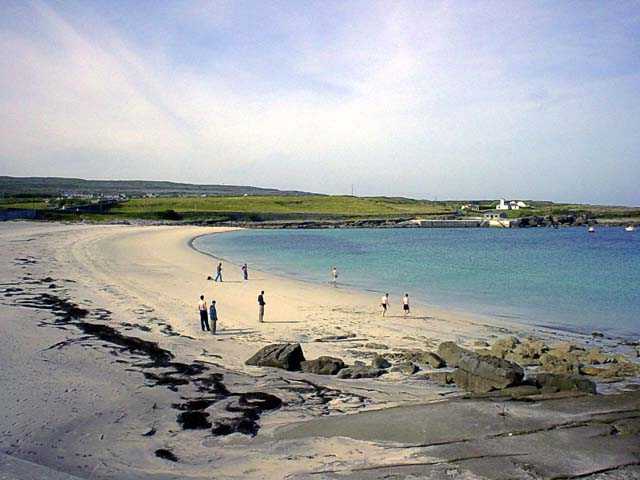 Spiddal would be well worth considering as an alternative location to staying in Galway. 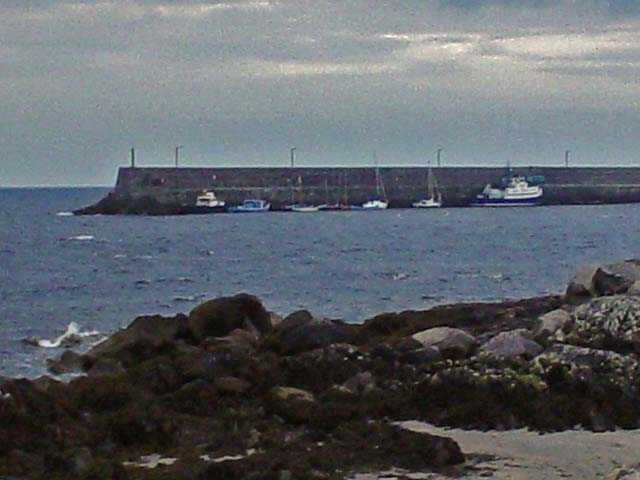 There are many B&B’s in the vicinity and it’s not far from the Aran Island ferry in Rossaveal. After a brief refresher in the B&B room (short nap) we trekked back into Galway to find some food and poke around a bit. As we recall we drove in the usual random circles looking for food or a landmark. 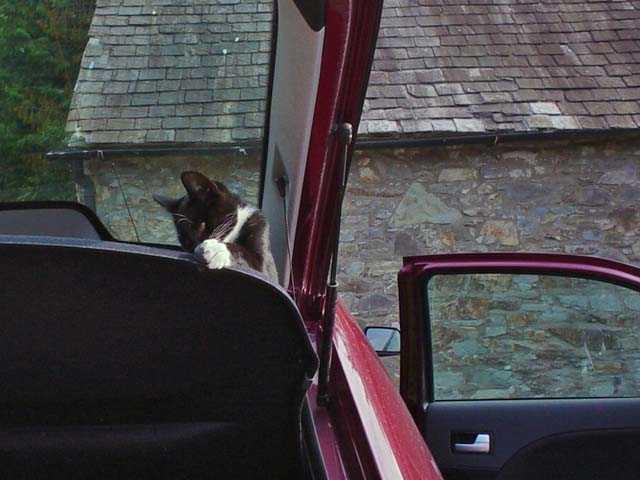 Again, we found Galway hard to navigate in the car. The streets seemed random and things were not where they were the last time. We found an interesting section at the South end of Galway that had a couple of casinos and a variety of restaurants. 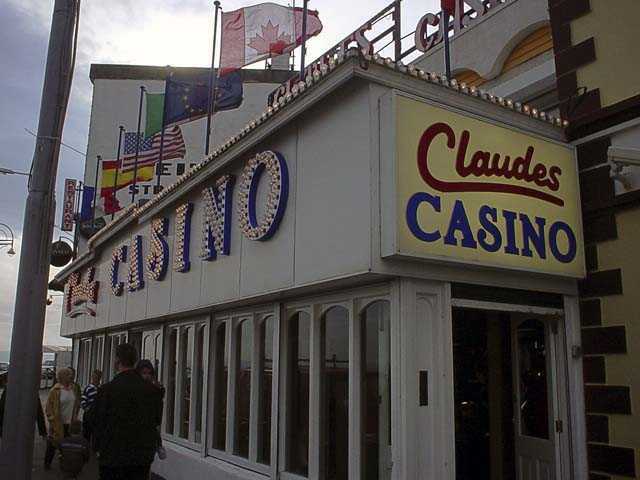 We wandered into Claude's Casino first. We were pretty sure the slot machines were shipped over from Vegas and had been in regular use since the early 50's. Probably not a lot of cleaning either. It was an interesting variety of kid oriented stuff and slots and poker machines. We wandered around and looked at the overall collection of antiques and plugged a few 5 cent coins in. Across the street was a more modern facility, the Seapoint Leisure Centre. Lots of glass and bright carpeting. 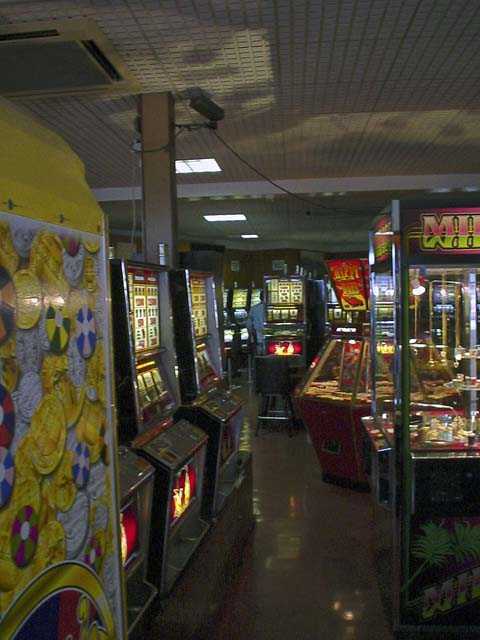 It was divided into a kids section and another room for the "serious" gambling machines. The machines were newer, but the room was large, dark and smoky. The people in front of the machines were chain smoking and looked pretty grim. Breathing the air for more than a couple of minutes began to make the lungs burn and eyes water. We adjourned to the kids area which was separated by an entry way and doors. No smoke and much better lighting. People here looked cheerful and kids were running everywhere. We proceeded to waste about two hours and 30 Euro playing nickel games that involved trying to knock toys and more coins down. We did fairly well and ended up with a handful of useless toys for the nieces and nephews. Hey they're from Ireland, they're special toys! Hungry now we ventured up and down the street looking for food. We found Karachi, a promising Indian restaurant next to the pizza place of little sauce visited earlier in the week. The place looked intriguing, and the menu was extensive. The problem was that it was empty. Perhaps a Sunday evening was not their busiest time. The owner, well turbaned was barking into the phone and the waitress spoke decent English but with a eastern European accent. We opened the menu and were presented with a huge dilemma. The menu was about 20 pages of Indian food divided by region. The descriptions were more than adequate to know what you were getting, but there were to many choice, the place smelled good and we were starving. We ordered some appetizers and three main dishes (hoping they were not huge portions as at the Chinese restaurant in Michalstown) we settled in to enjoy the Indian pop music. Karen was chair dancing to the music when the food arrived. Decent sized portions and very good. It became evident throughout the evening from the stream of people and the owner being on the phone that they did a great takeaway business. It was some of the best Indian food we'd ever had and an enjoyable evening. Replete with food and entertainment, we stashed our toys and headed back to the B&B. A little more exposure to Irish television and we were ready to call it a night. Here are some books we read, reread or discovered on our trip. We think you'll enjoy them too. They are all related to traveling, living and surviving in Ireland. They are best to read after you've been once. So much will make more sense. Got up and headed for the final great breakfast at Atlantic Heights B&B. We packed up and bid farewell to Salthill. The major regret was having more time to spend further West. We drove into Galway looking for a laundry that we'd seen the day before. Evidently it had moved, closed down over night or was attached to the dolman. Bought parking disc (new experience) and found that a parking disc doesn't guarantee parking. Finally found a spot and sallied forth into the Galway shopping district. Most of the shops were not overly interesting. We did some browsing in a bookstore looking for Ireland specific kids books for our niece. No luck in the Internet Cafes or tech shops offloading the memory stick. Time on the parking disc was running out so we returned to the car and wound our way around the string of roundabouts out of Galway. We left Galway and headed North on the N17 towards Tuam with the goal of visiting Knock in Co. Mayo. Shortly after leaving Galway we saw a fairly significant ruined building on the left side of the road. 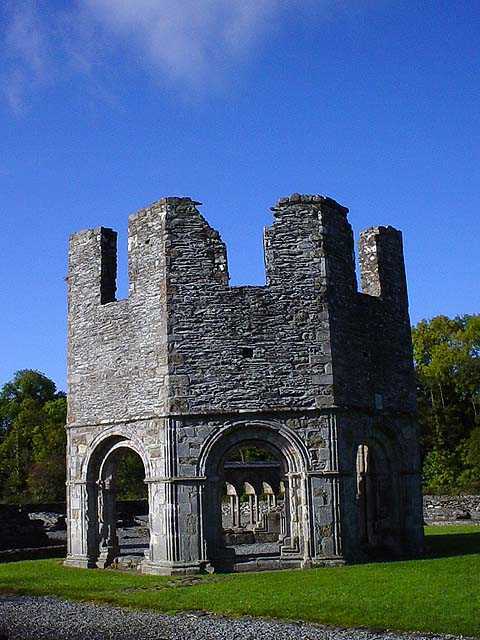 Turns out it is significant and has a name, Ross Errily Franciscan Friary. 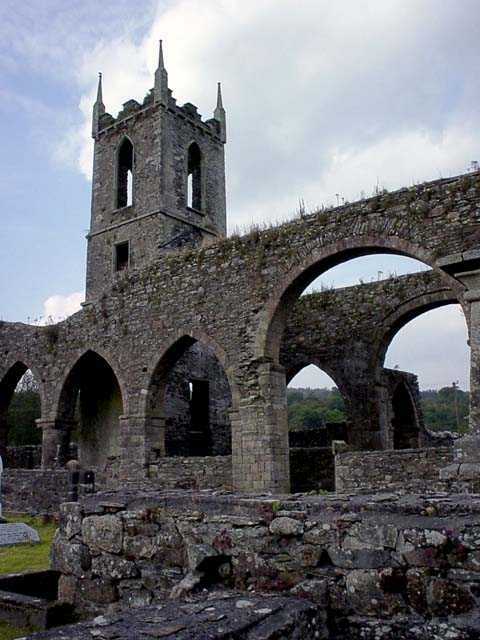 Turns out that it is the biggest Franciscan friary in Ireland, or what's left of it anyway. Some construction was going on that proved to be restoration. The only cars in the lot were those of the workman. Not being ones to miss any chance to tromp around in old, busted up ruins, we made a quick stop. It was a very fortuitous find as the ruins proved to be extensive and not overly restored. 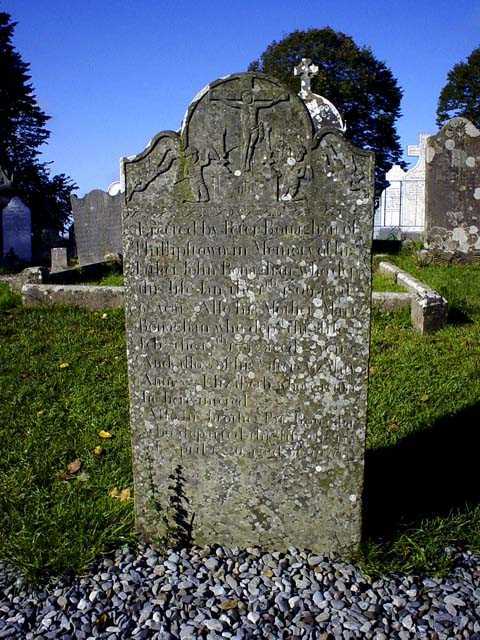 There were many interesting grave stones in and around the abbey. Much of the walls were still intact, allowing you to visualize the size the place was when in its full glory. Back on the N17 we drove through Tuam to Knock. Knock was an interesting experience. It is a major tourist draw and while the actual Knock shrine site is fairly restrained, the shops and booths around are a sight to behold. There is an International Airport in Knock just to handle the tourist traffic. Many very tacky displays of statues, icons, and other pretty gaudy stuff. One of the major things to do is get water from Knock. The water is free, but the wide variety of water holders are not. They range from cheap plastic bottles with a Knock label to gilded glass. We poked around a few shops then went into the main shrine area. 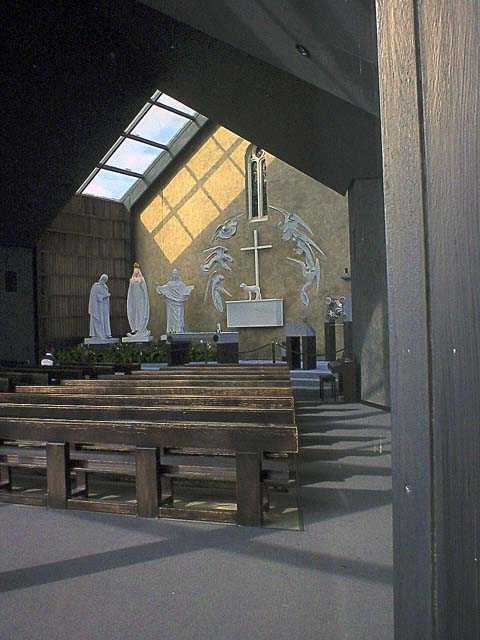 The chapel is very beautiful with a representation of the events that lead to Knocks popularity. We walked around and through some of the other buildings as well. Pretty much a crash course in Irish Catholicism. We went back to the shops and began some serious browsing as we needed water receptacles to deliver the Knock water we'd promised to relatives. After some comparison shopping we selected a variety of interesting shapes, sizes and colors and carried them back to the filling station/water dispensers. General wetness ensued as we tried to funnel the large flow into the small bottles. Well watered, we packed up our bottles and went back to the car. We traveled in a Southeast direction towards Athlone with no particular goal. 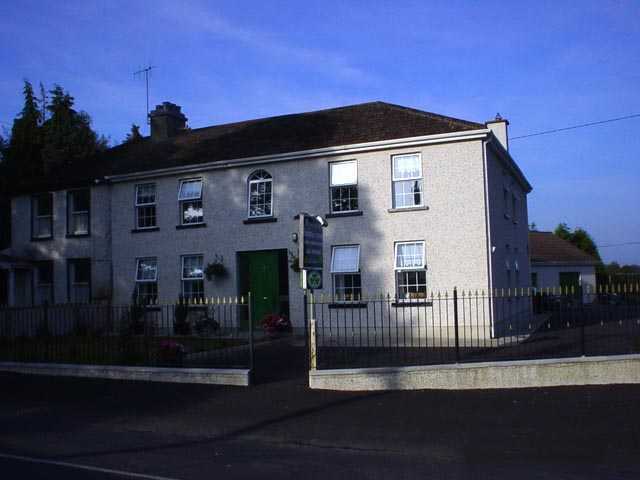 We made a phone call around Castlerea to find a B&B near Athlone. We tracked down one easily, the Fairways B&B, and the hostess told us we must stop in Knockcroghery to visit the Clay Pipe Visitors Museum on the way. She was quite adamant. Not being ones to turn down a new experience, we had a go. 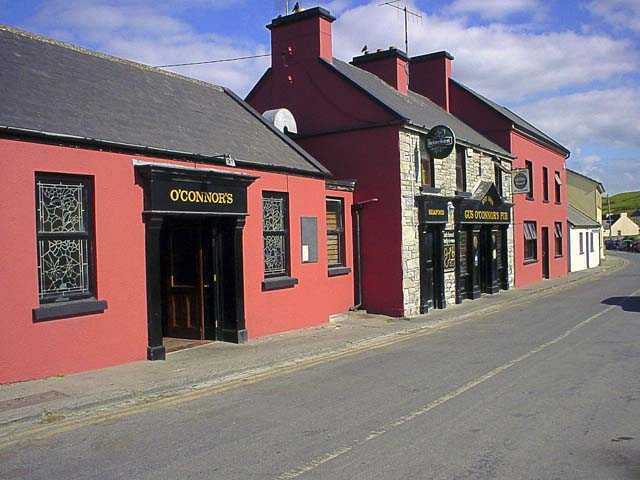 The village of Knockcroghery in Co. Roscommon was famous for almost 300 years as a center for the production of clay pipes or "Dúidíns". In the late 1800s, pretty much the entire village was involved in the manufacture of the pipes with seven different families involved, each with their own kiln. Production of the pipes in Knockcroghery ceased abruptly in 1921, when the village was burned down by the Black & Tans during the War of Independence. In 1997, Ethel Kelly revived the craft on the original site of Curley's clay-pipe factory, using the tools, moulds and methods dating back almost three centuries. There is a small museum and shop in the town that provides an interesting short tour. The owner is friendly and full of historical information about the town and clay pipes. You can purchase a pipe on site or online. There are examples of many clay pipes over a long period of time as well as photos of the previous factories and people. 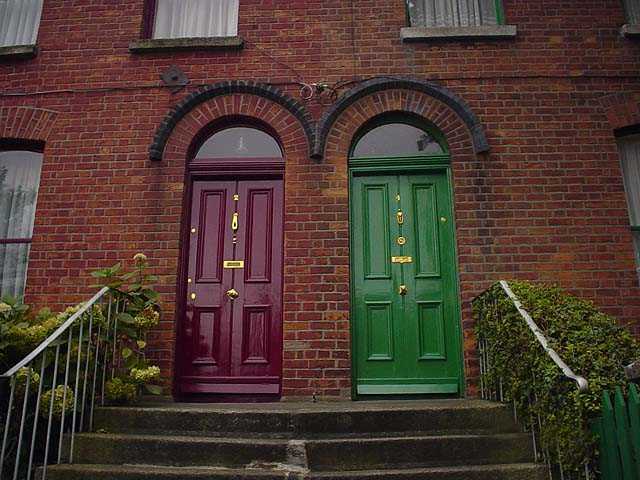 Be sure to go to the pub one door to the west. It’s small, but lively. We popped in for a pint and ended up staying for several hours, chatting with the barkeep and the owner. The barkeeper gave us a glass and bar towel for our collection. He also commiserated with us on the lack of heat in Irish food. He loved hot sauce and we promised to send him some and a pint glass or two from home. (We did pack up several McMenamin's glasses, one of our local brewpubs, and some hot sauce). Several locals wandered in and put down a quick pint and appeared to be settling in for the evening. We purchased a round for everyone, which loosened them up considerably. In fact, they didn’t want us to leave and wanted to each buy us a round. Five or six pints is a little more than we wanted to consume at that early hour, so we begged off and headed towards Fairways B&B. The B&B was very nice, comfortable and the room was large and clean. We unpacked and discussed dinner options with our hostess. She recommended the Palace Bar in Athlone right by the castle. We drove into Athlone and sure enough, there was a castle. You couldn't miss it. Unfortunately it was closed, so no tour. We found parking right in front of the Palace Bar, a large building with an impressive stone entrance. We went in for a bite. The food leaned heavily in the cow direction with large portions being a primary focus. We tanked up on protein and pototoes. 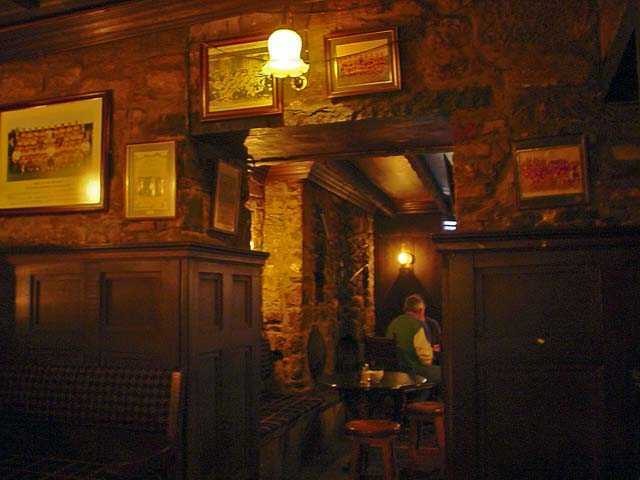 The other thing our hostess had recommended was Sean's Bar, the oldest bar in Ireland. We couldn't miss this as it was just down the road on the other side of the castle. We could see it as we exited the Palace Bar. We left the car and walked down the hill to Sean's Bar. 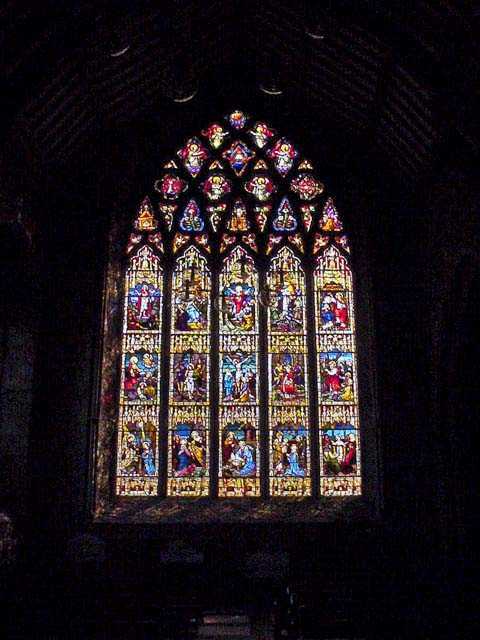 The front wasn't well lit but the windows cast a inviting warm yellow glow. 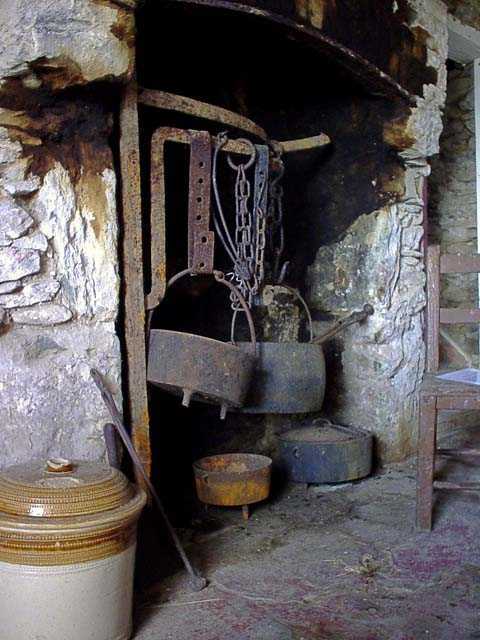 There was a fire burning in the hearth just to the right, and it was full but not overerly croweded. 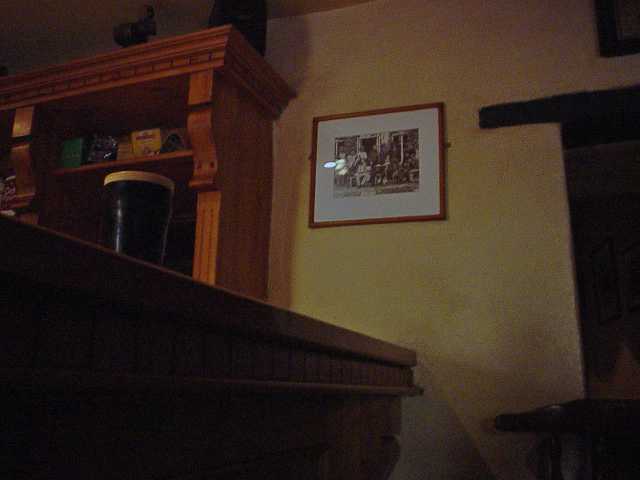 We took a stool at the bar and settled in to enjoy the craic and general atmosphere. 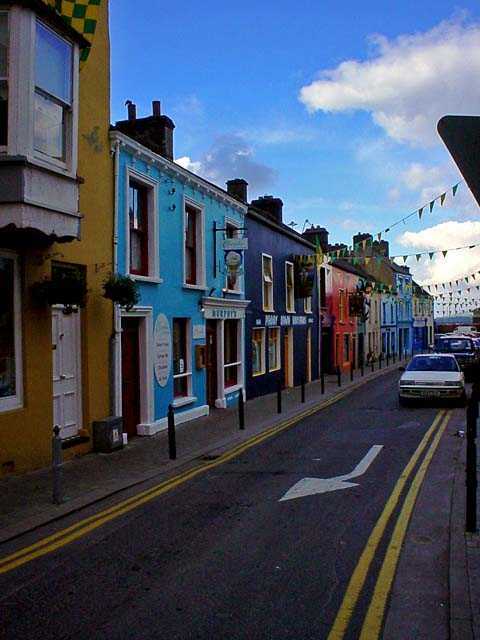 Sean's Bar is located in old town Athlone near Athlone castle. 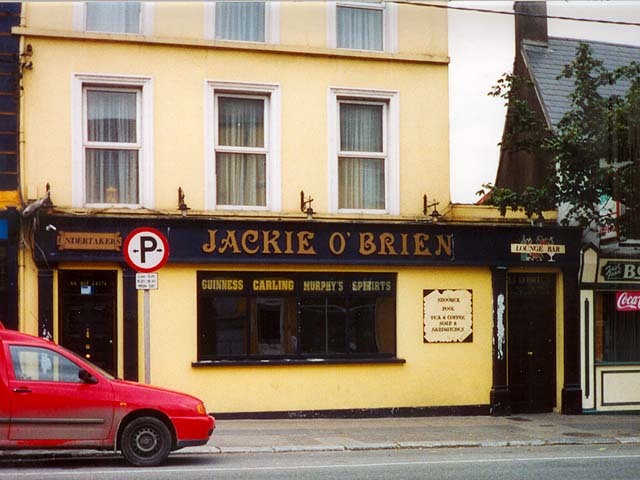 The claim to be the oldest bar in Ireland is certainly loudly contested by other pubs, but with the evidence presented around the pub, one would be hard pressed to dispute their claims. A display in the bar contains clay pipes (see Knockcroghery Journal Entry above) found behind wattle and wicker walls during renovations. Our B&B hostess recommended a restaurant (which we found average), but said we must visit Seans Bar. It was across the parking lot and street from the restaurant. 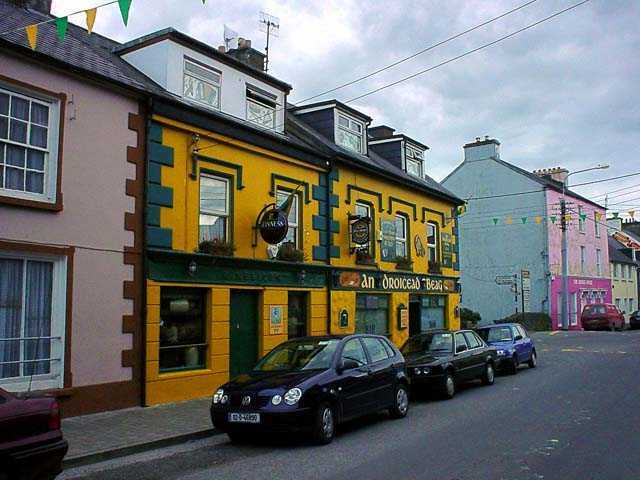 The front is typical Irish pub and has an warm inviting feel, inviting you in. The service is fast and friendly and the crowd is a mix of locals and tourists "in the know". The bar was already crowded when we came in. It’s long and narrow with the bar running most of the length. We sat at the bar and ordered two pints and within minutes we were in conversation with one of the men sitting by us. He had been there since noon and was many pints ahead of us and had switched to Kahlua and Cream to settle his stomach (understandably). Eventually over the course of the evening he added the pint back into his menu. We were amazed at his prodigious alcohol consumption. He was in town on a construction contract and had little to do in the evenings but hang out in the pubs. 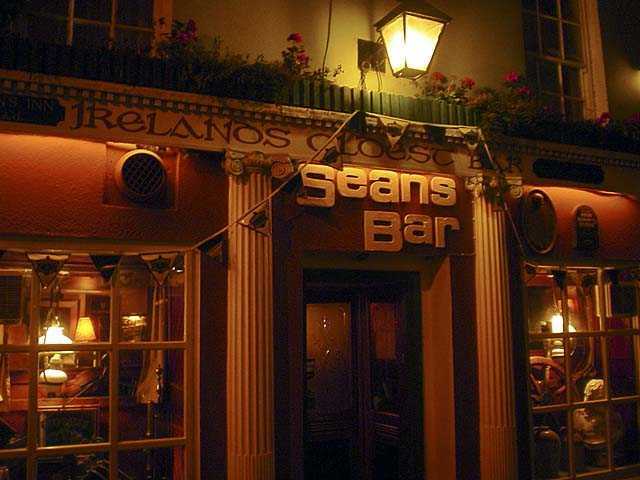 Seans Bar was his favorite in Athlone. We chatted about Ireland, America and a little of everything else as the Guinness flowed. Later in the evening a young man showed up with a guitar and started doing traditional and Celtic/Irish pop tunes. Being a Waterboys fan and wearing a t-shirt from their last US tour, Scott requested Fisherman’s Blues, one of their most popular songs. He knew it and evidently most of the crowd did too. A sing along ensued for all subsequent songs, Waterboys or other. After five hours and many pints, and innumerable trips to the bathroom (very clean but rustic with interesting pen & ink prints on the wall), we decided to call it a night. Irish pubs usually close around 11pm (so they say) but it was easily 1am or later. Scott can’t attest to the exact time as his eyes didn’t seem to be focusing correctly and the ground had a significant angle to it in all directions. Fortunately, Karen had shown greater restraint and was well able to drive except that she had forgotten her glasses. With the blind leading the blind we lurched off into the dark and rainy night and after a few misadventures with directions, water towers, metal bands in the road, and fiberglass ice cream cones, managed to locate the B&B and crawled into for bed. All in all we both agreed that this was our best pub experience with the craic, Guinness, and music all coming together with the friendly service and company to form the perfect and memorable Irish experience. If you want to experience the best in Irish pub life, sit at the bar. The next morning we were not sure whether to throw our clothes out the window or burn them. The bar was smoky, and the smell of stale cigarette smoke was almost unbearable. We stuffed them all into a large plastic bag and then tied it shut and then put it inside another plastic bag. That made them bearable until we got to a laundry. We had breakfast and packed up and hit the open road. We dropped off all the clothes in Athlone and made arrangements to pick them up later in the day while we headed for Clonmacnoise. Skies were moderately overcast with the threat of some showers, but we pressed on to Clonmacnoise. 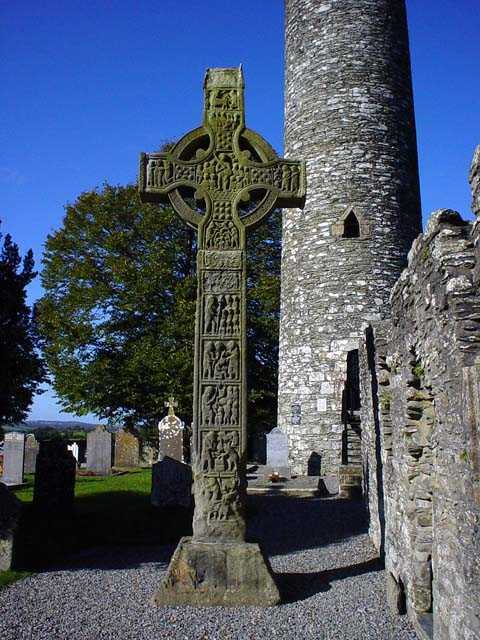 Located in the Boyne Valley on the river Shannon, Clonmacnoise is one of the early Christian settlements. There is an excellent visitors center with loads of information about the history of the region and site. There are some very nice high crosses in the visitors area with replicas in their original positions. 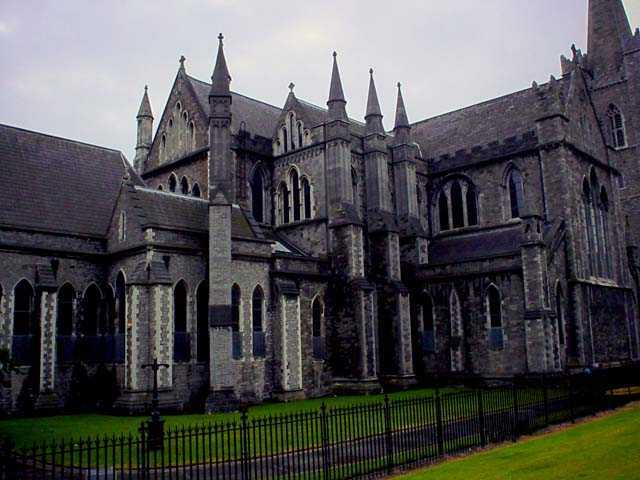 There are two high towers, a cathedral and numerous other buildings surrounded by the graveyard. 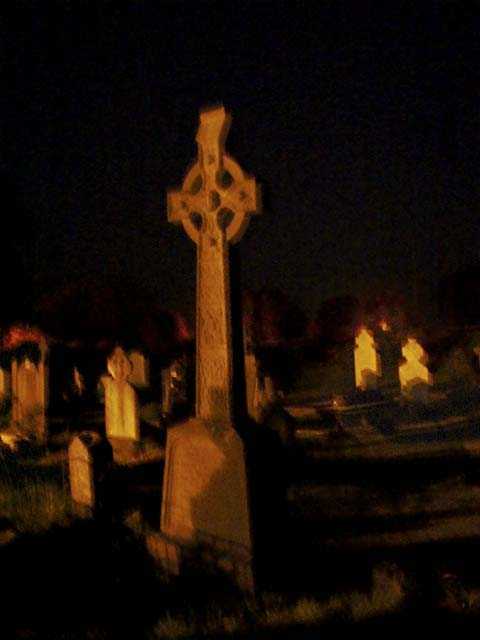 The graveyard has many interesting stones and crosses. There is a wonderful view of the river from the grounds. We took pictures and wandered amidst intermittent rain showers. At one point it was raining so hard and we were so soaked we just kept wandering. We couldn't get any wetter. The sun came out and we dried quickly. Grabbed a cup of tea and a snack in the cafe and warmed up a bit. 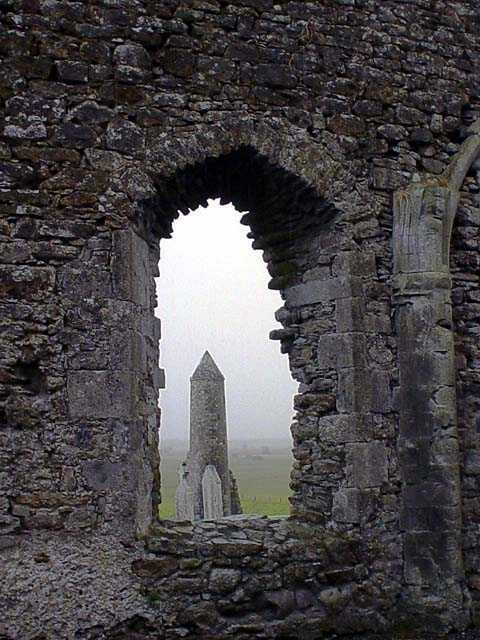 Clonmacnoise is another Duchas Heritage Site. Driving along and looking at the map and literature we had picked up somewhere we spotted the Blackwater Bog tour. It was appealing in several ways. First it was covered and the weather was still wet and cold. 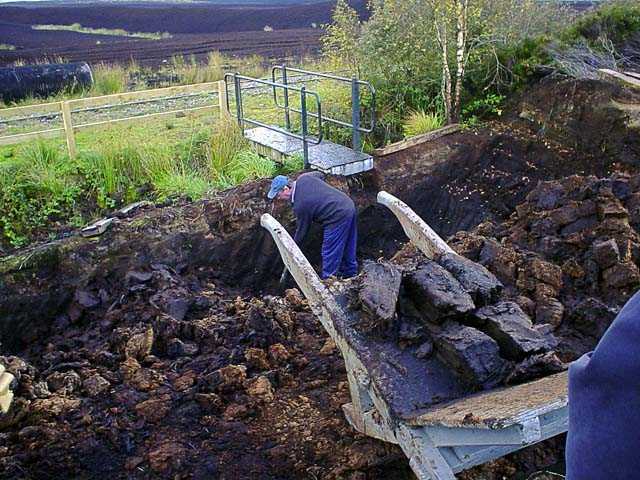 Second it took us out on a real bog that was being worked for the peat. We found it fairly easily. It doesn't seem fair that now that we've figured out how to navigate Irish roads and maps, that it's almost time to go home. 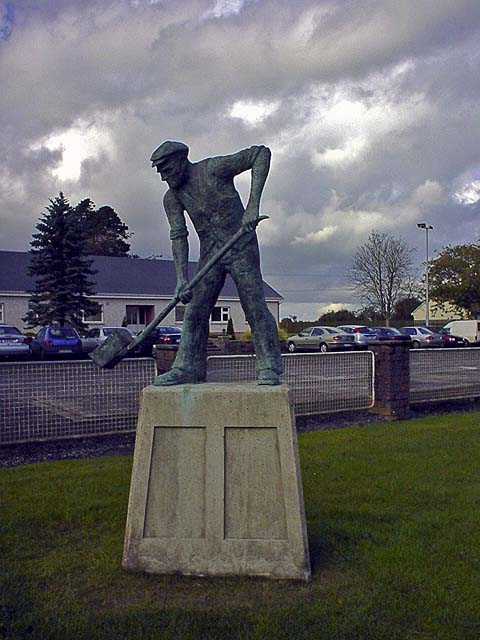 The tour location was well signed and had a large sculpture of a peat hurler out front. Note: the Irish signs along the road for road construction looked somewhat like a man with a hurling stick. We were also amused by the Loose Chippings signs for loose gravel. But we digress, the tour building had some interesting displays of bog oak and things found in bogs, from jewelry to bodies preserved in bog water. We boarded the small train and we were off on the tour. 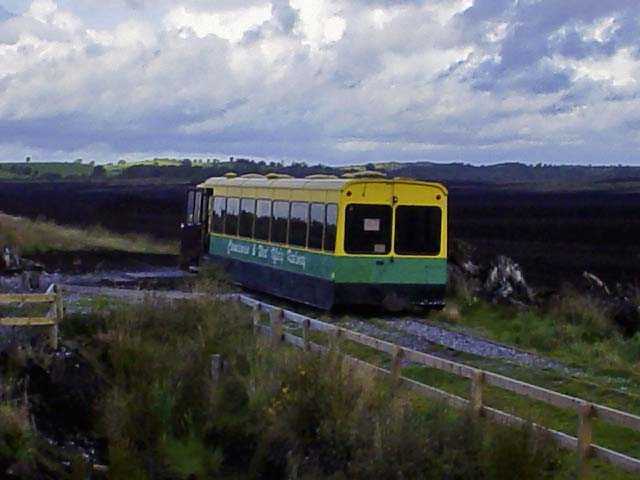 The train circled a large area of bog, much of it being harvested and burned for electricity. We had a chance to try our hand at digging peat the old way. We both declined due to the waterlogged nature of the hole and our clothes. We were shown the oak stumps found in the bog as well as the profusion of plants that grow. Many wild flowers, there is much more life in a bog than one would think. Walking on the bog felt like walking on a giant mattress. If someone jumped a few yards away, we could feel it. It was a strange feeling of not quite solid ground. 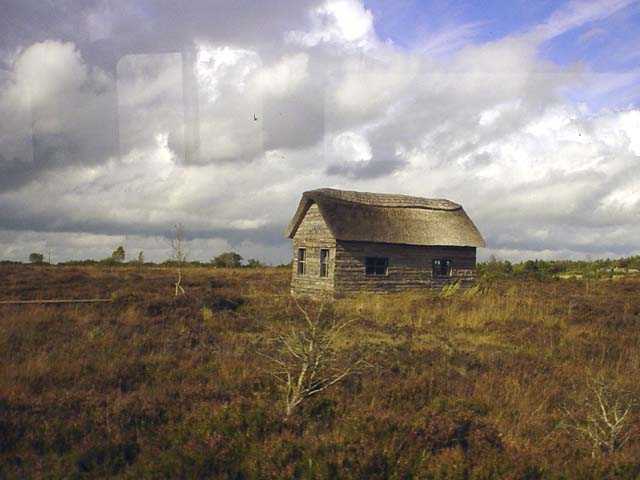 The train passed unharvested parts of the bog and an old house still standing after years of neglect. In the distance you could see a smoke stack where the peat was burned and the smell of burning peat was in the air. Even now that smell can take us back to Ireland. We've considered bringing back a block or two of the compressed peat sold in the markets for home use for a special occasion. We had an all Guinness night where Scott cooked and BBQ'd and all food had Guinness in it. fondue, salad dressing, Ribs in a Guinness marinade and Guinness cake for desert. A block of peat burning nearby would have been perfect. Our Guinness Recipe page might give you an idea or two. You can buy peat incense here. After a brief run through the displays again (they made more sense after the tour), we hopped in the car to return to Athlone. We pulled up the lane to the main road. At the main road Karen was looking at the map to determine the proper direction. Scott looked both ways but more to the right. As we pulled out another car came racing over the hill to the left as we pulled out going to the left. They swerve and so did we but there was some impact. OUCH. We both pulled off the road and got out to examine the damage. No one was hurt, just a bit rattled. Turned out that they were newlywed tourists from Israel. There appeared to be no damage to their car and very little to ours. We exchanged rental company and personal information and got back into the car to continue. Once our heart rates slowed we went looking for food. We found a restaurant called Grogan's that advertised a Carvery Lunch. We'd seen many Carvery signs around, but had not been inclined to eat big lunches (usually sandwiches were fine) because of the large breakfasts. The place looked large, warm and comfortable, which it was. It was nearing the end of the lunch time, but we squeaked in and grabbed a plate. It was pretty much like a cafeteria. You walked down the row and picked your vegetable. Potatoes were a given, but many choices. Some grey peas and carrots, and a choice of lasagna, roast beef or chicken. Huge quantities of food, but we were cold, tired and still a bit damp and shaken. Note: Irish lasagna isn't like Italian lasagna, it usually has cheddar cheese and little tomato sauce. It is more like wide noodles, ground beef and cheese. Not bad, but not lasagna. Returned to Athlone to retrieve the laundry. They did a wonderful job, nicely folded and best of all, smoke free! Drove Northeast up through Kilbeggan, Athboy to Navan and then to Slane. Called along the way to find a B&B, no problem and secured a reservation at the San Giovanni House. 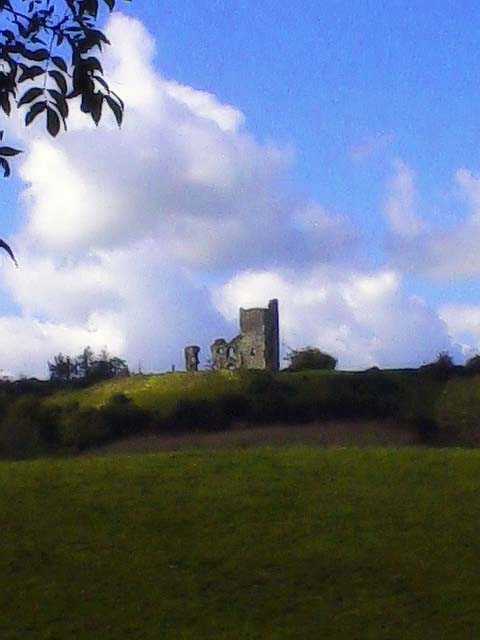 Slane Castle was undergoing renovation so we didn't get to see it except as a drive-by. Had an average dinner in Slane, steak and salmon and then back to the B&B. 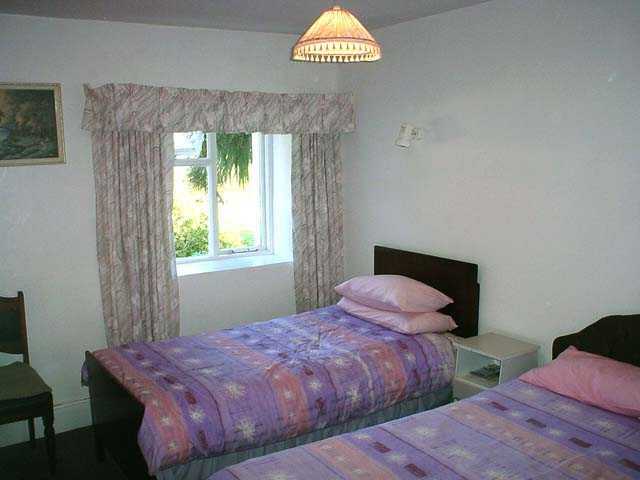 The room was large and nice with lots of woodwork, recent renovation in the bathroom and very clean. Took a more leisurely approach to getting up as we did not have as far to travel and the weather was cloudy. Had a good breakfast and chatted with Himself. Heard a lot of politics and general information about Ireland's current state of affairs. Evidently Karen made an impression because she got a good bye kiss to boot. We packed up and headed off for the Brú na Boinne Vistor Centre. 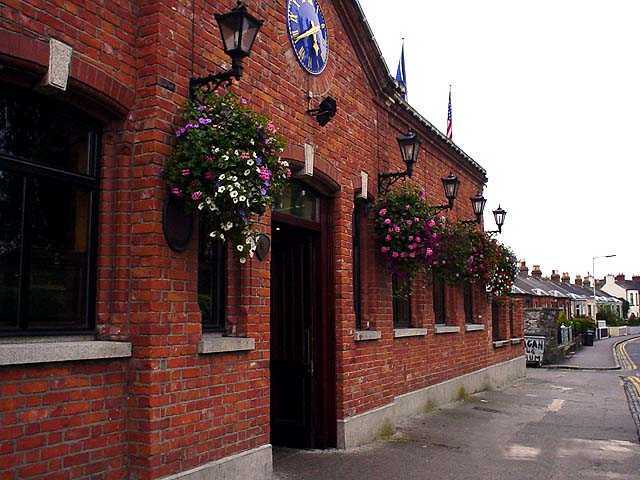 The Brú na Boinne Vistor Centre is a large modern building that houses displays and information about the archeological heritage of the Boyne valley region. 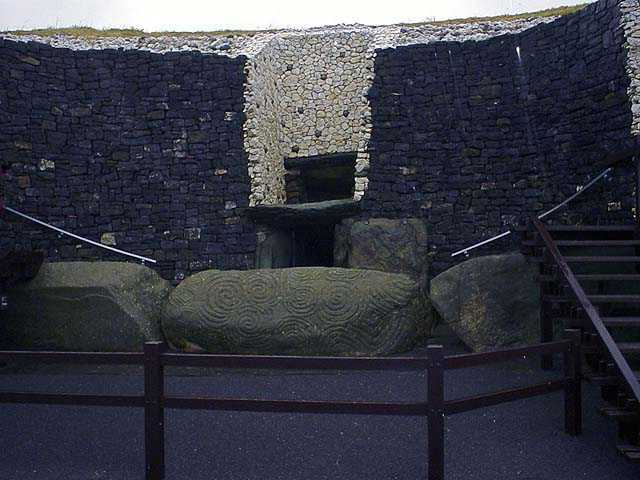 You can purchase tickets for the bus tours to Newgrange and Knowth. You can kill time walking around the center and looking at the displays or watching one of the presentation. There is a gift shop and food area as well. A short walk across a pedestrian bridge takes you to the bus area. There is a semi-covered waiting area. The weather was a bit blustery and cold while we waited. The buses are clean and smaller so you're not with a huge crowd. The bright colored stickers identify the tour you are going on. 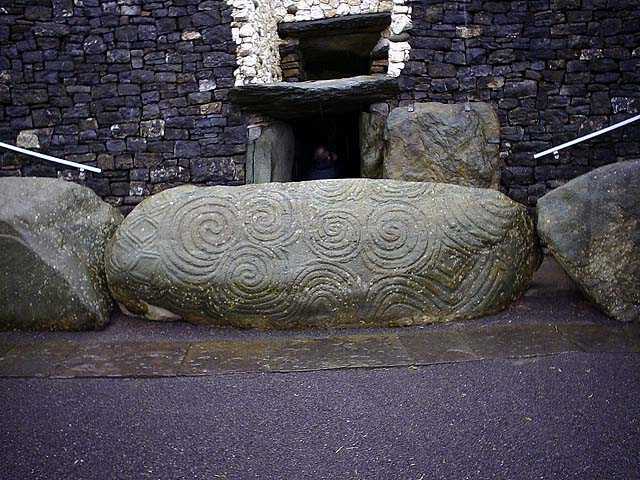 We purchased tours for both Newgrange and Knowth. 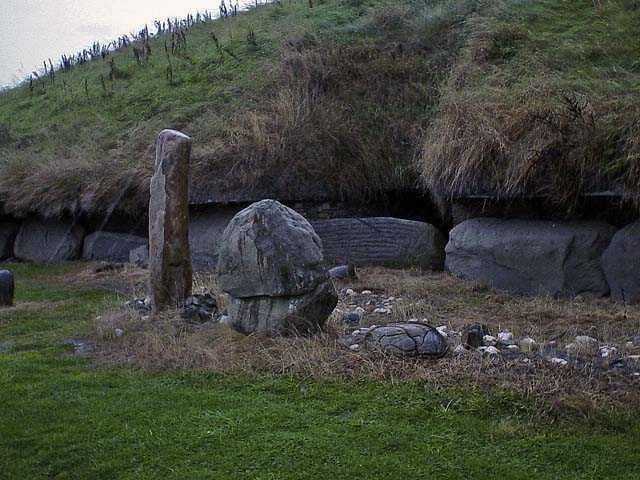 We went to Knowth first. The bus pulled up to a small road area with lots of bushy growth around. We walked up a short path to a small wooden building with a deck area. You could see some of the mounds a short distance away. We had a young and energetic guide who began giving us the history of the area and the mounds. We were able to walk around and between the mounds. They varied in size from small hills to huge piles of rock and dirt. We were able to go part way into the largest and see some of the internal construction. We also examined the carved rocks around the perimeter of the mound. Each was carved differently and we were told on both sides. Considering that the carving was done in the stone age, someone had a lot of patience. 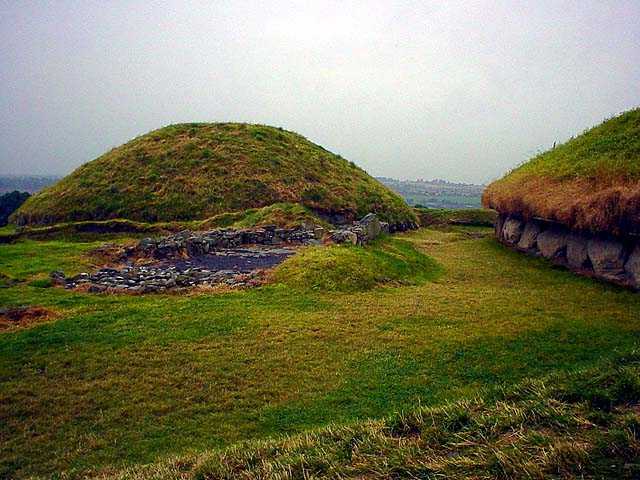 There were also a few standing stones and other remnants of settlement around the mound. We also climbed to the top of the largest mound and had a great view of the valley (amidst the clouds and showers). We had a few good downpours while we were there and there is very little shelter. An umbrella or rain coat would be a good precaution if the weather is threatening. Newgrange was the next stop. It is a much more pristine site. It has a manicured lawn area in front and the grounds are very clean. It is a single large mound that you can go into. Again there was a tour guide who explained the site and its history. 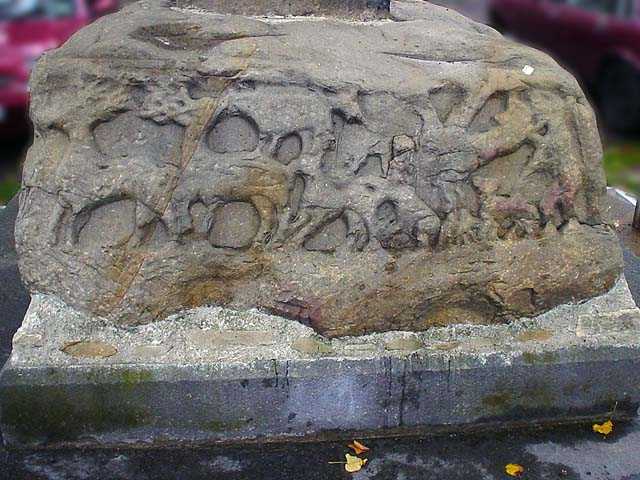 There is a large rock at the entrance with distinctive spiral carvings. Must have been a real effort to move it in place. 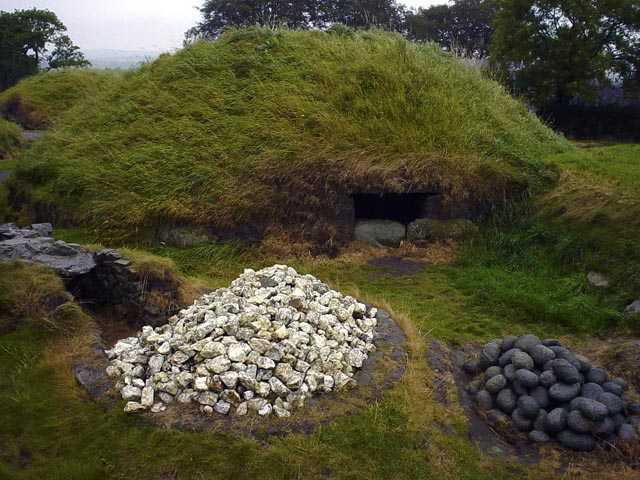 The outer face of Newgrange is covered in white rock and visible from a good distance. Because the site is on a hill you can see a good portion of the valley. We were able to go into the mound to the center chamber and there was a reenactment of what it is like with the sunlight comes down the chamber path and lights the chamber. 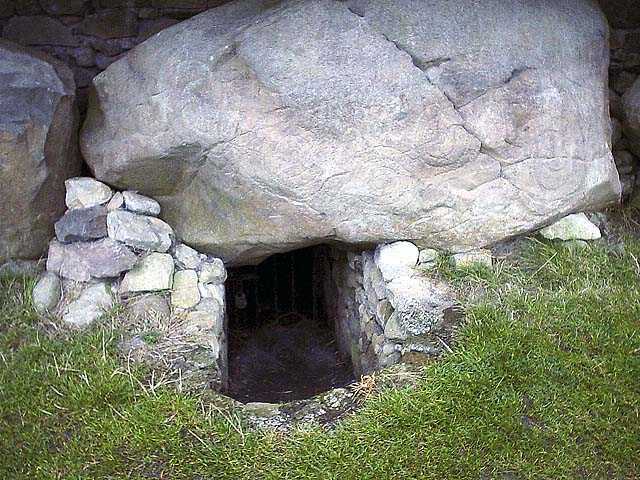 You could see how the chamber was constructed from pattern of the rocks inside. Also interesting was the accumulation of graffiti over hundreds of years. We are not the only derelict generation. We didn't add anything to the walls and walked back out and took a walk around the circumference of the mound. It also has carved stones and is quite large. The weather soon drove us back to the shelter of the bus and we returned to the Brú na Boinne Vistor Centre. 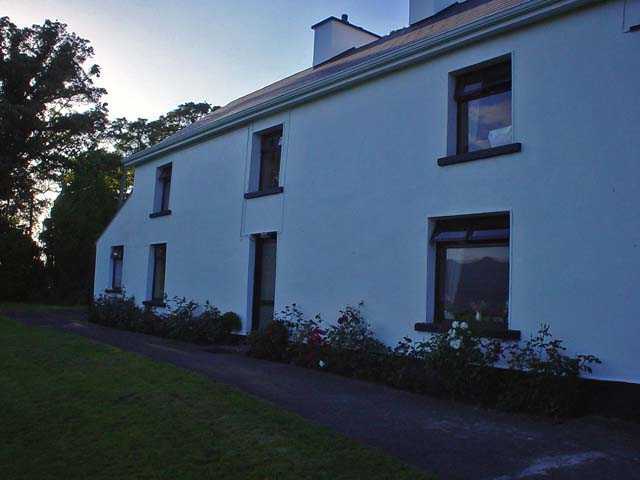 We called ahead to Kells looking for a B&B and found one called Teach Cuaigne B&B. Accommodations assured we drove towards the town of Kells. We arrived just as school was letting out. A gaggle of uniformed school girls, buses and parents slowed traffic to a crawl. We didn't know we were sitting right next to a nice graveyard (we found it next trip). 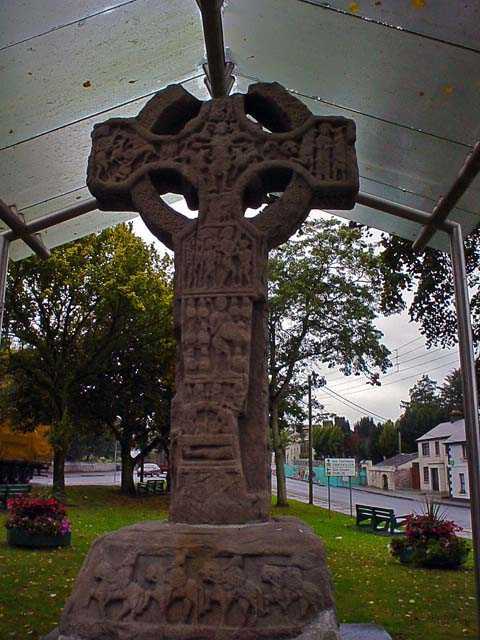 We found the Kells Heritage Centre by the (replica) of a high cross in front. After some admiring and picture taking we went over to the Heritage Centre, paid the fee to get in and found that the cross in front was a replica. The Heritage Centre had some interesting items and information, but overall we found it a poor value for the money. 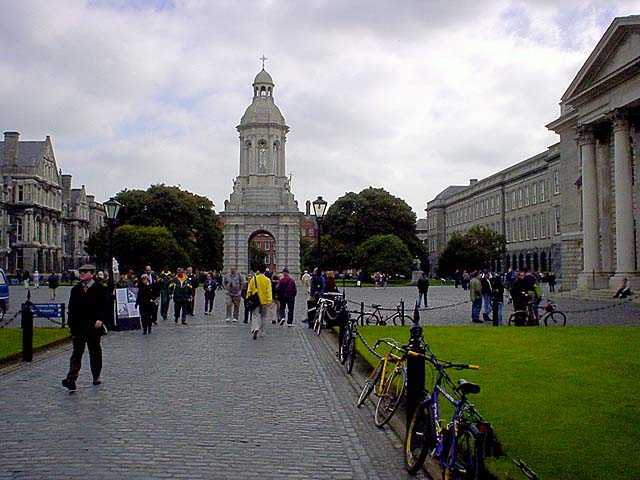 There is a replica of the Book of Kells as well. Actually replica pretty much sums up the experience there. We found the gift shop more entertaining and bought a few items for friends. We left the Heritage Centre and went in search of Teach Cuaigne B&B. We spent the evening repacking and getting rid of items we didn't want to cart home. We had a lot of stuff spread over the bed, but somehow managed to get it all packed up. We definitely need to invest in better travel bags. We dined on leftover snacks and Club soda. We were hungry in the morning because of the snack and sugar laden dinner. 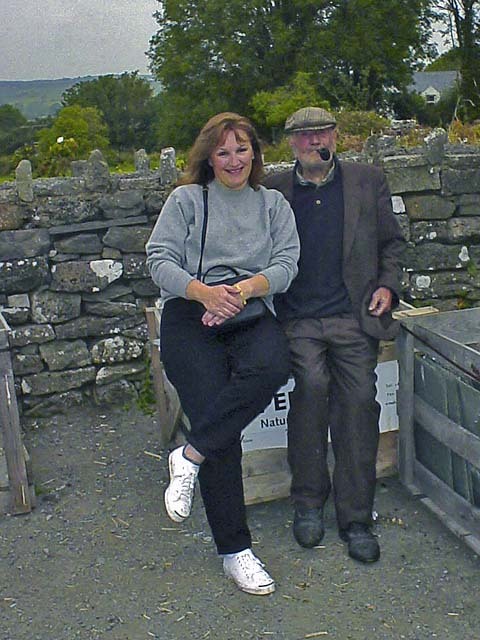 We had the usual full Irish breakfast and well fueled we loaded our bags into the car. The morning was clear and bright, the sky was blue and clear. 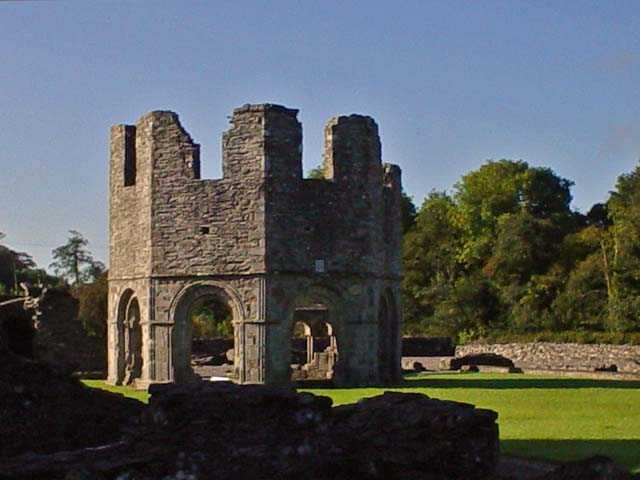 There was a bit of chill that rapidly diminished as we drove through winding back roads towards Mellifont Abbey. 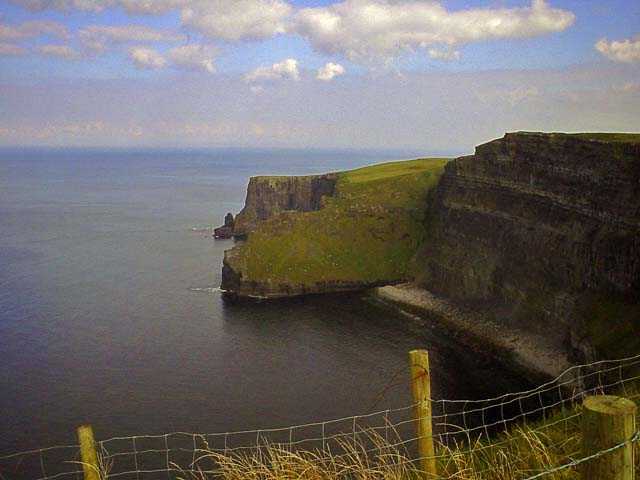 10km from Drogheda, take the R168 Drogheda to Collon Road. 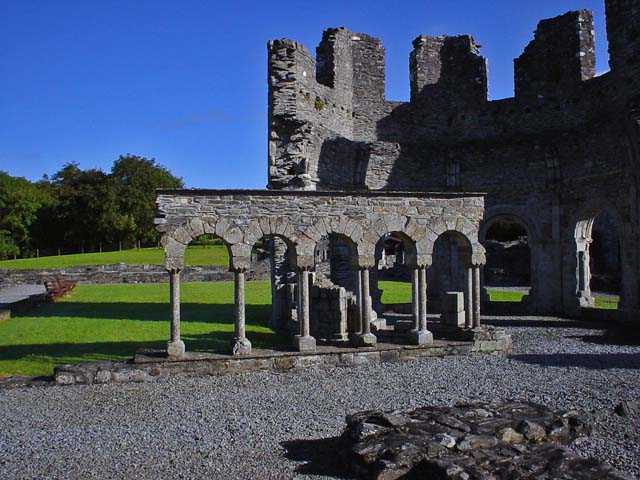 Old Mellifont Abbey is situated 2km off R168. We arrived early at the site, before 10am. The site wasn't officially open until 10am, and we puttered around looking at the ruined entryway. It had wildflowers growing from sections. We couldn't see much of the actual site down lower and we waited a few minutes until we were admitted into the small visitor center. There is a very modest fee to view the site. The visitor center has a display of column and building carvings that have fallen off the ruins or been excavated. These are displayed with information about their original position. There is quite a bit of additional history and information about the site. The man running the center was helpful. We accessed the restrooms (clean), and wandered down into the main portion of the site. 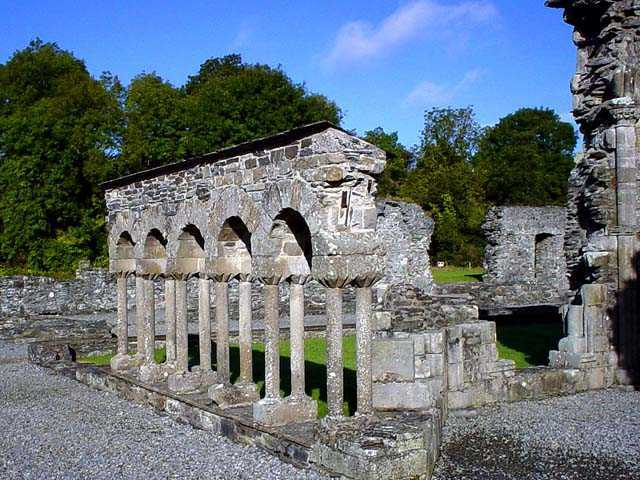 Mellifont Abbey, founded by Saint Malachy in 1142, was Ireland's first Cistercian Monastery. There are a variety of buildings on the site from foundations outlining the building to fully roofed chapels. The most striking features are the arched sections of wall the octagonal Lavabo. The octagonal shape is unique, and we had not seen the shape in any other ruins. 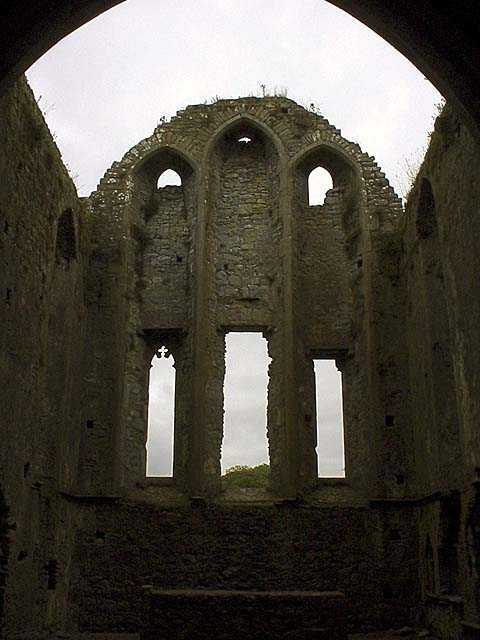 The arched columns were much lighter in weight than other sites and almost looked to delicate to have survived. There was great lighting, and the clear skies and bright grass contrasted nicely. We wandered through the different buildings and took many pictures. The site was very accessible. There was nothing to stop you from close up examination of details. We only ran into a locked area at the small chapel. We suspect it had not been open yet. We were able to see through the gate and didn't feel we missed anything major. If it had been a bit later in the morning and the grass and bushes dryer, we would have wandered around the countryside more. Everything was quite damp from the recent rain and dew. This is a site we'd like to visit again, one of the better of the many we explored. We were the only ones there the entire visit. We suspect that tour buses show up at some point during the day, but the roads were remote and narrow so there may not be many buses. 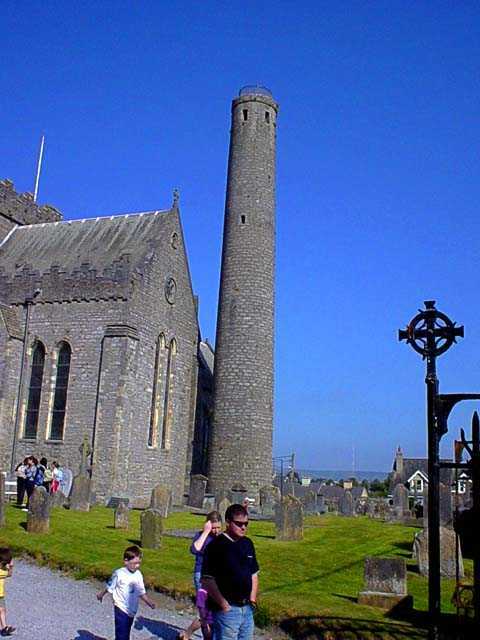 We piled back into the car, checked the map and went in search of nearby Monasterboice or Monasterboyce (seems to be spelled both ways, the first being more common). 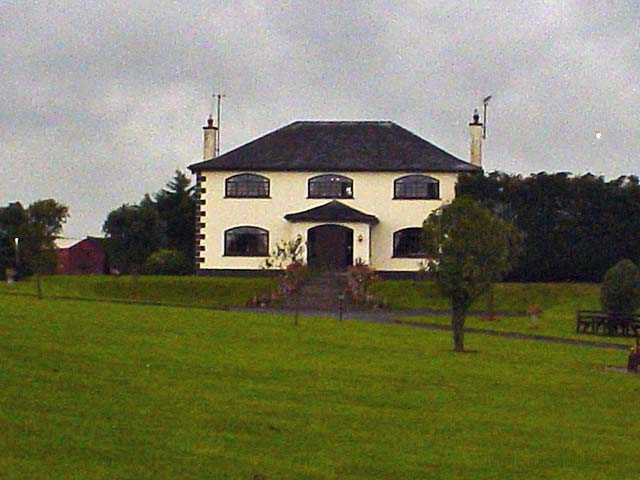 It is located about 2km from Edenderry, and only a short distance from Mellifont. 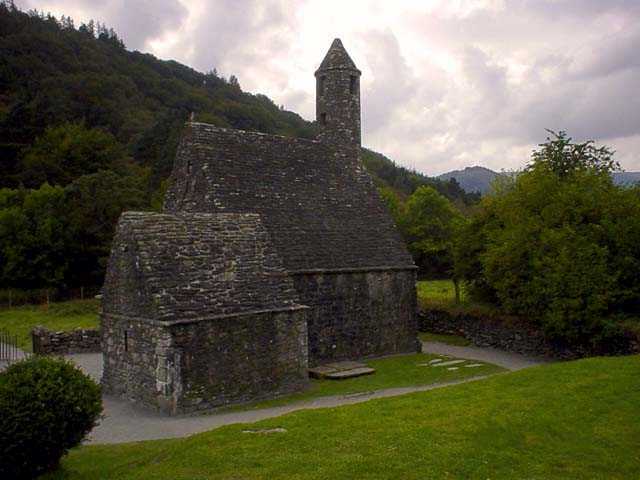 This is one of the oldest monastic settlements in Ireland, dating back to the 5th century. 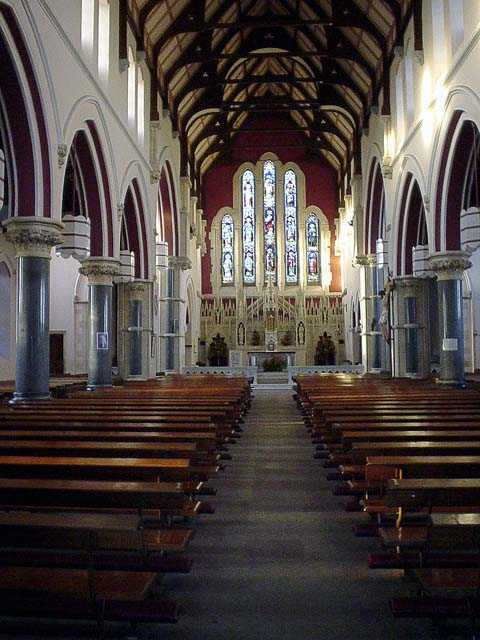 The monastery was built for the Franciscans by John de Bermingham. 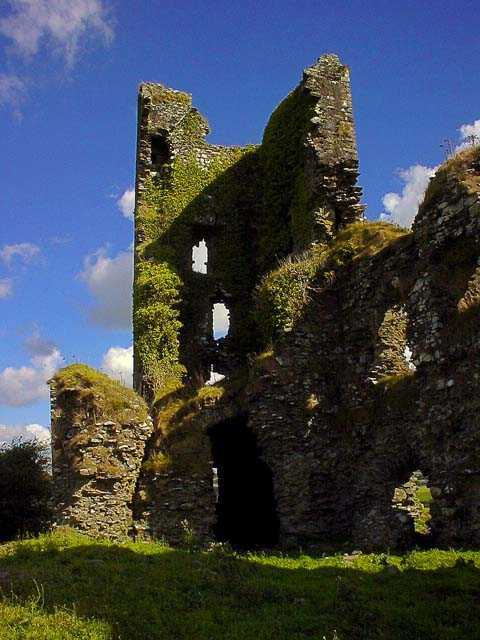 Apparently his conscience was troubling him after his father had massacred thirty two local chieftains at Carrickoris Castle. There is surprisingly little information we could find about the site. This is surprising because of the many high crosses at the site. There is a small parking area across from the site. The site is surrounded by a low stone wall with a stile. There was a locked gate, but no one around to unlock it or instructions as to what to do. We did what the Irish told us to do, hopped the gate and went in. Actually there wasn't even much hopping. The view immediately to the left was spectacular. Green fields, trees and emerald hills against a bright blue sky. The site is more of a graveyard and less of an actual monastic site. 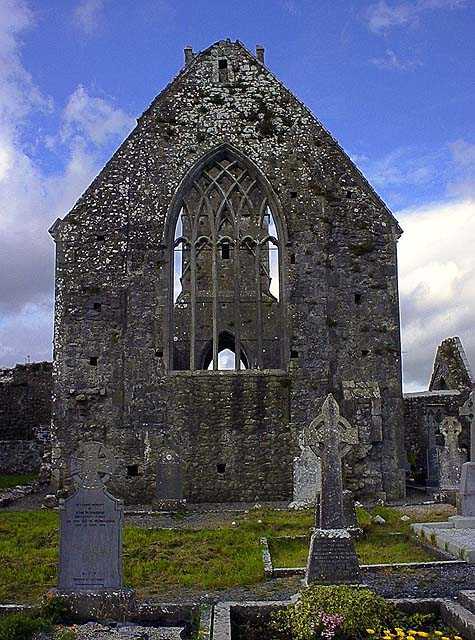 There is little left of the buildings except a chapel and an intact round tower. As we walked through the graves, flocks of crows came and went from the tower and circled overhead. 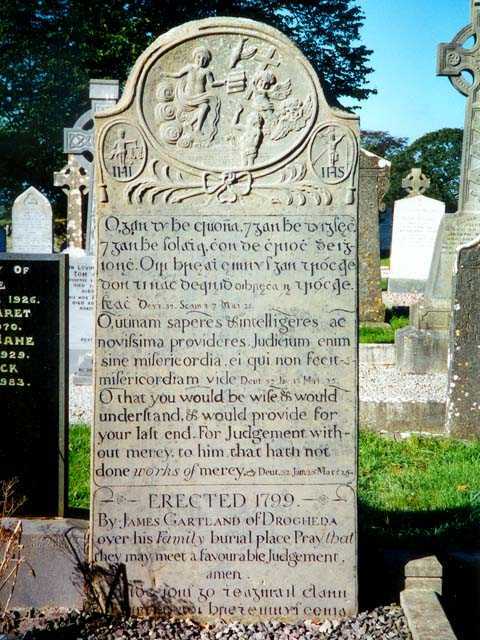 There was a range of dates on the graves from fairly recent to so old you couldn't read the stone. Many of the other graves had finely carved headstones. It gave us a real feel of history to read some of the inscriptions and dates. 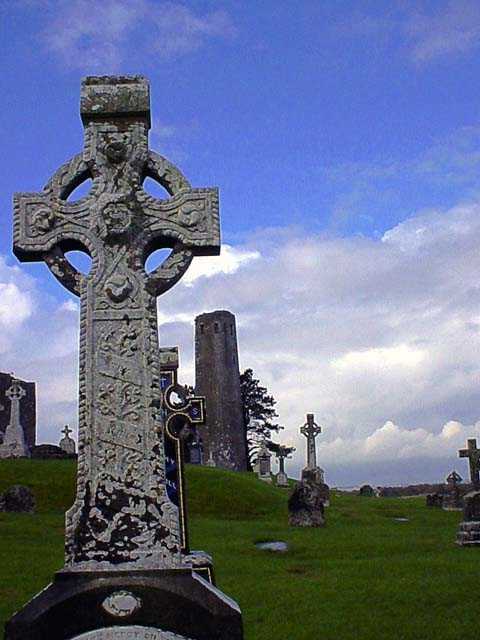 The three high crosses are well carved and full of detail. 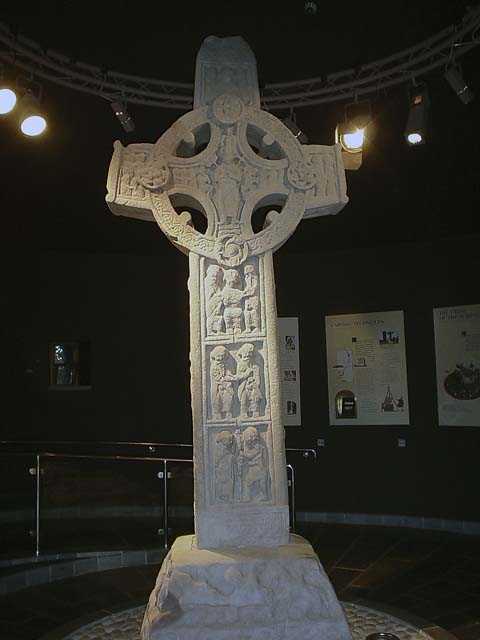 The best of the three is the Muiredach cross. 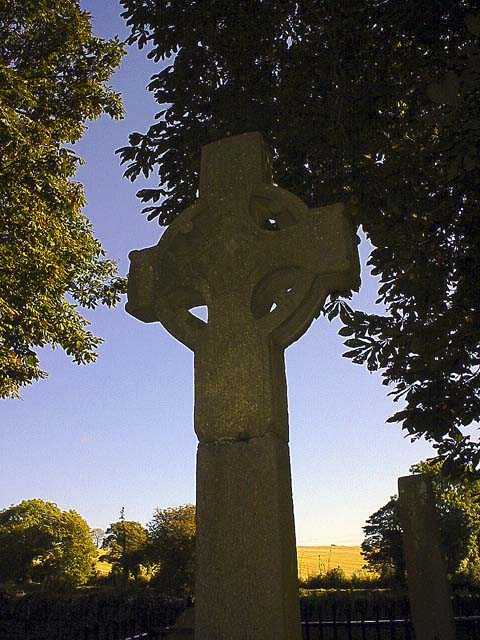 Muiredeach's Cross dates back to the 10th century when it was built in honor of an abbot that lived in the monastic site at around that time. Signs nearby help interpret the scenes on the crosses. For an illiterate people, these functioned as reminders of specific scenes or stories in the Bible. 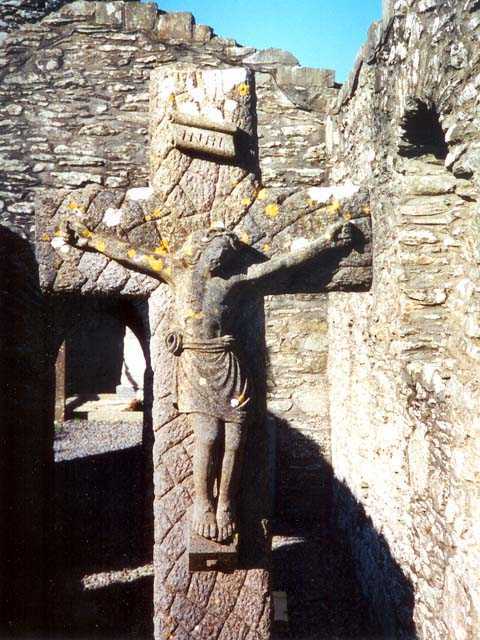 The crosses were most likely painted, although no trace of paint remains. 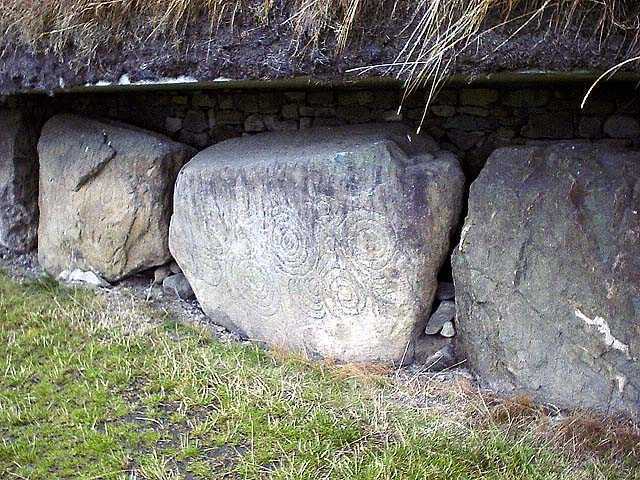 As far as we could tell these are the originals, not replicas as we saw at Kells. 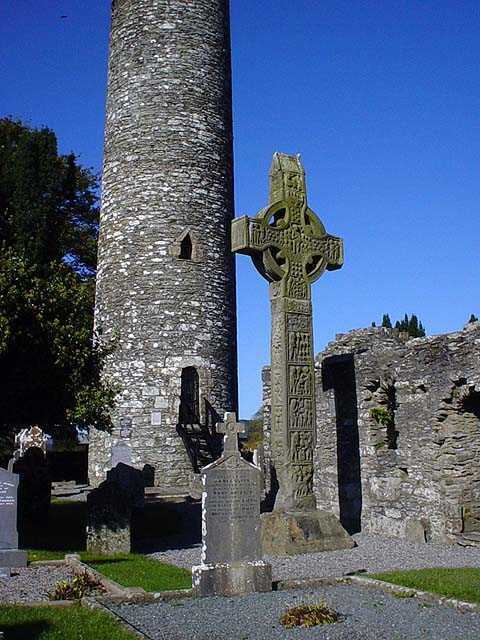 The round tower is very intact and looks like it will be there for many more years. 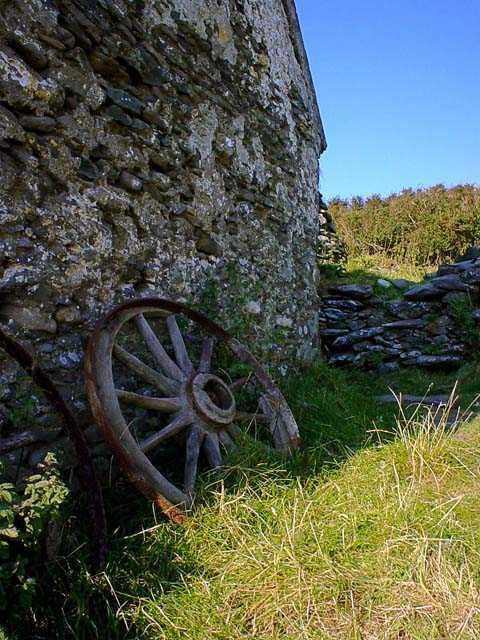 The grounds are well kept and apart from hopping over the stile, it is easy to walk around the site. There are many helpful signs to give more information on dates and history. We only saw a few other people that arrived about an hour or more after us. The site is quite large but densely packed with headstones. There are also quite a lot of trees in the site which is unusual, but makes it a much nicer place. 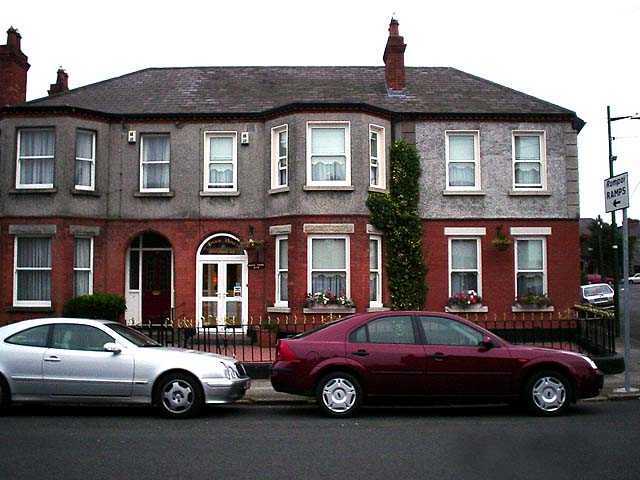 Returned to Avoca House B&B in Drumcondra. Took another run into Dublin to do some last minute shopping. Reexposed to Lush and had to spend some time recovering from the olfactory assault. Had a great pint in some small hotel pub in city center. We'll have to find it again. Small and dusty with character and characters. Restrooms were down two flights of stairs, well below street level and very old. Probably poured one of the best pints we had the whole trip, but it might have been our sadness at having to leave the next morning. We took the bus back to Drumcondra. No problems now, we're old hands at the routes and bus numbers. We made a quick run down the street to an off-license to pick up some scrumpy. They had two kinds in 4-packs so we bought one pack of each. This added some bulk and weight to the luggage, but we made it fit. 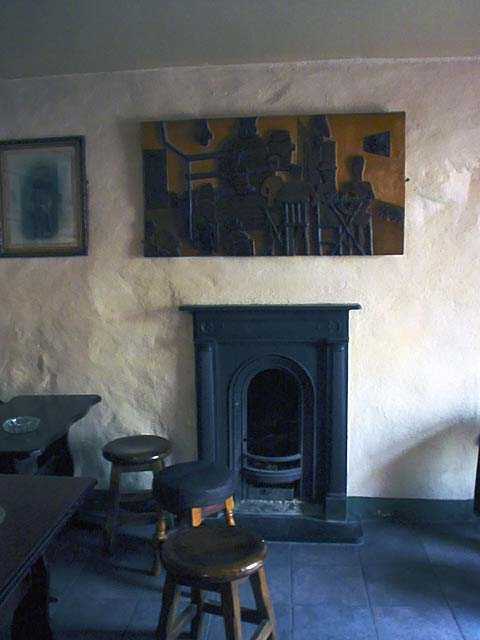 A final visit to Fagans for dinner left us even more nostalgic. Scott ordered the chicken curry and asked the waitress to make it as hot as possible. She looked skeptical and he reinforced the request with the challenge "hurt me". When the curry came, it was about a medium heat. Certainly the hottest food on the trip, but not enough to raise a sweat. We'll have to remember the hot pepper and sauce next trip. Played a little cribbage and returned to the room for final packing. Reluctantly said goodbye to Jack and Audrey as we had to be up in the wee hours to get to the airport. No full Irish for us, seemed a shame that we couldn't finish the trip with a hearty breakfast. All packed up, so off to bed. No breakfast in the morning as we had to get up early and return the car and catch our flight. It is better to book your flight a bit later in the morning or at noon to avoid those early scrambles. Flew out of Dublin to Portland, OR with little incident. Had to report the minor scratches to the car from the run in by the Blackwater Bog, but it only ended up costing us about $75 US.